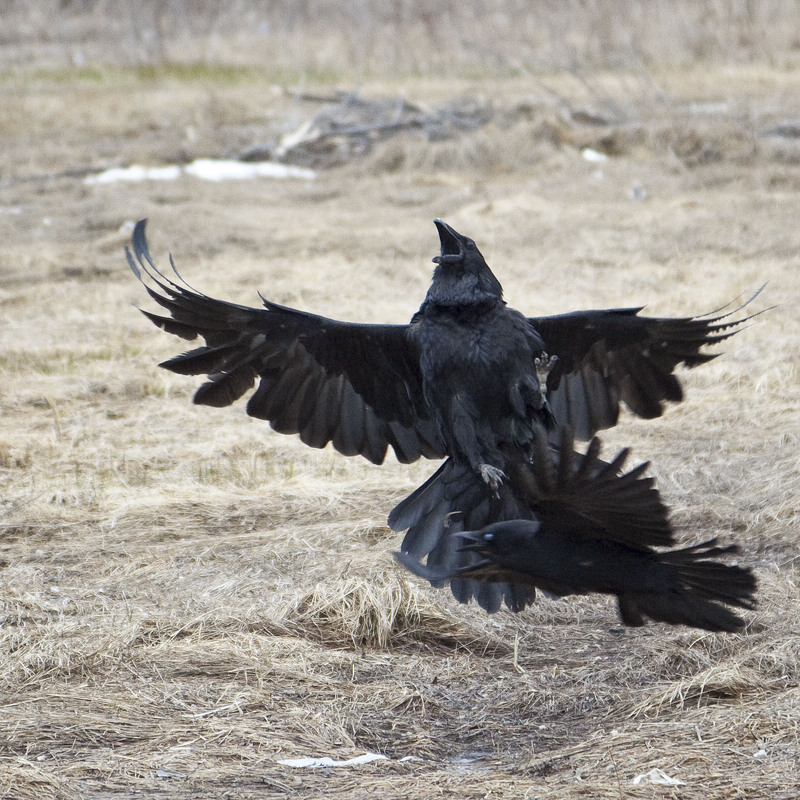 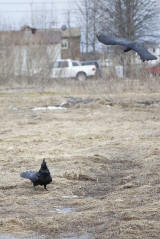 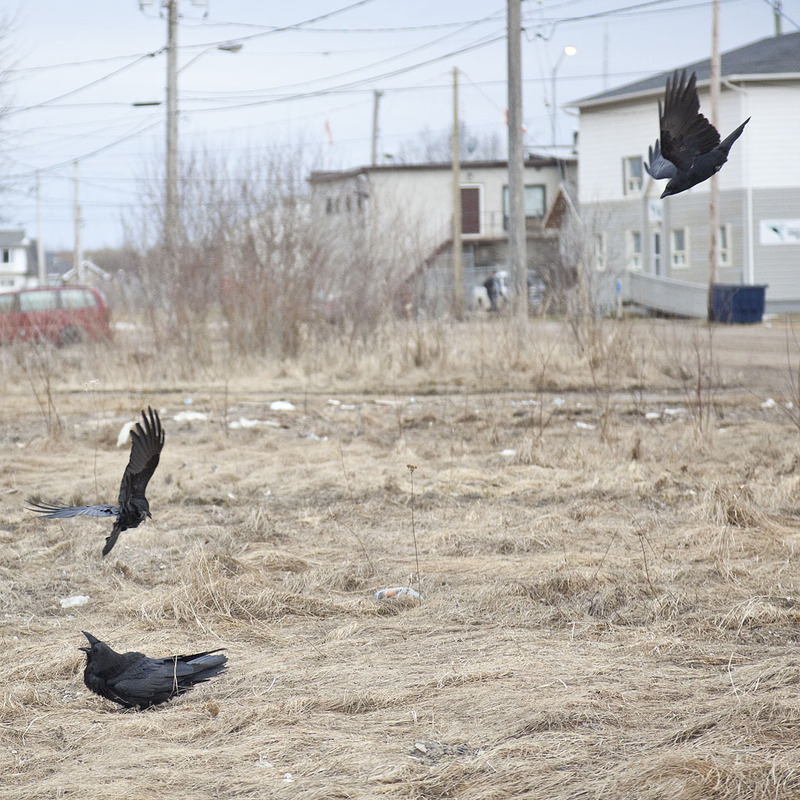 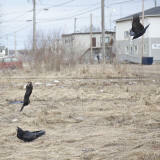 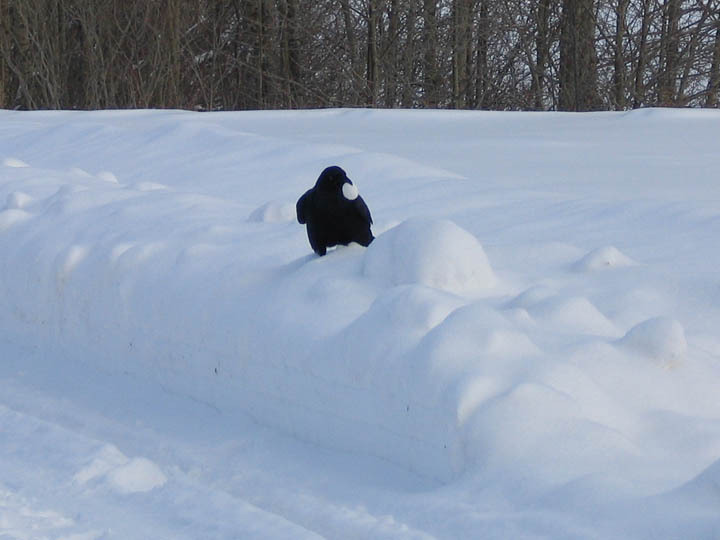 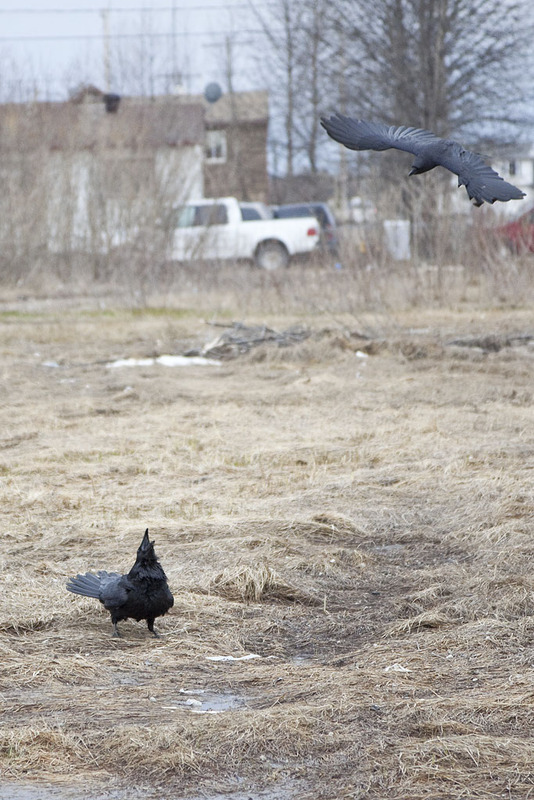 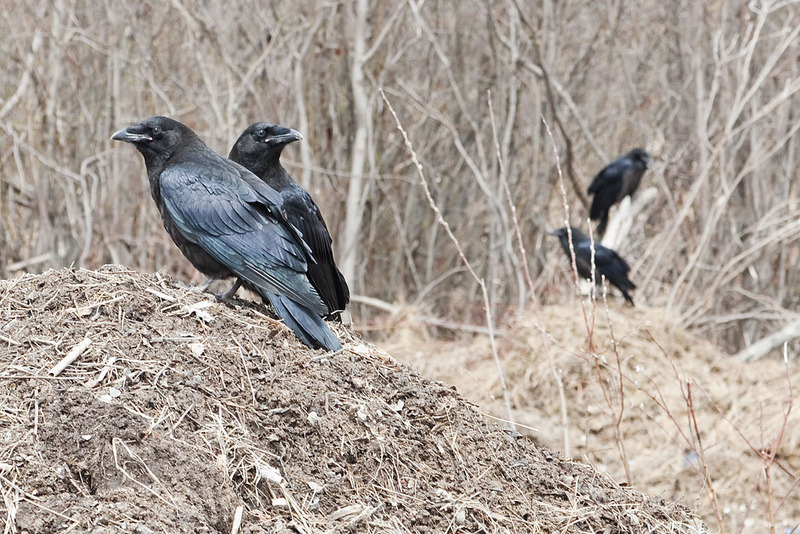 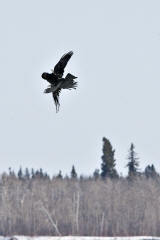 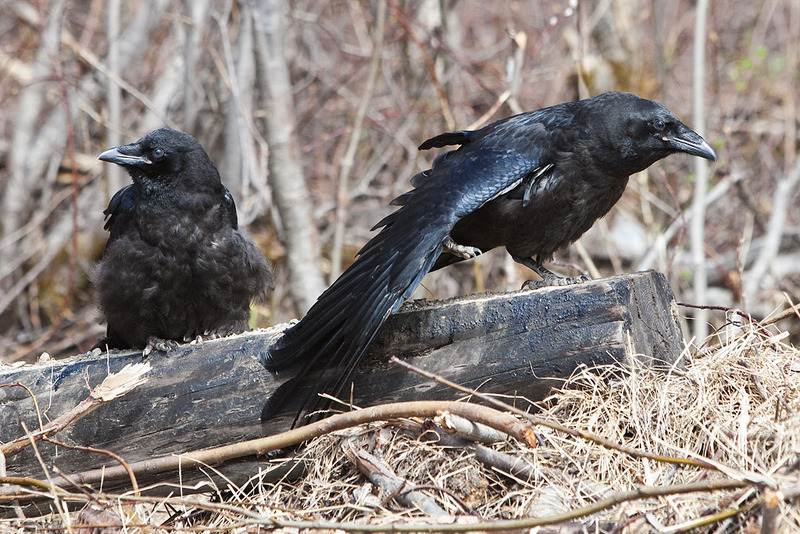 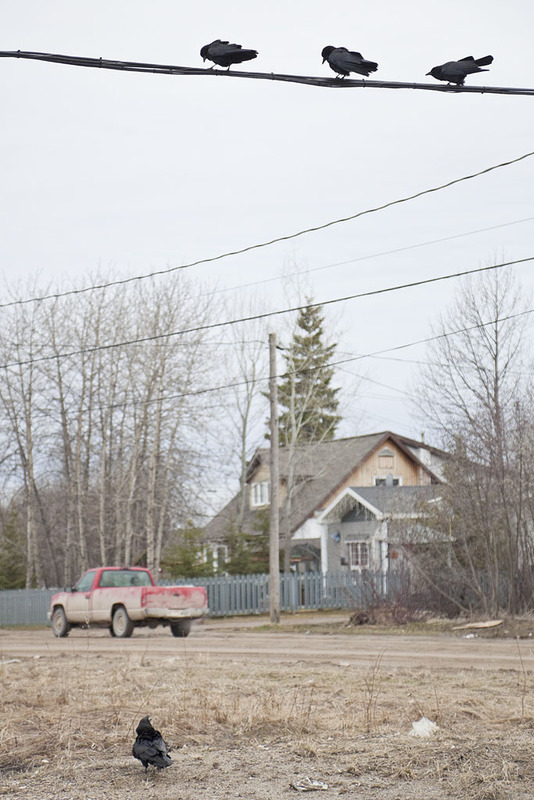 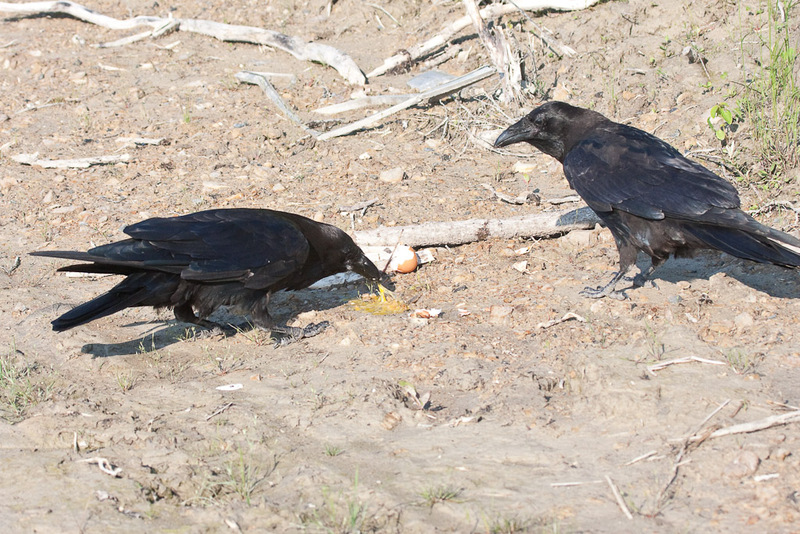 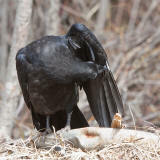 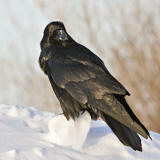 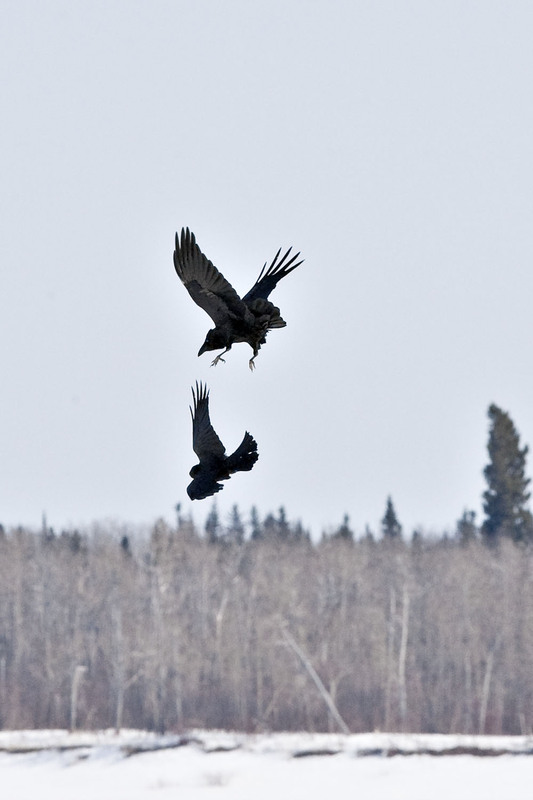 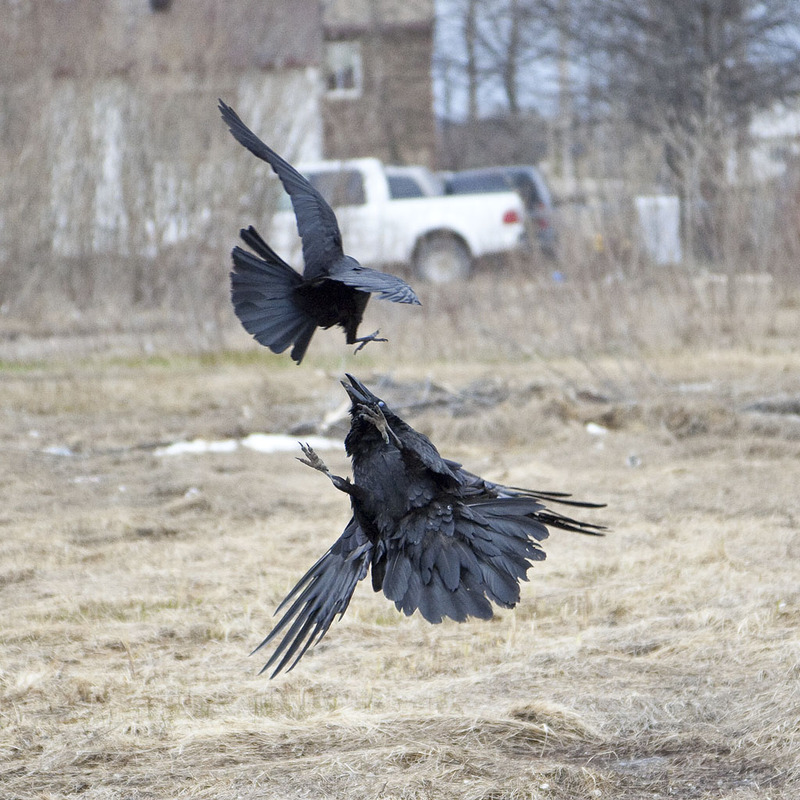 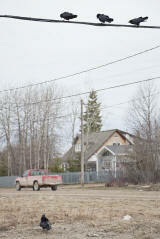 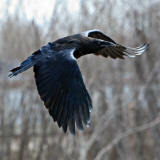 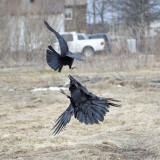 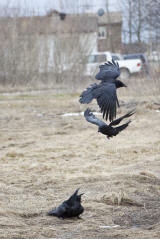 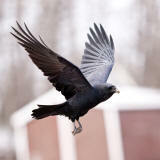 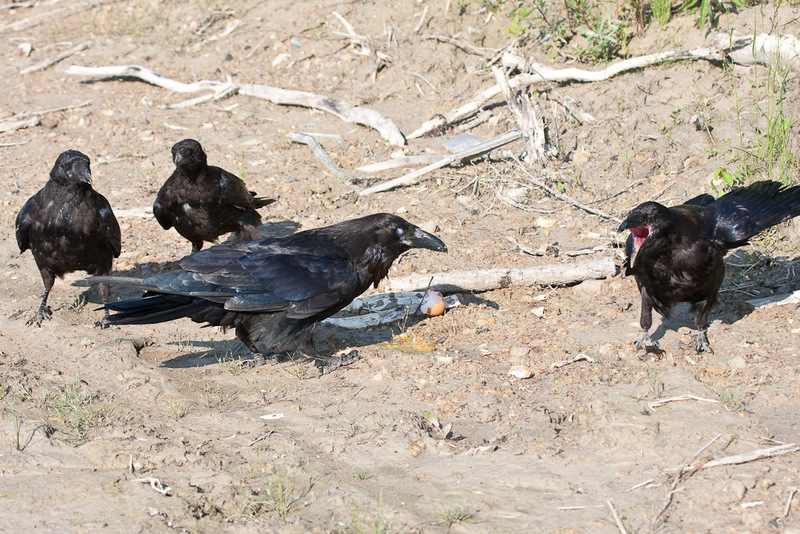 Ravens (Corvus corax) in Moosonee, Ontario. 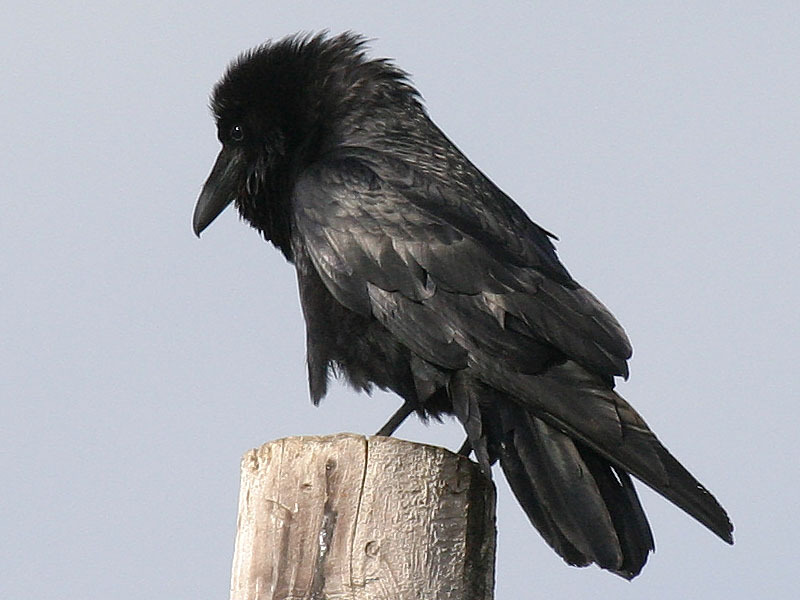 Ravens are the largest of the passeriformes or perching birds. 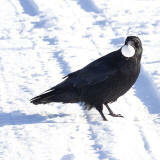 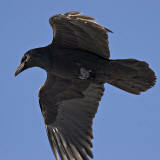 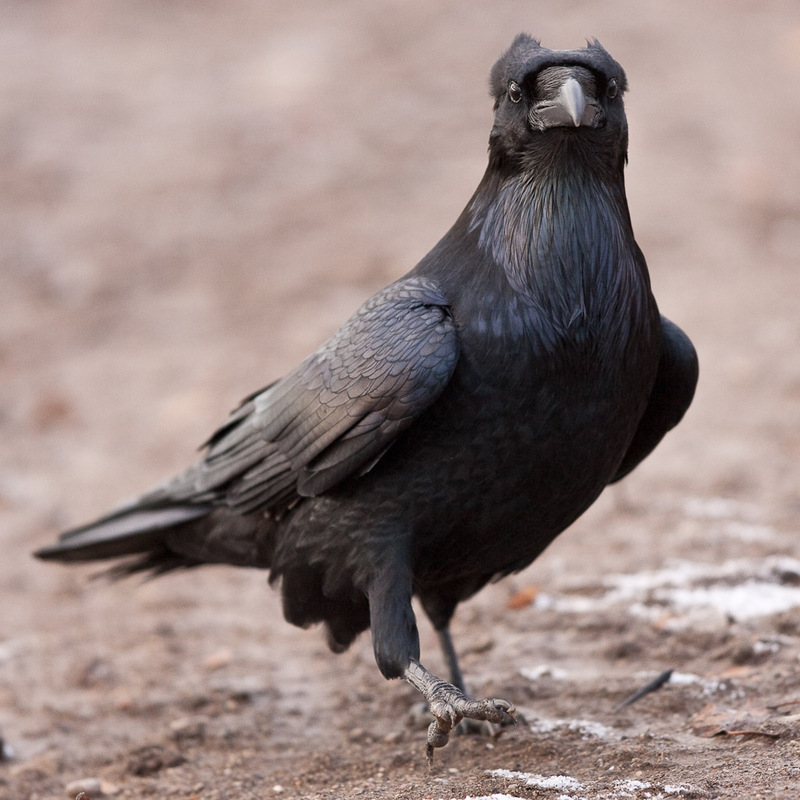 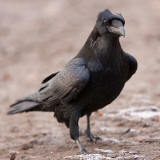 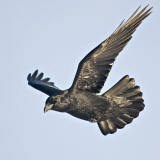 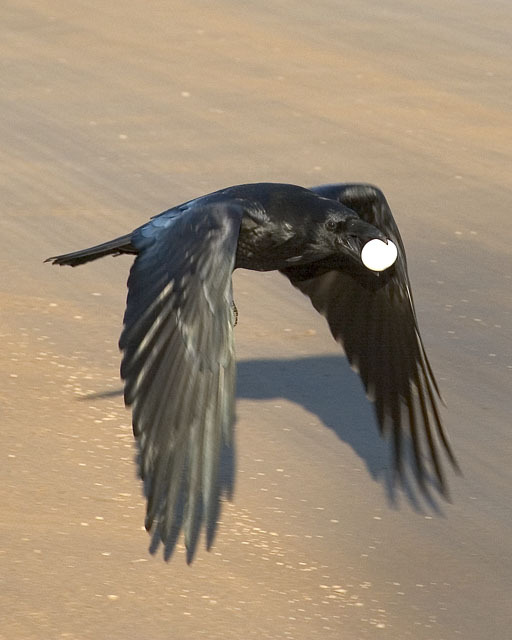 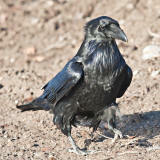 They are also the largest of the corvids, a bird family that also includes crows and blue jays. 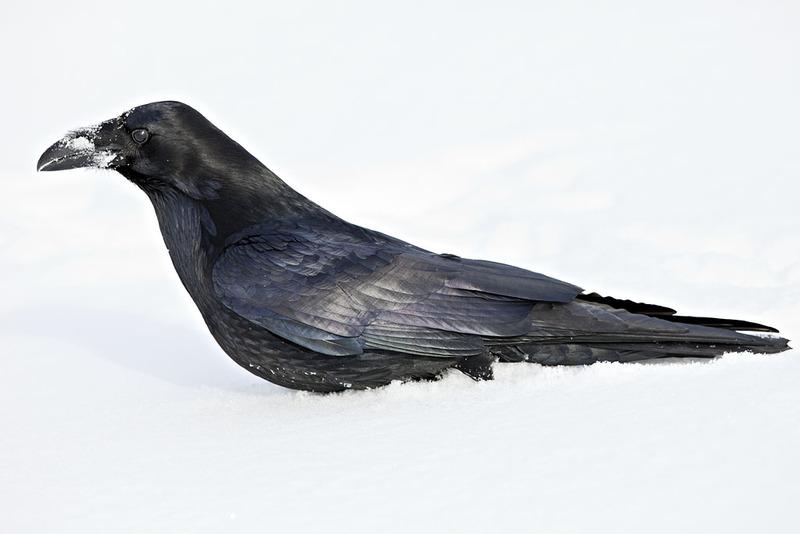 They are common in Northern areas where they remain all winter. 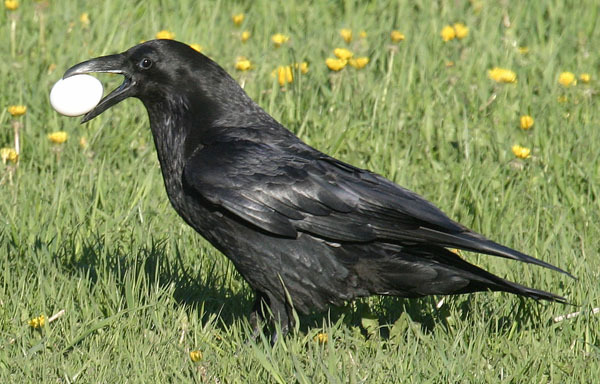 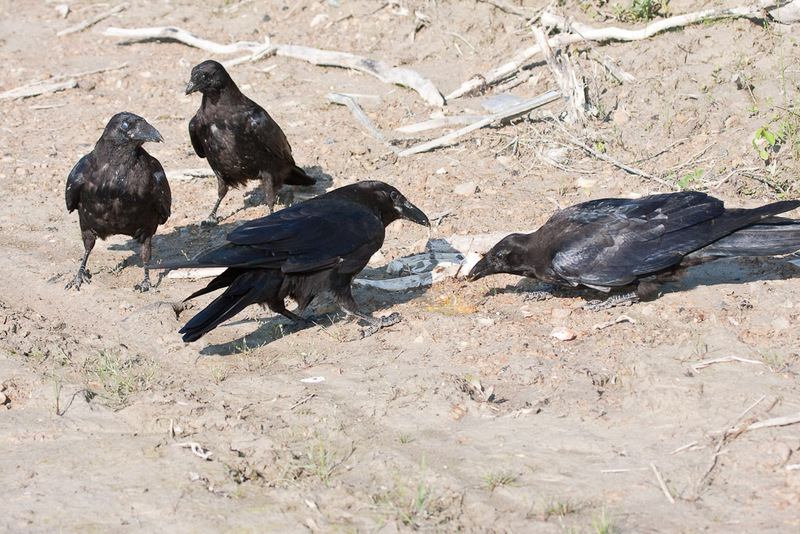 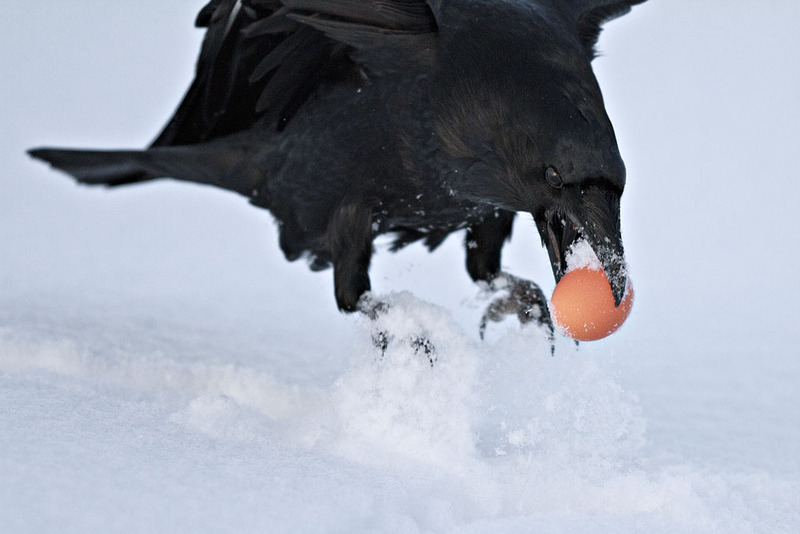 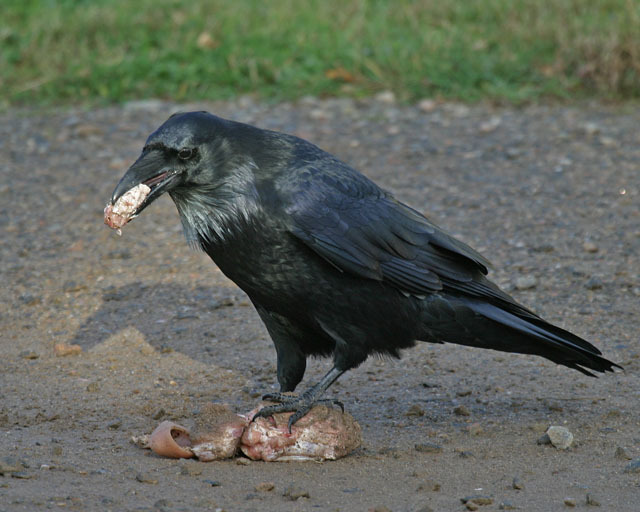 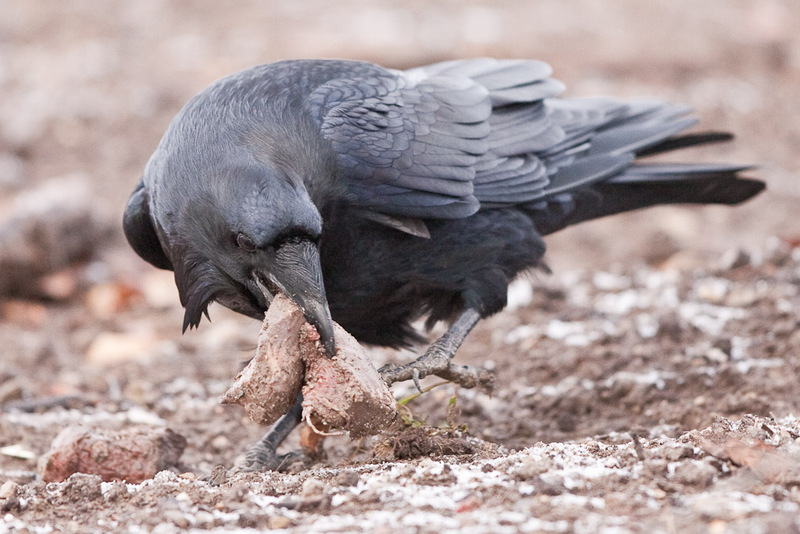 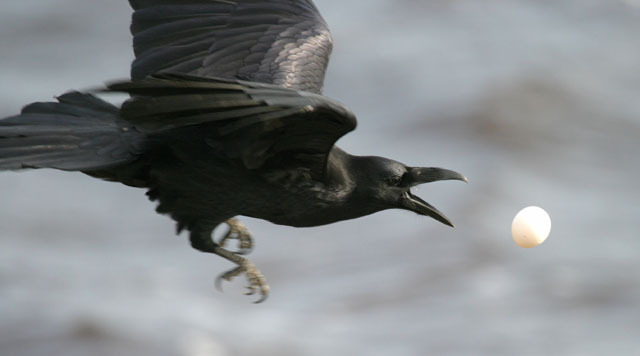 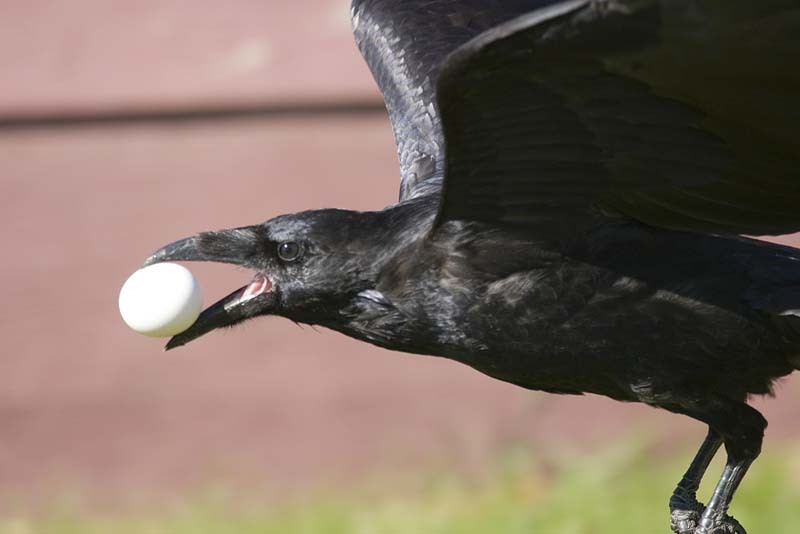 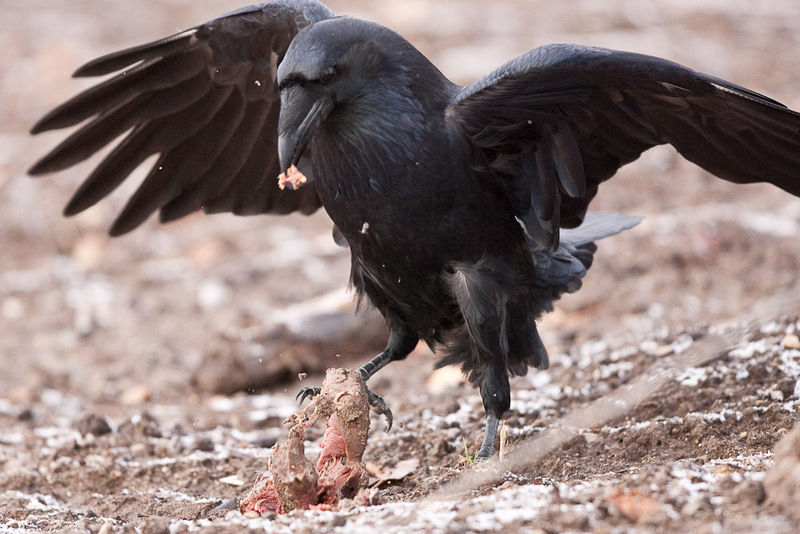 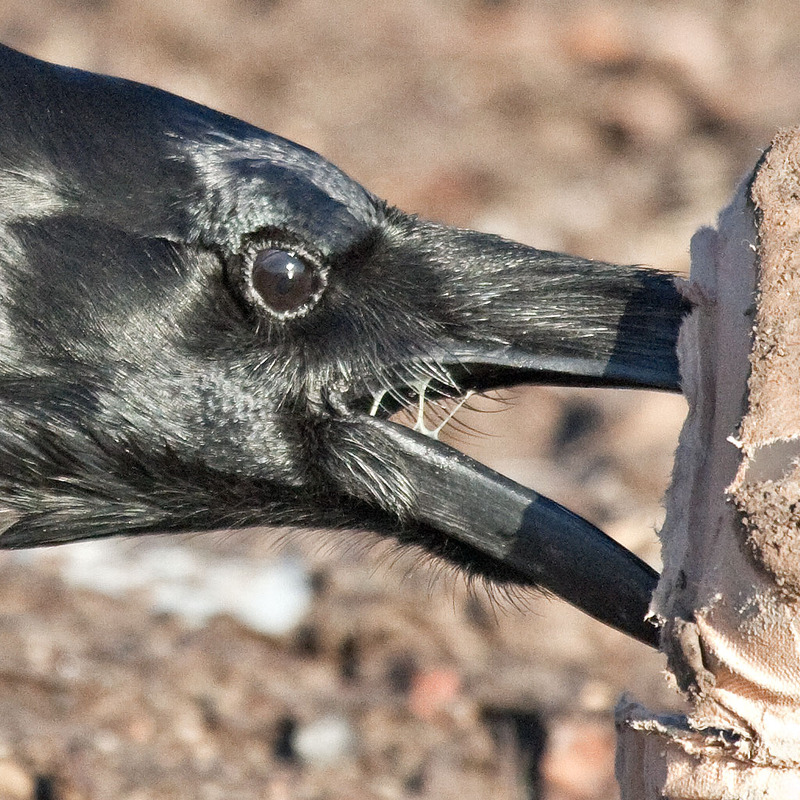 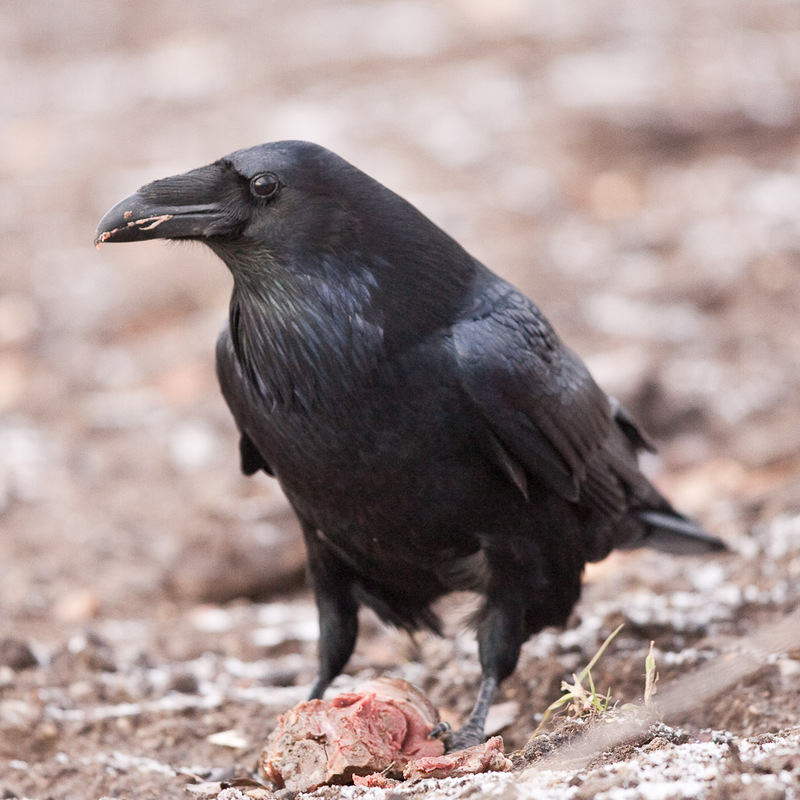 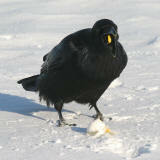 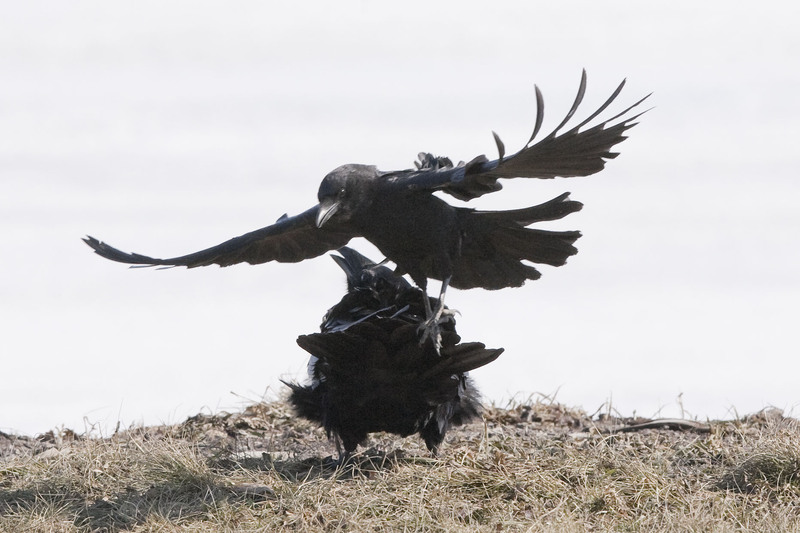 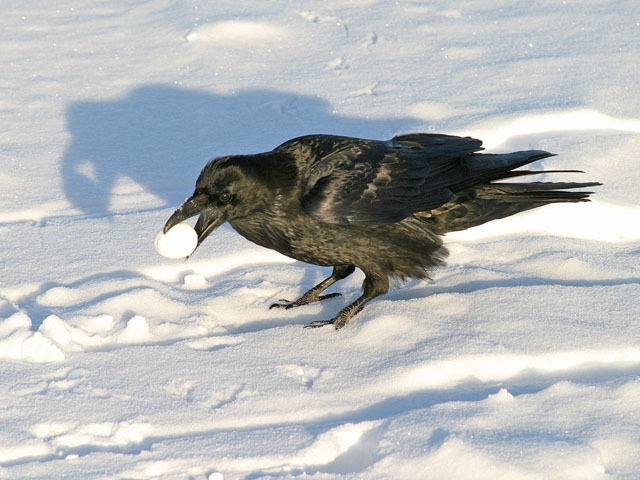 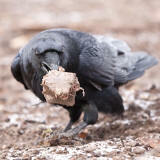 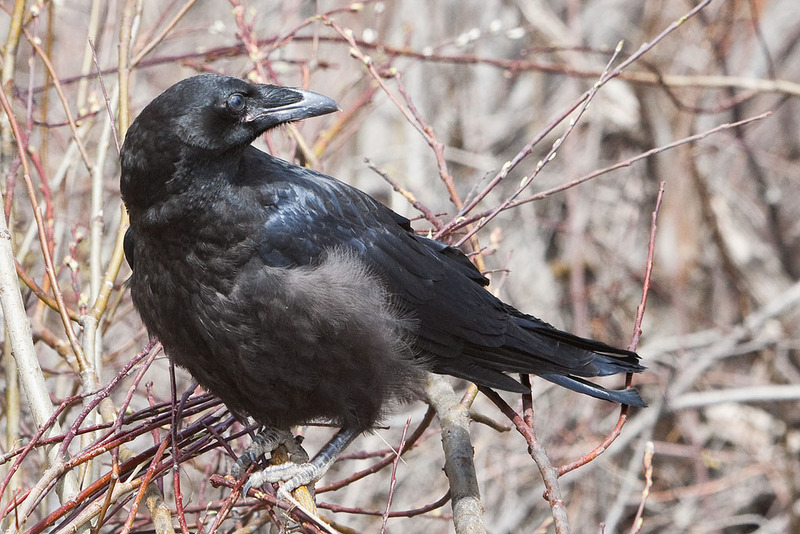 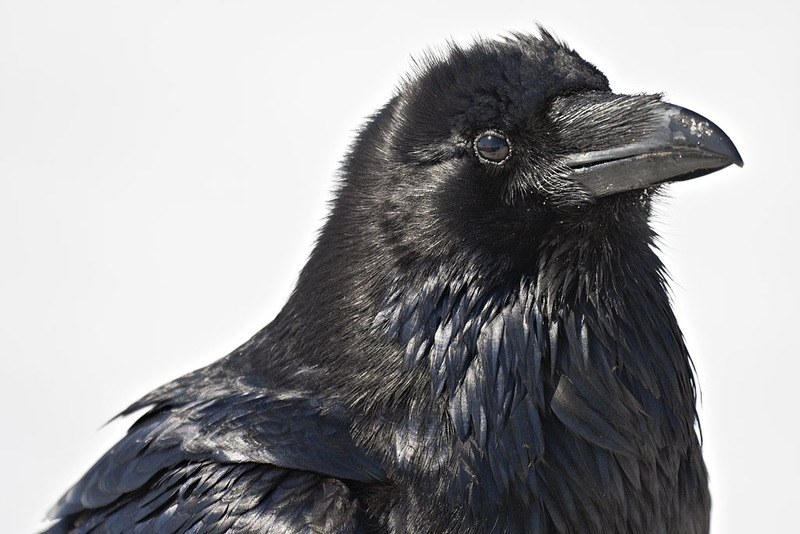 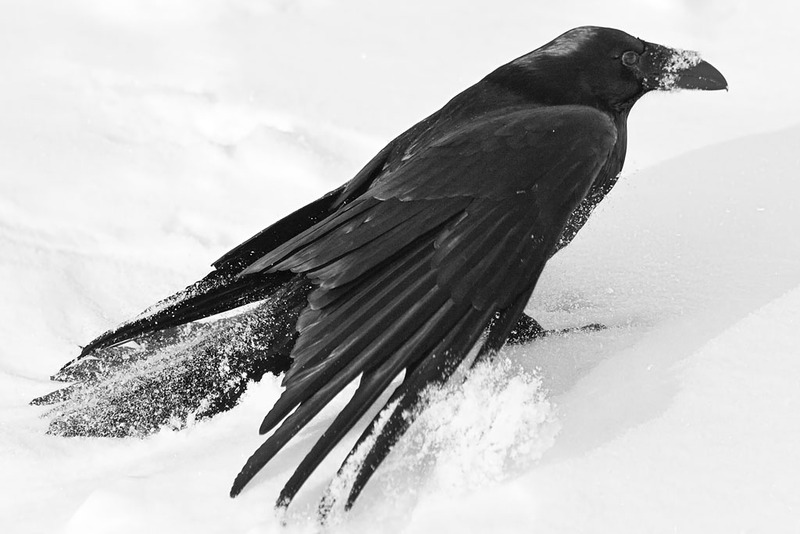 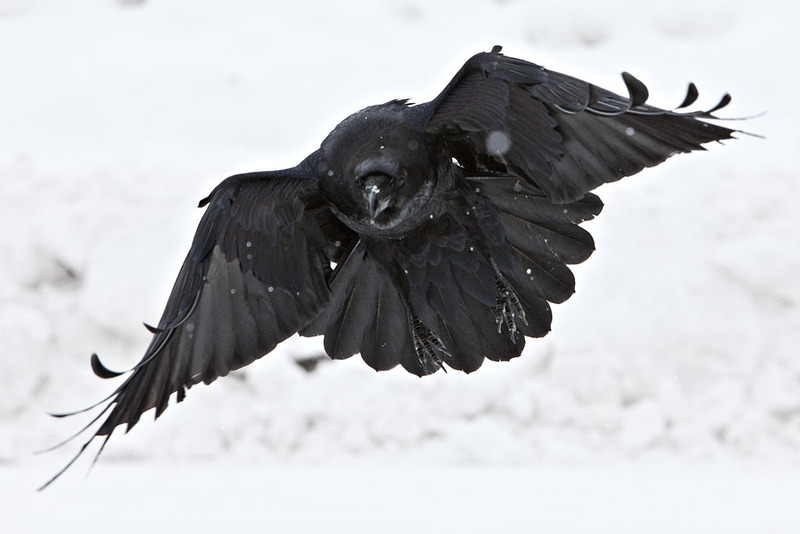 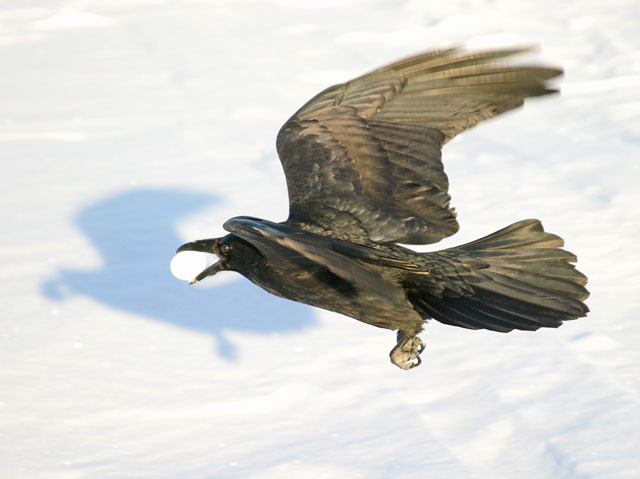 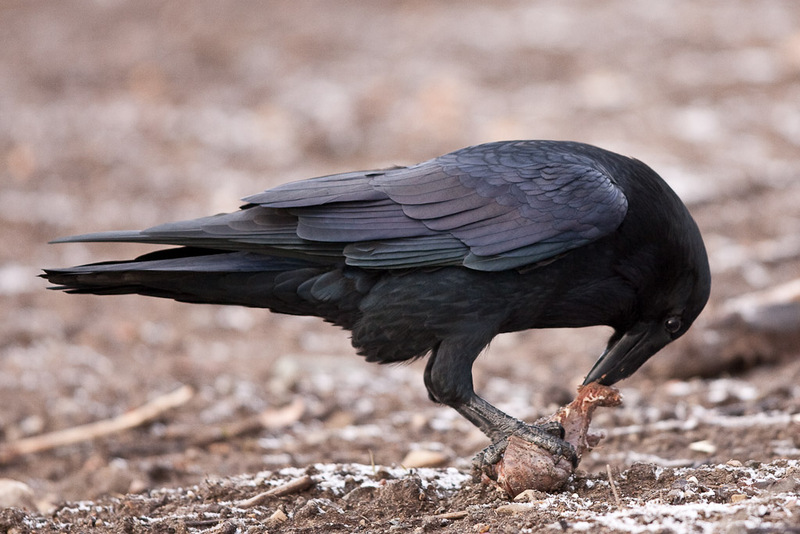 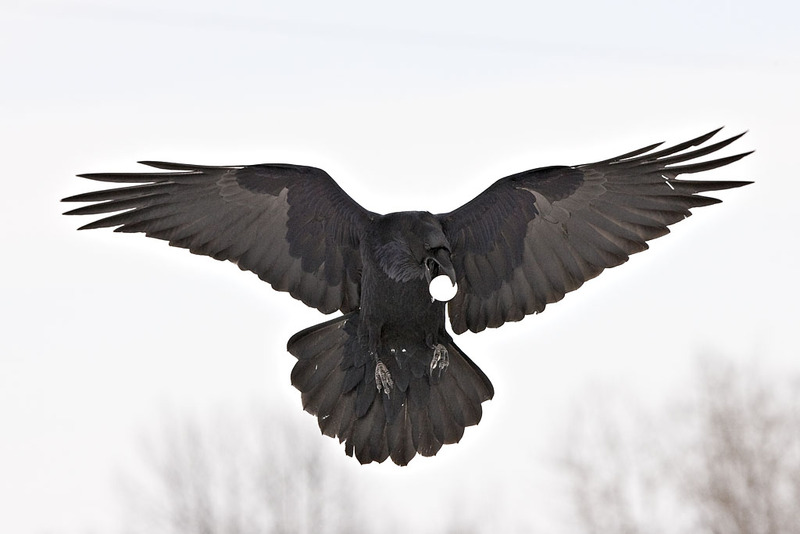 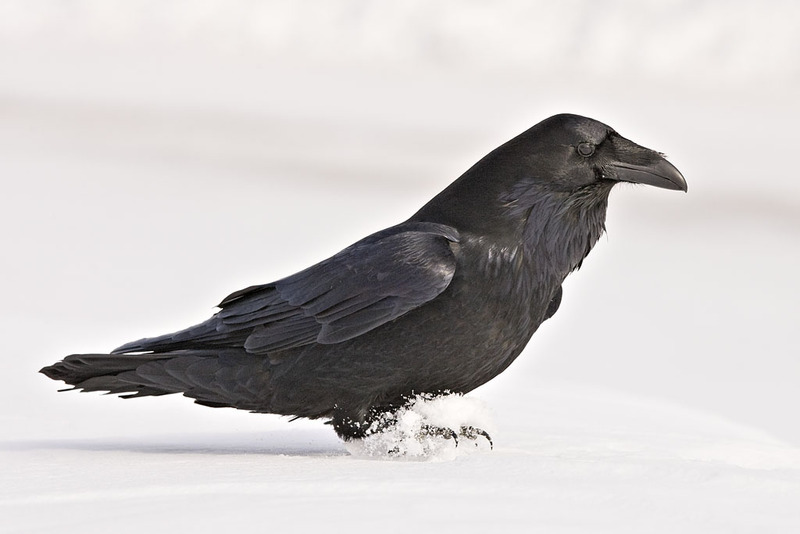 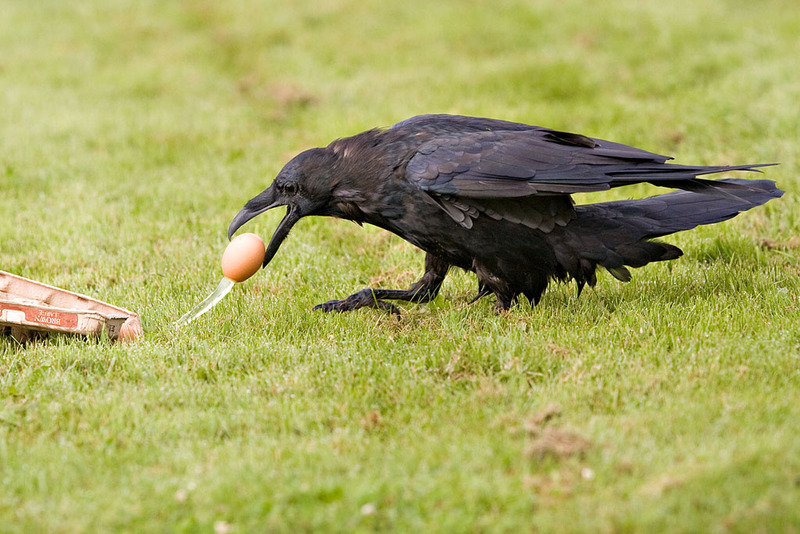 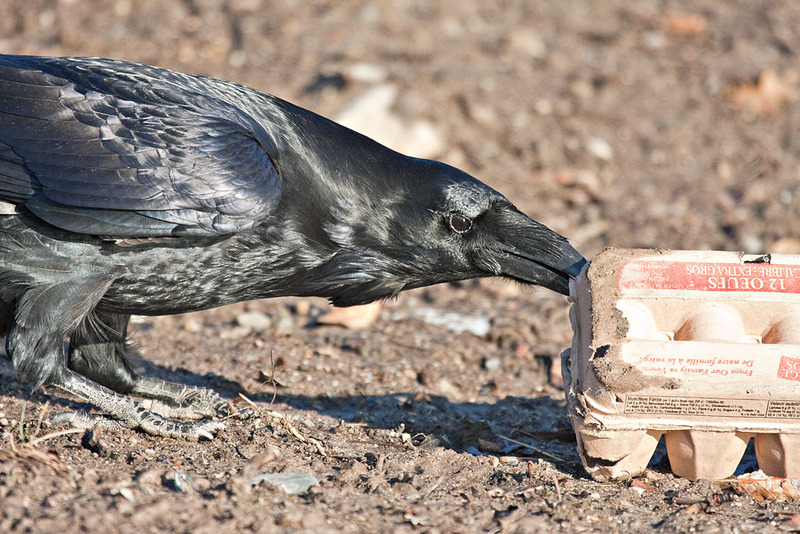 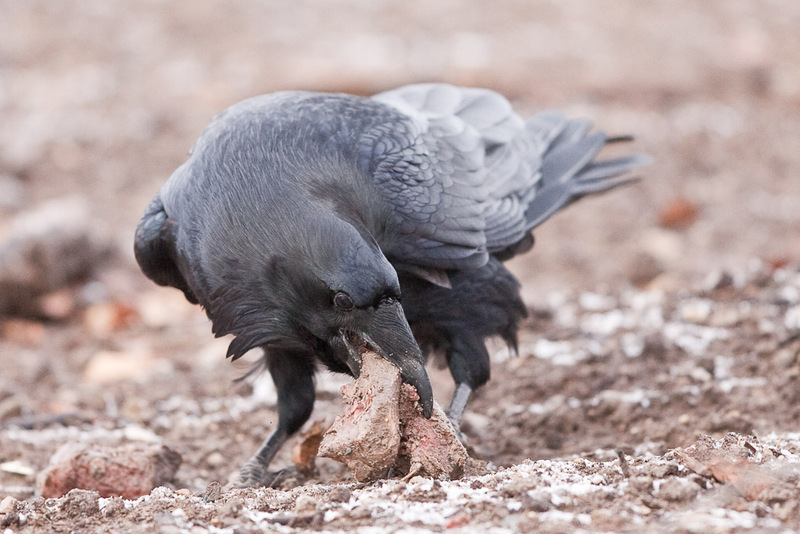 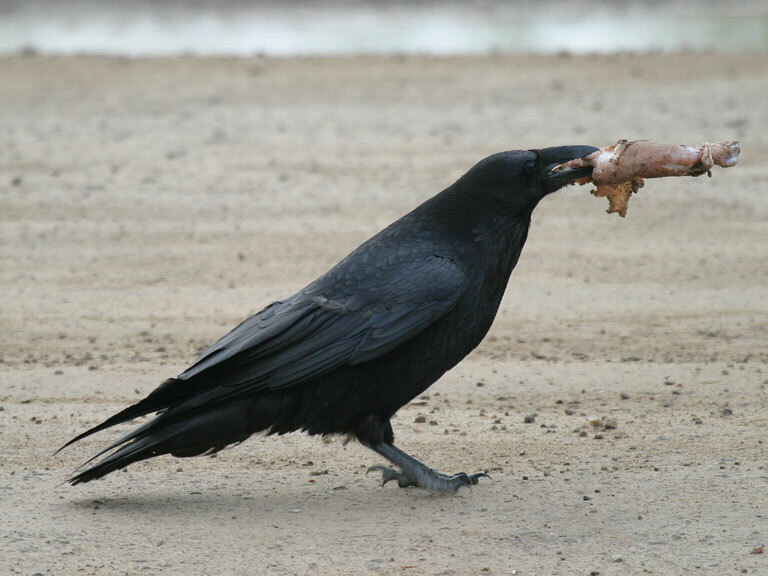 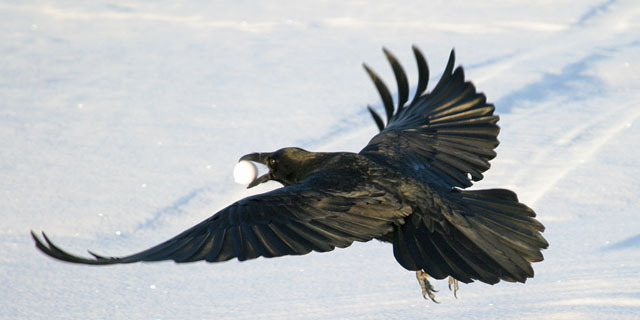 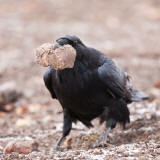 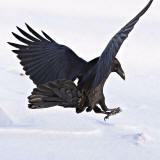 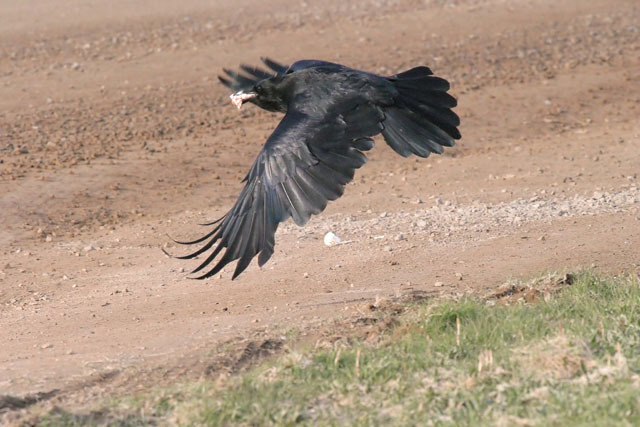 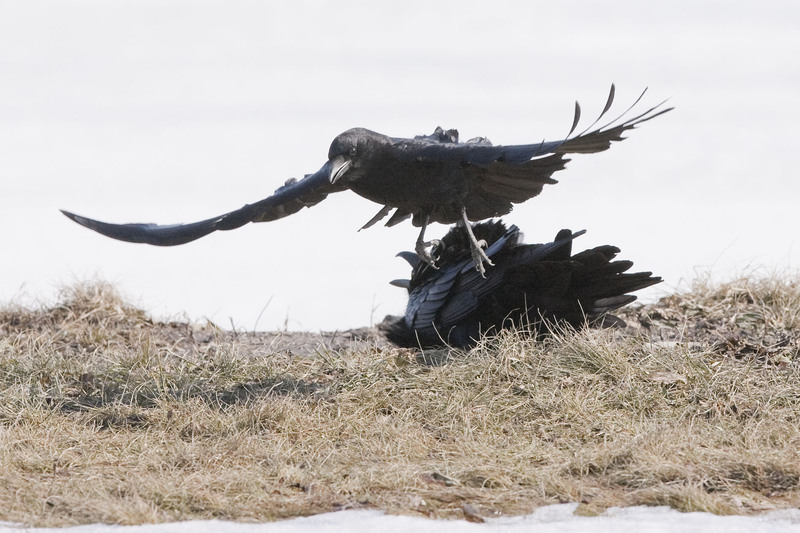 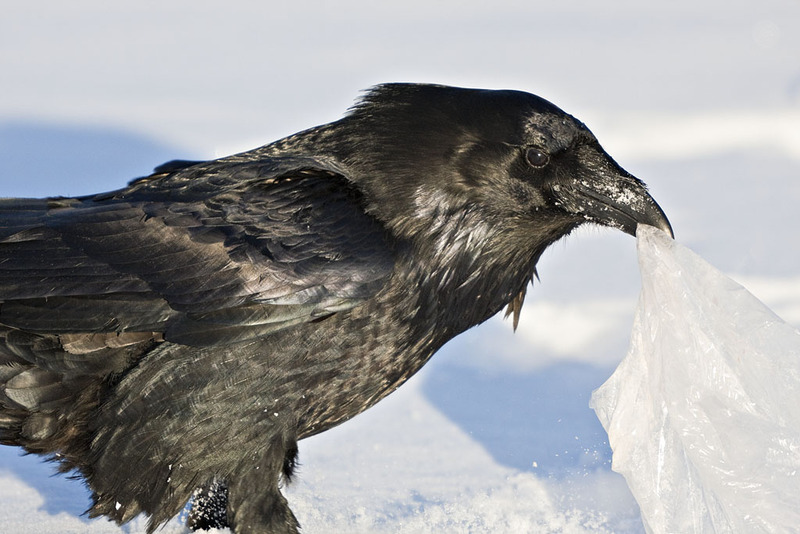 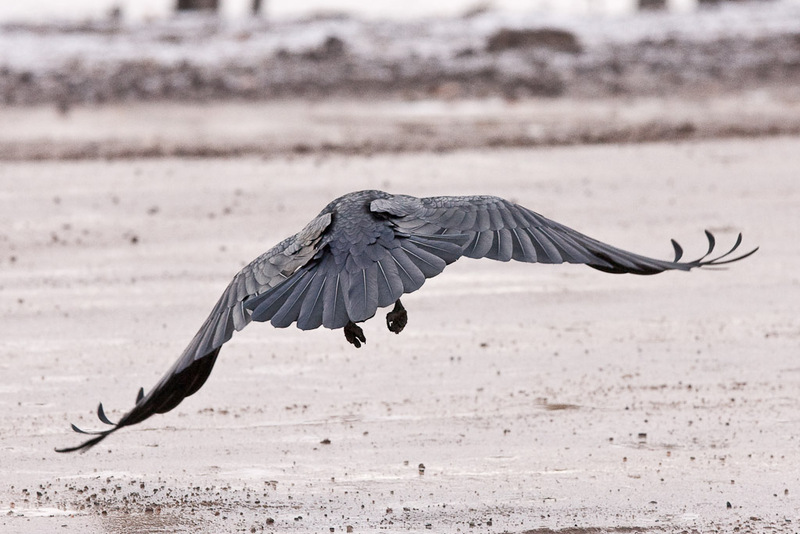 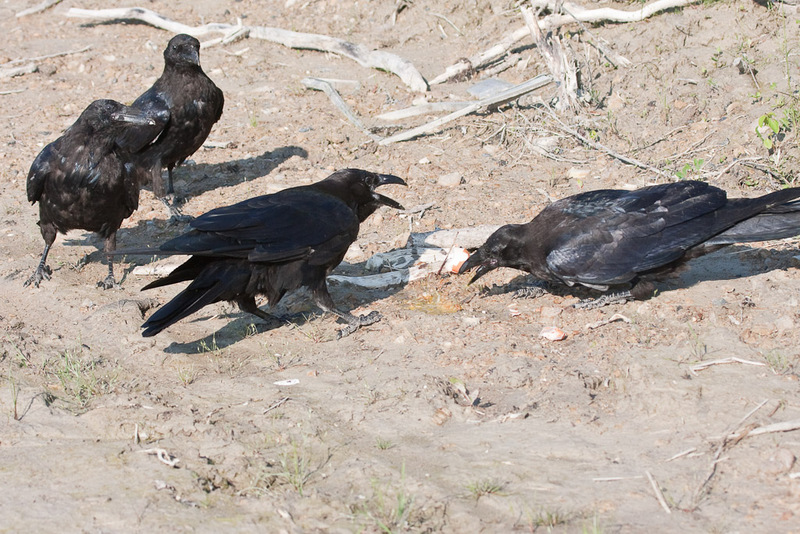 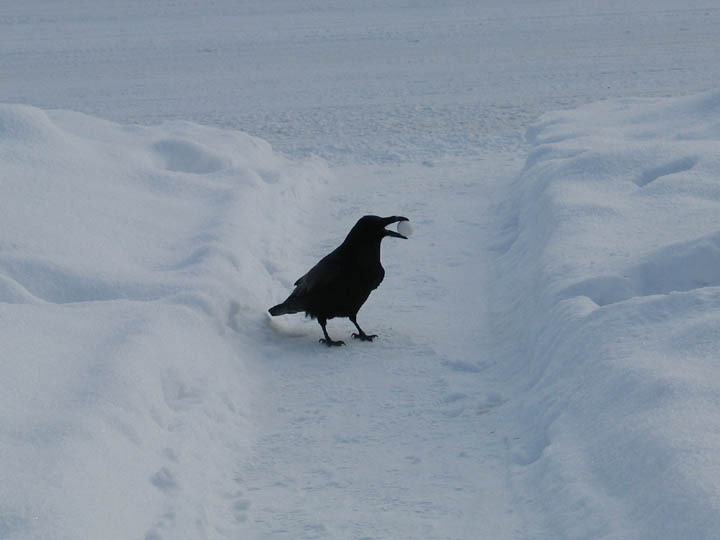 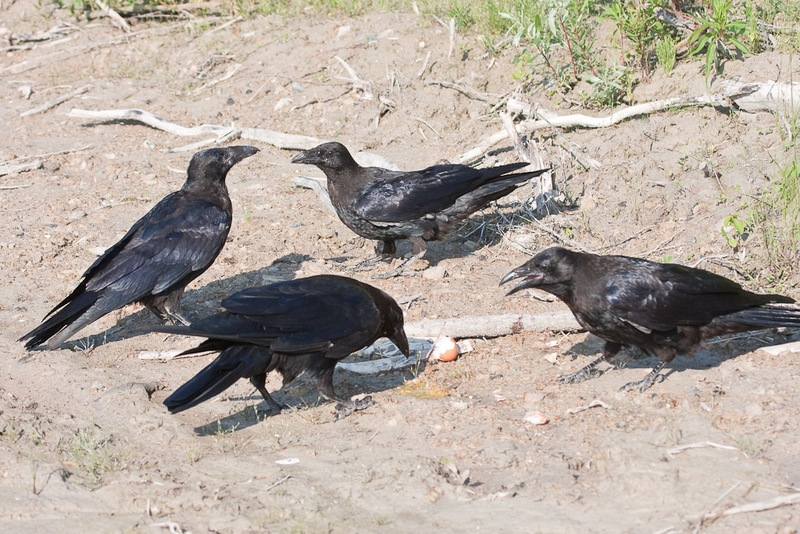 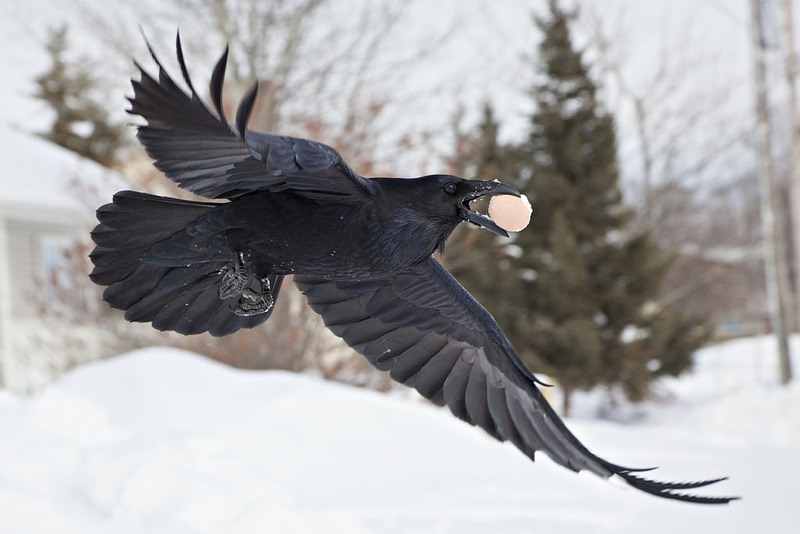 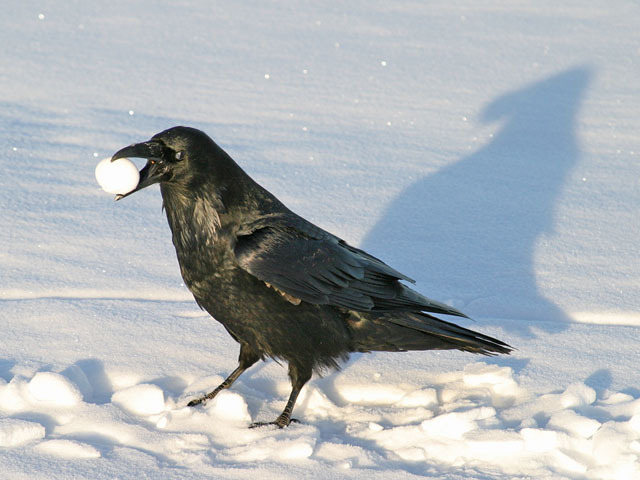 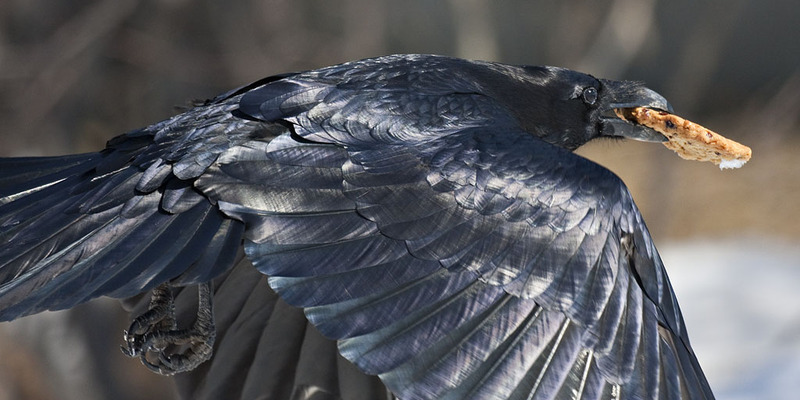 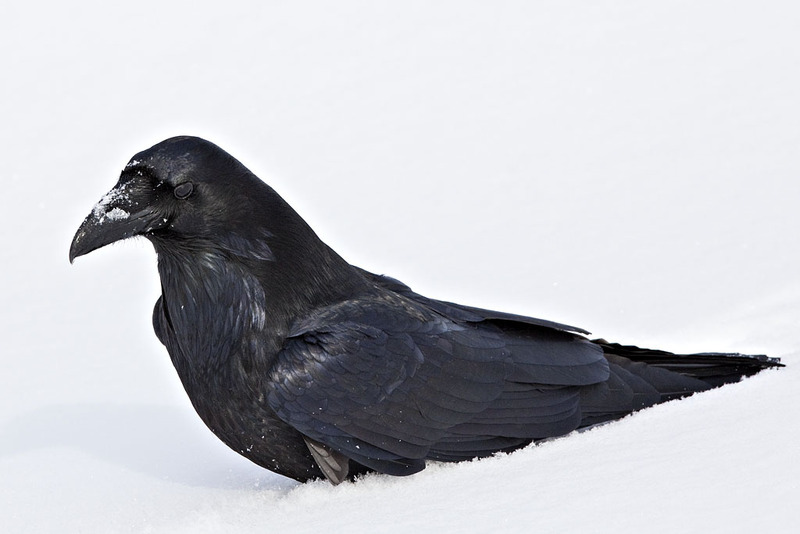 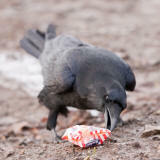 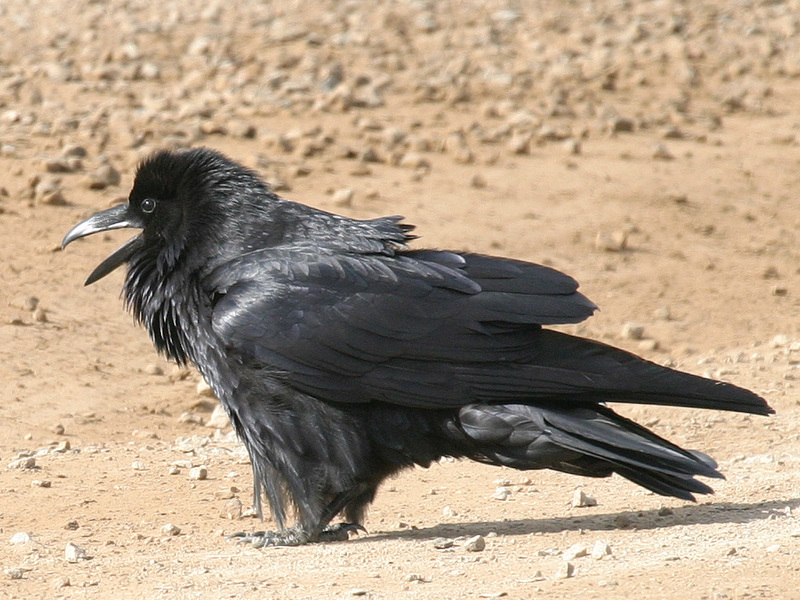 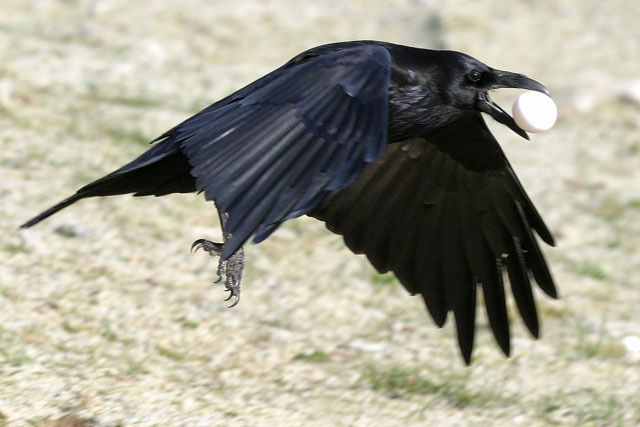 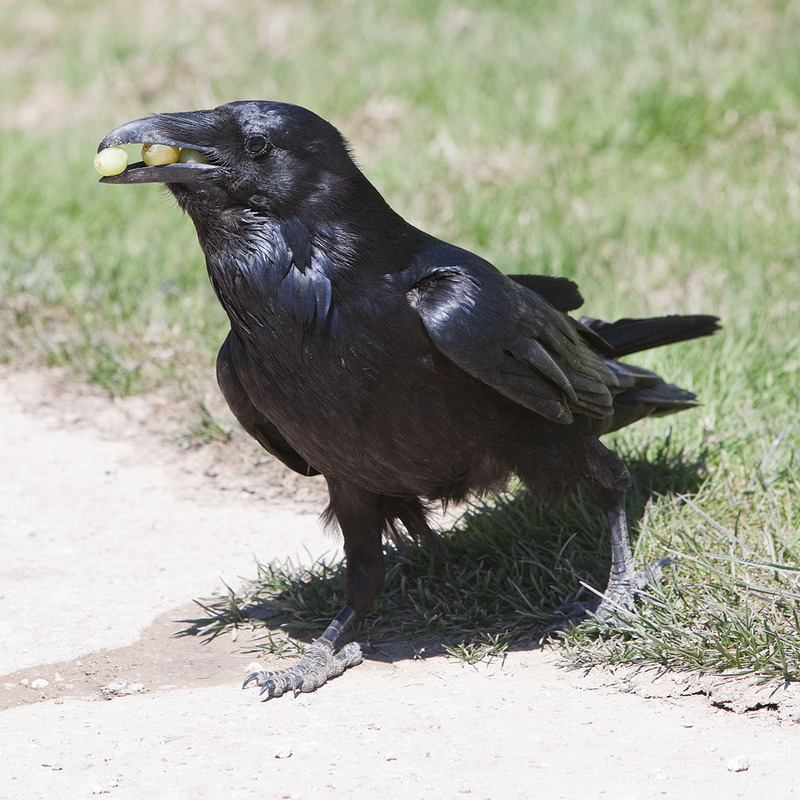 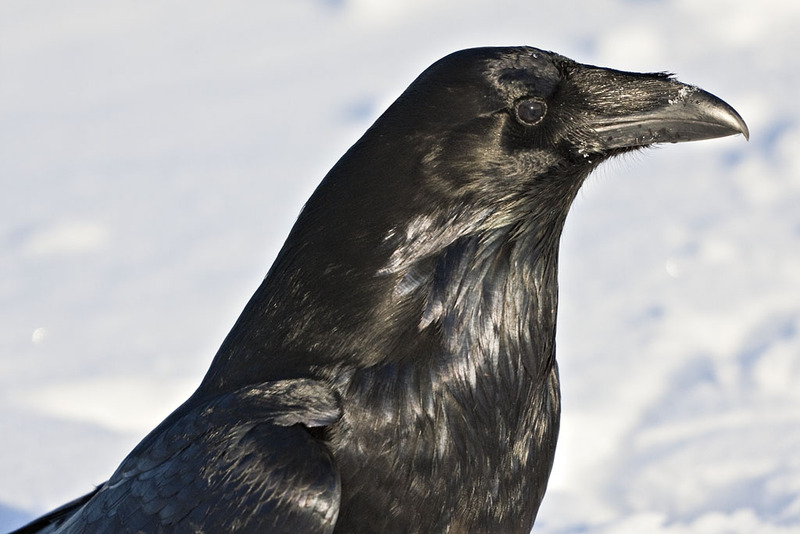 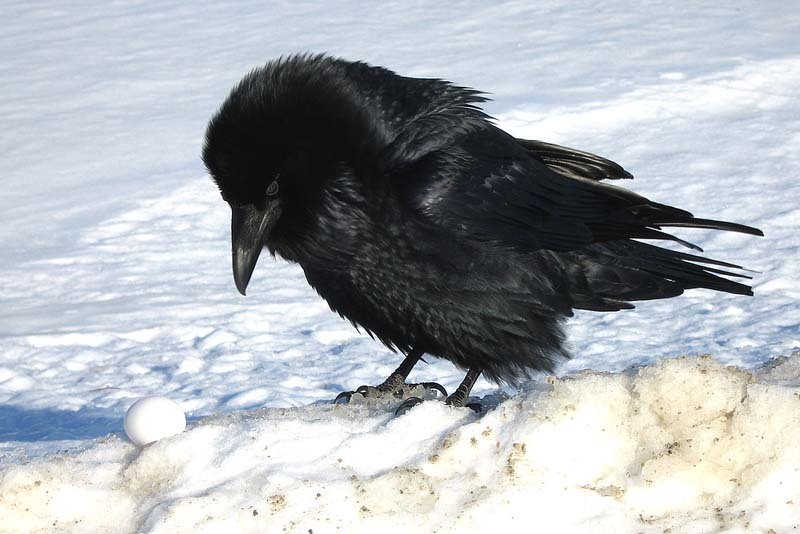 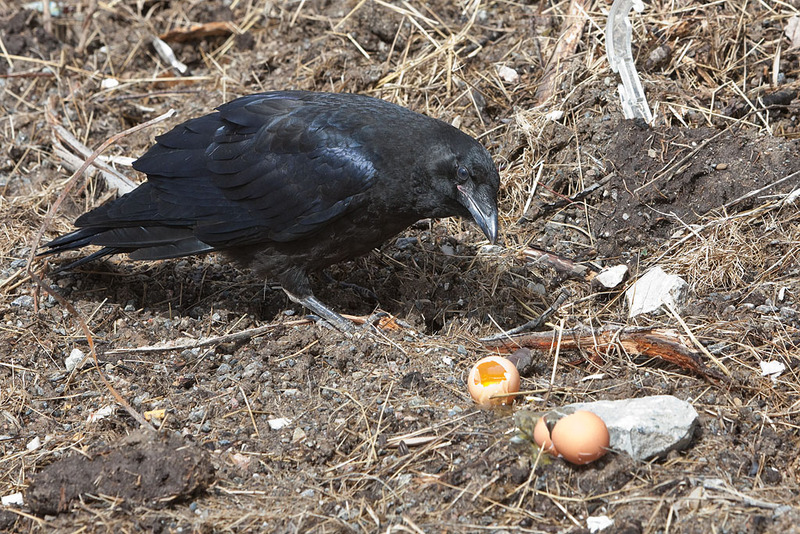 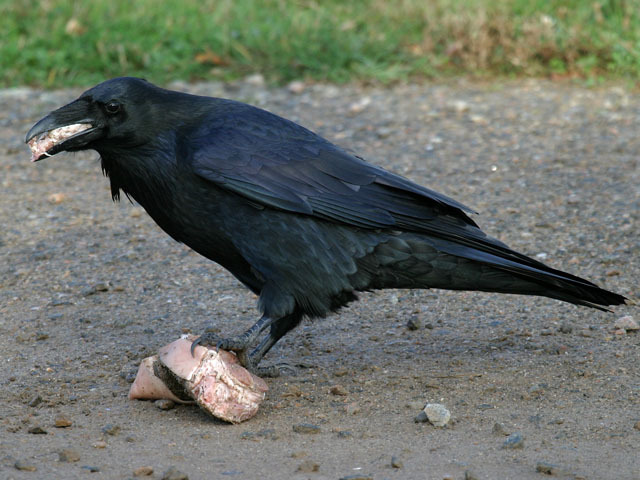 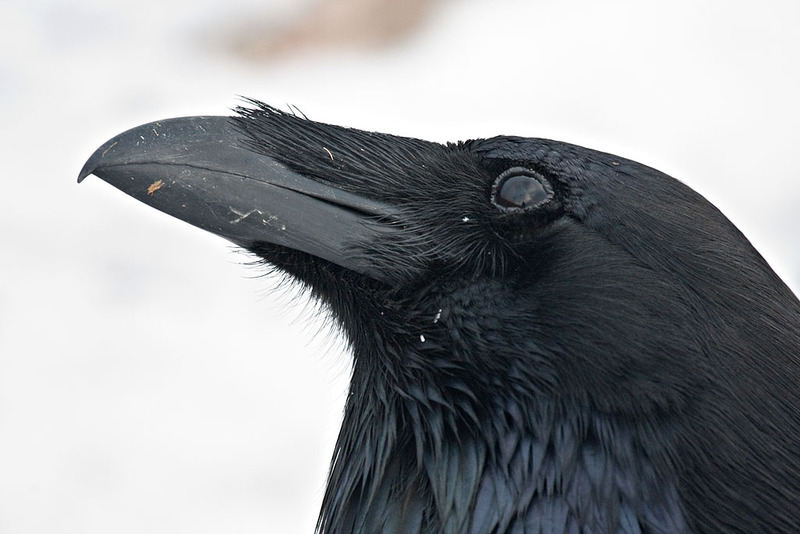 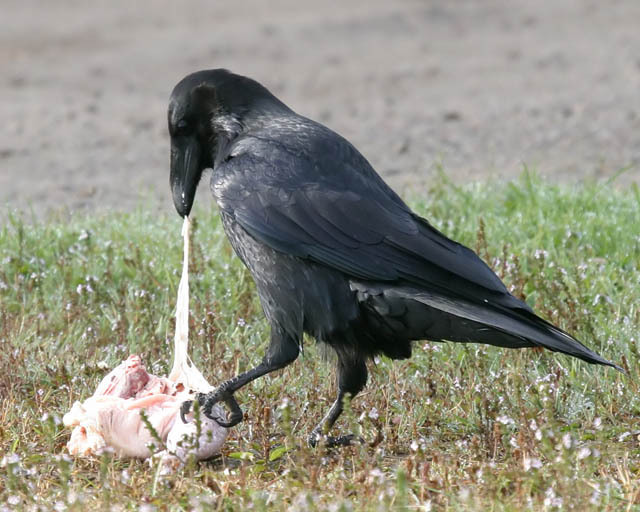 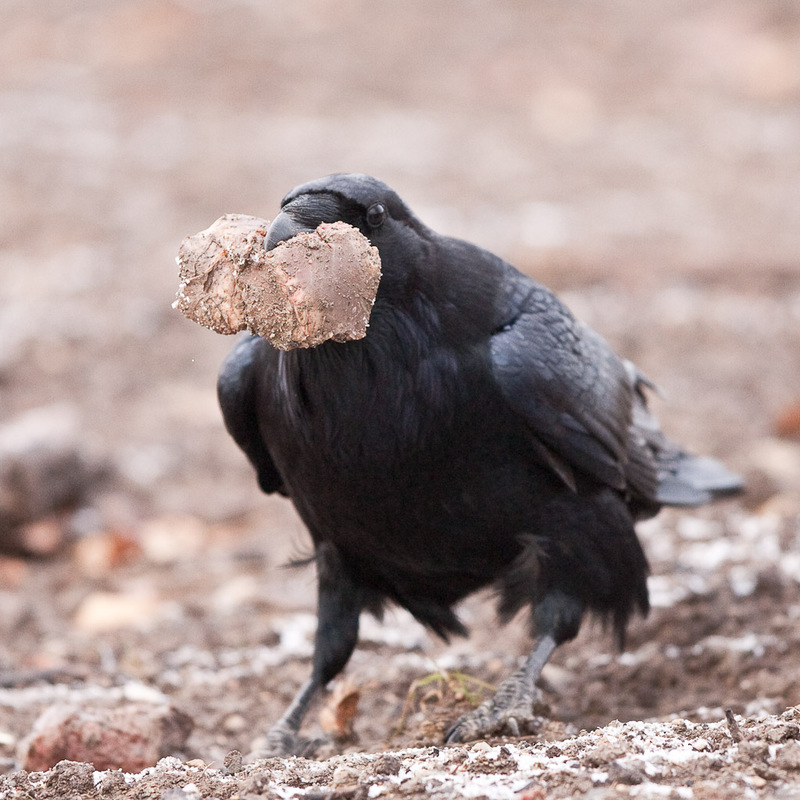 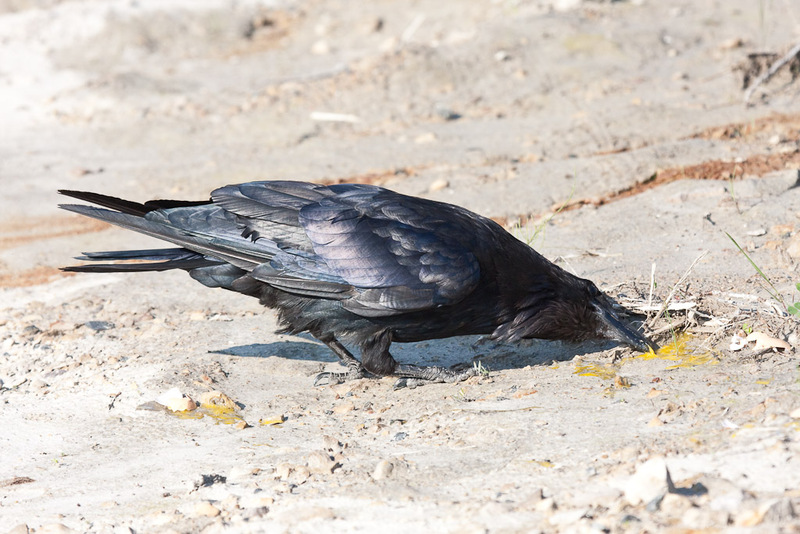 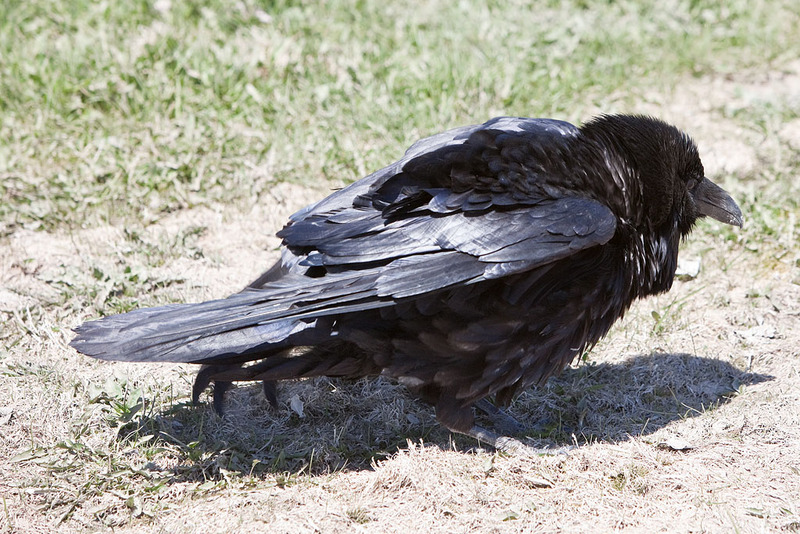 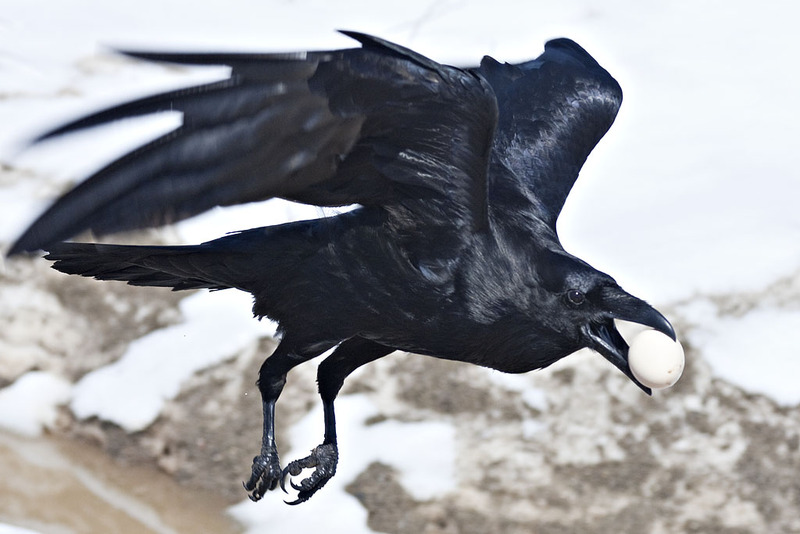 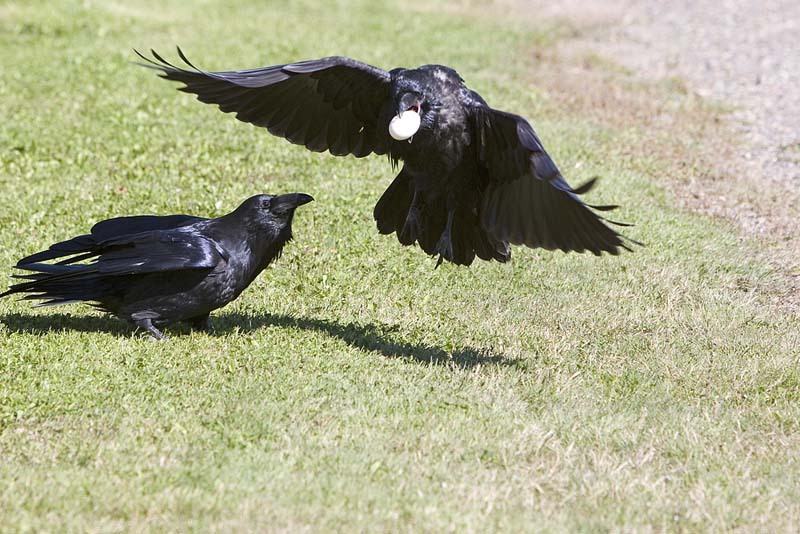 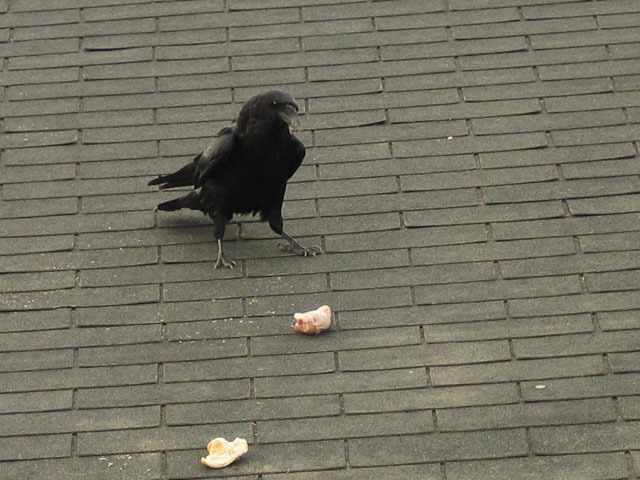 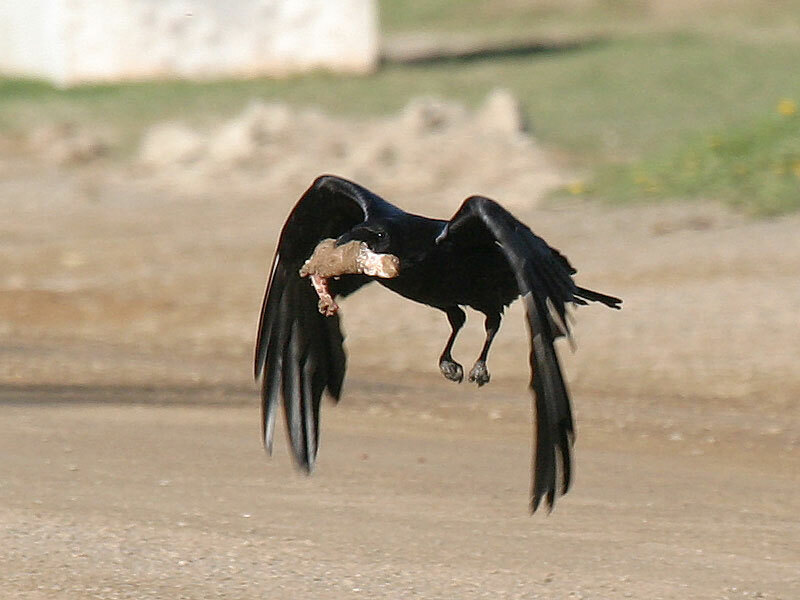 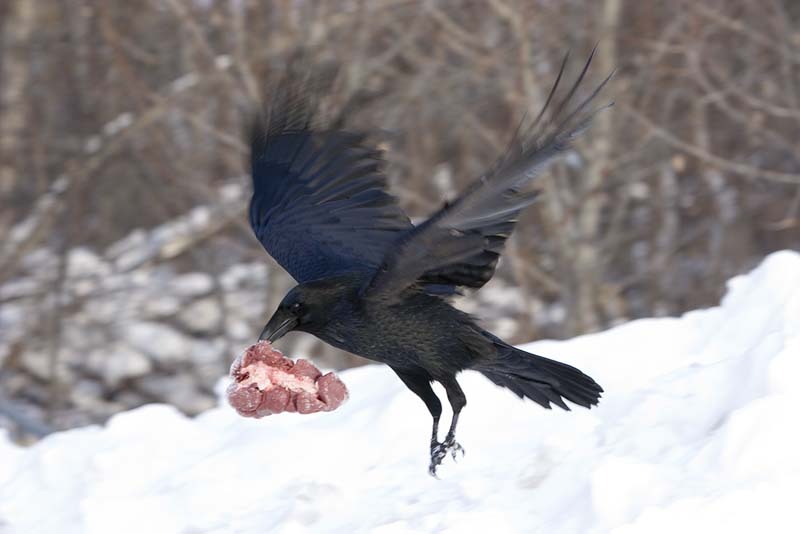 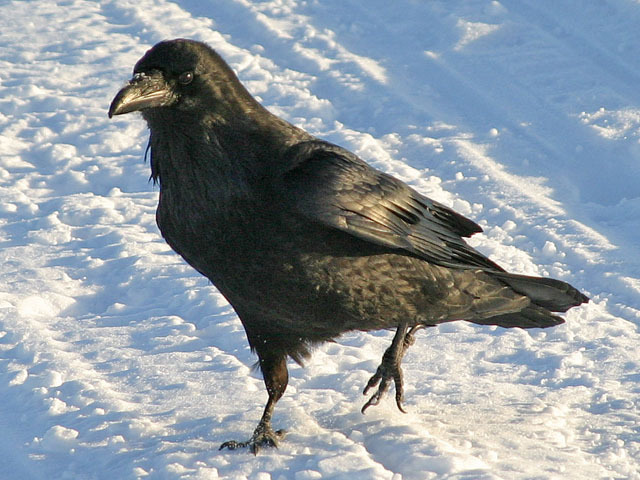 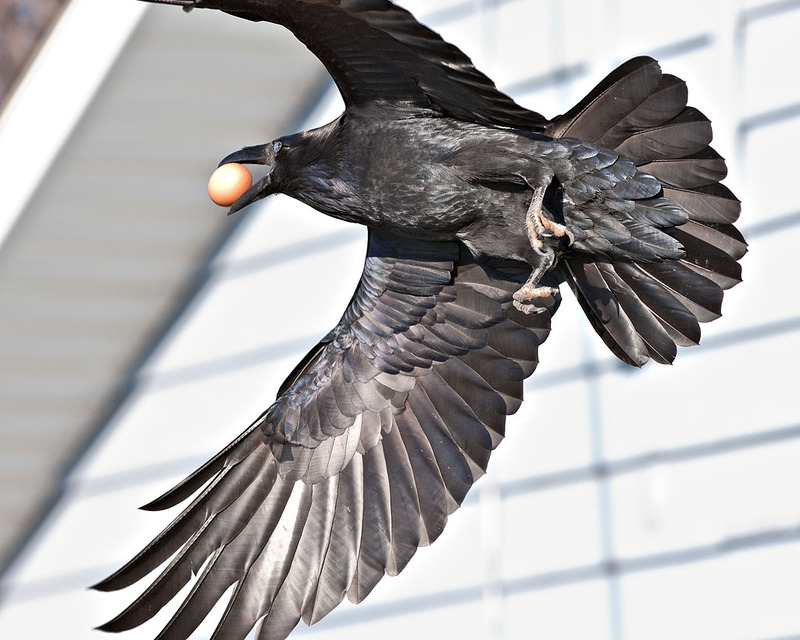 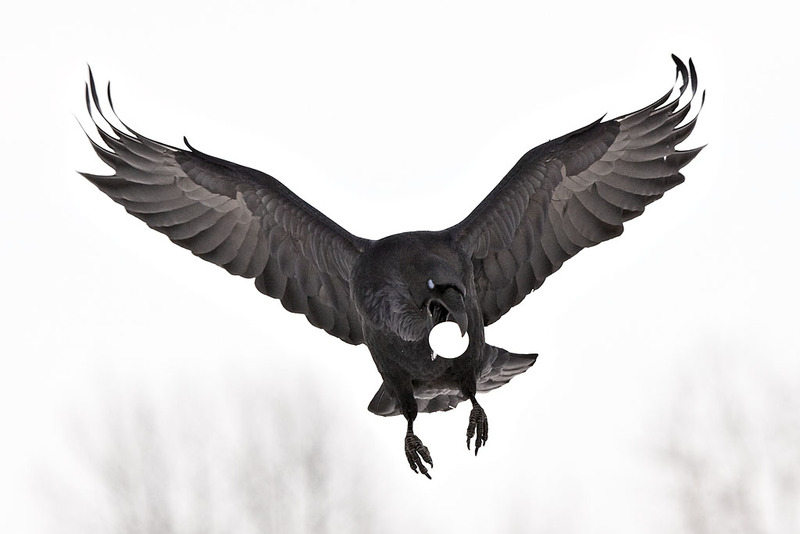 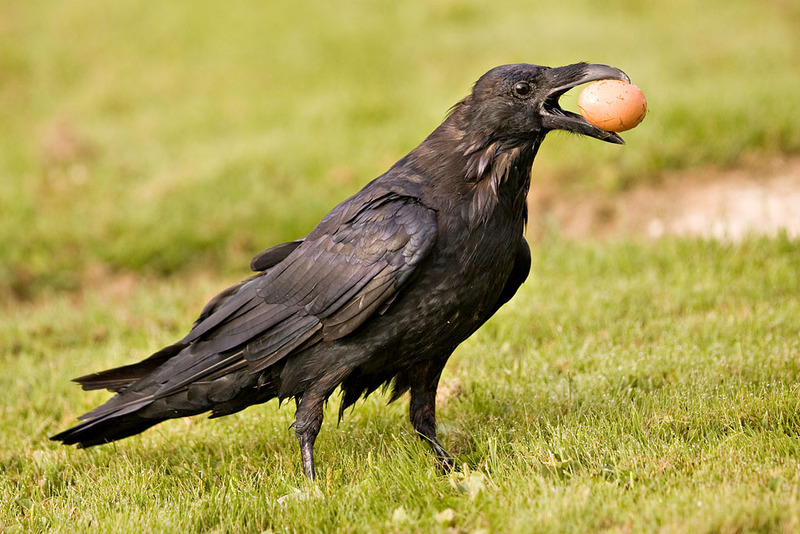 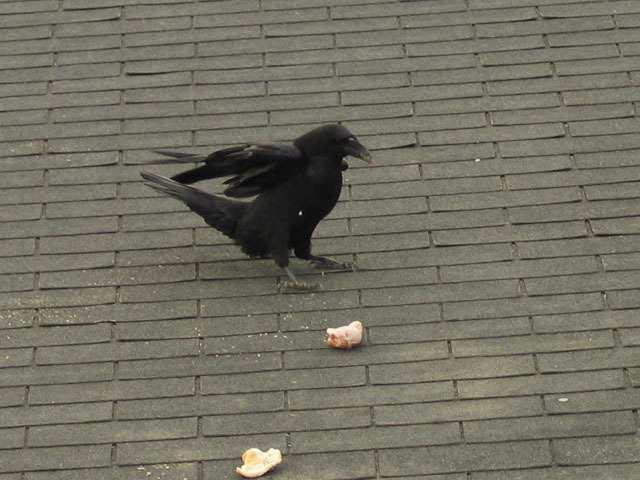 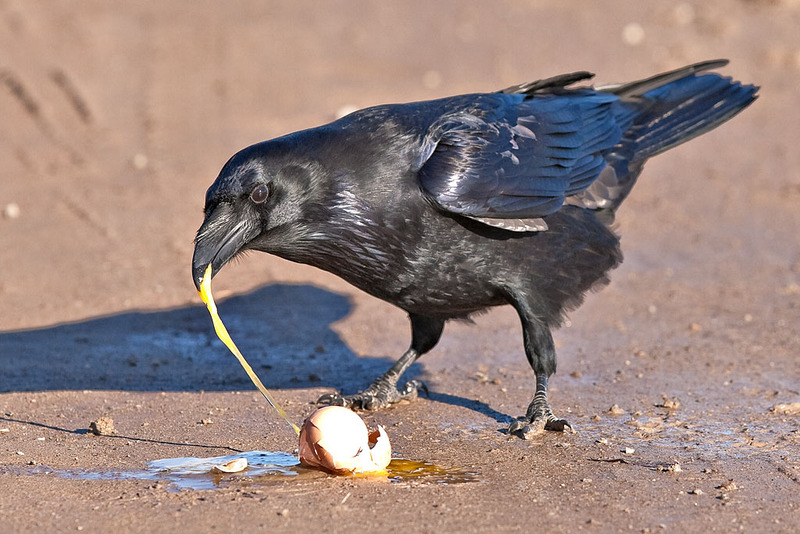 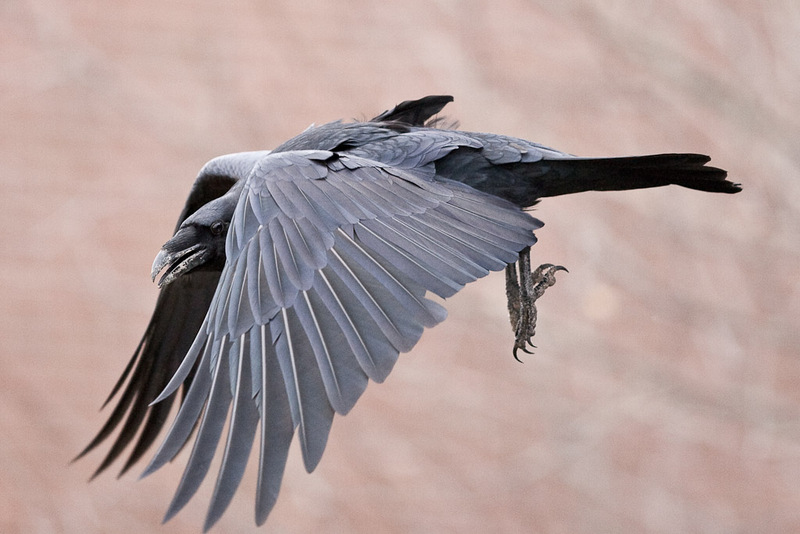 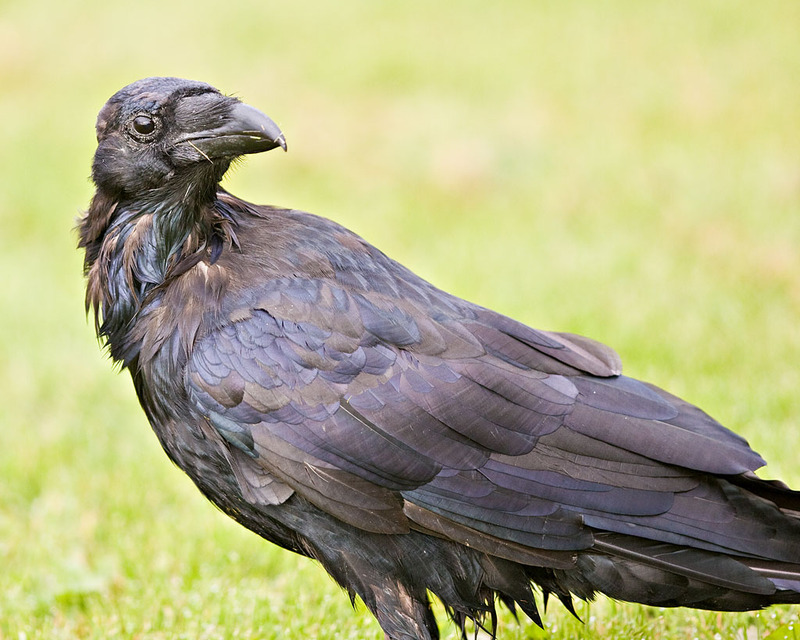 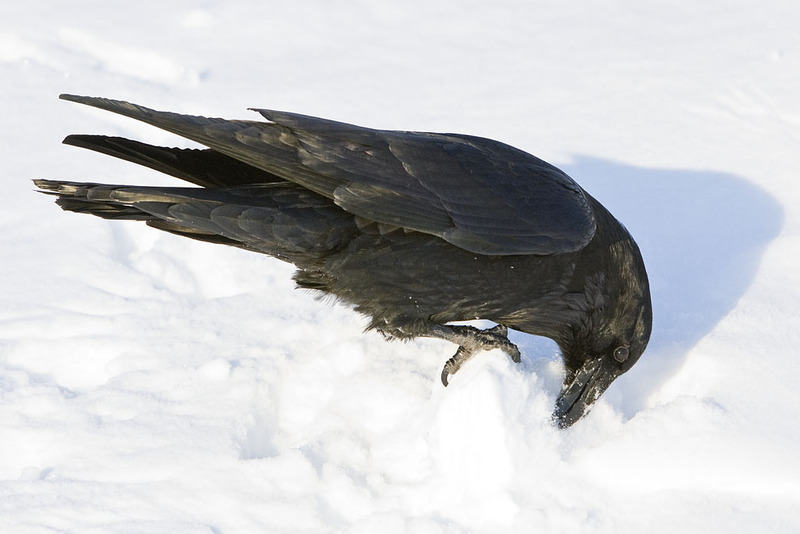 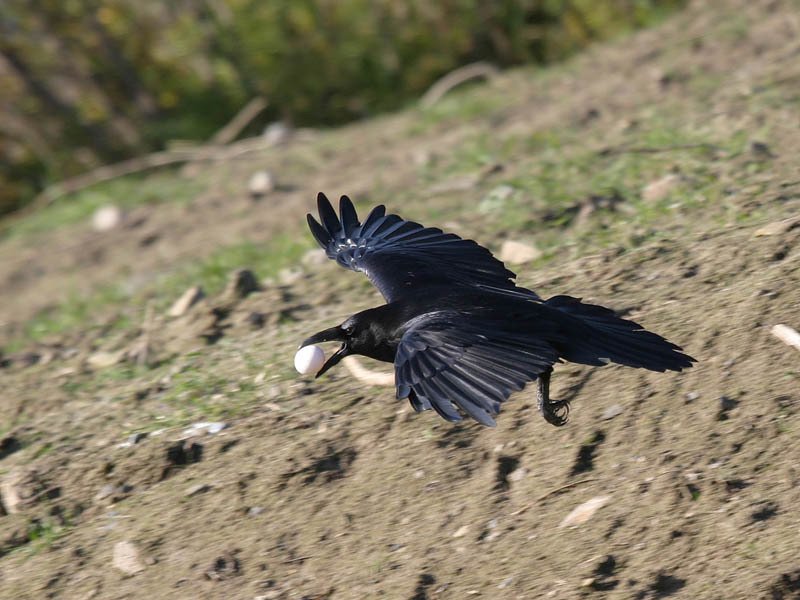 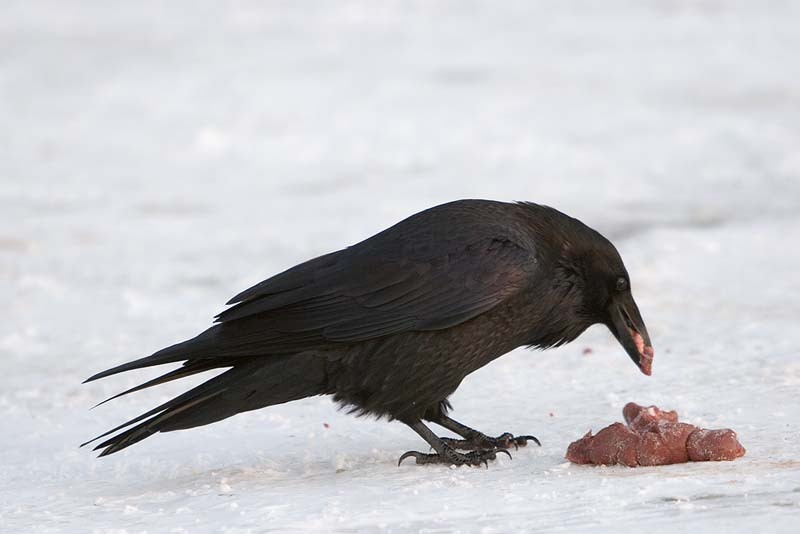 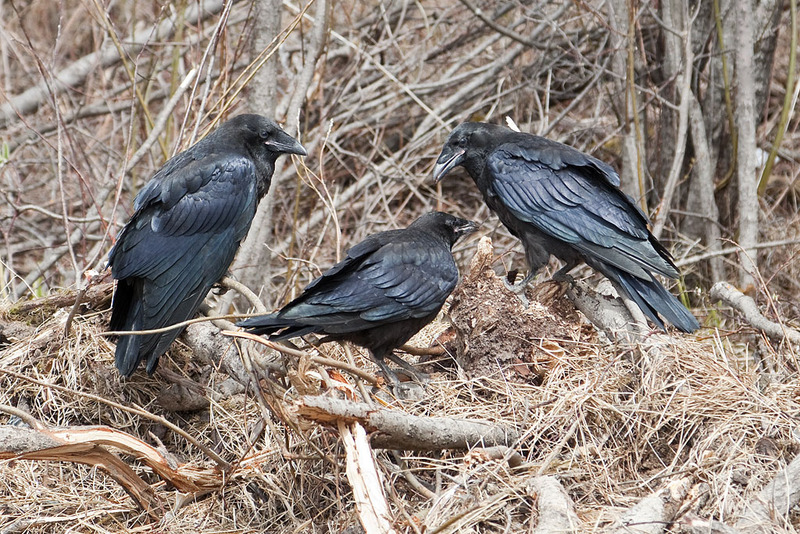 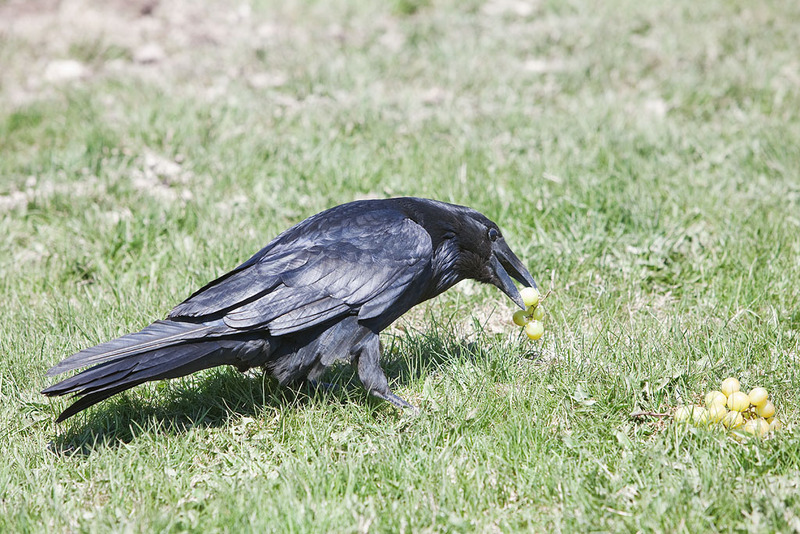 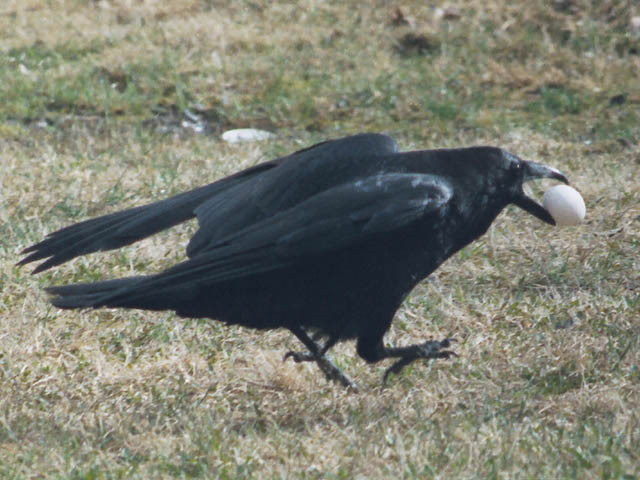 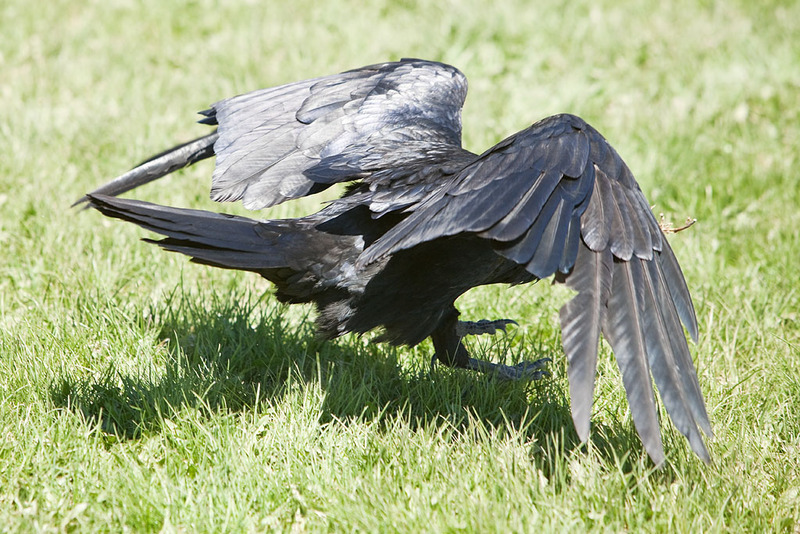 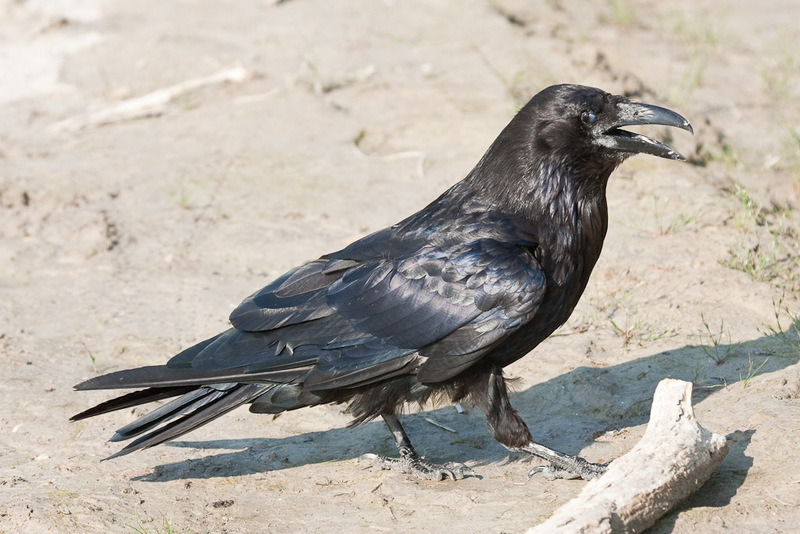 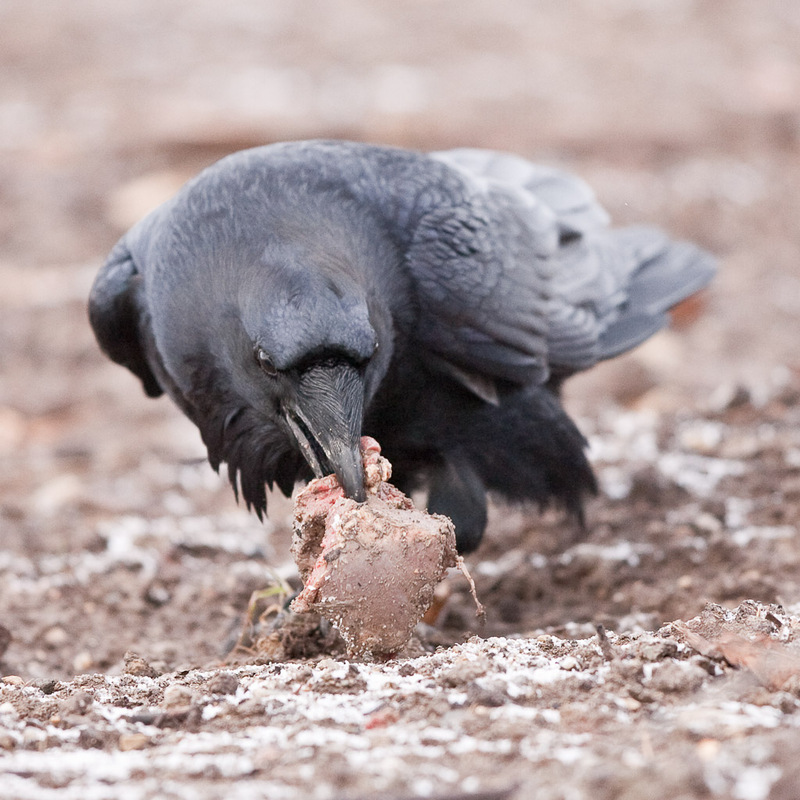 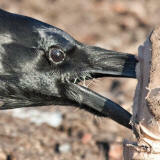 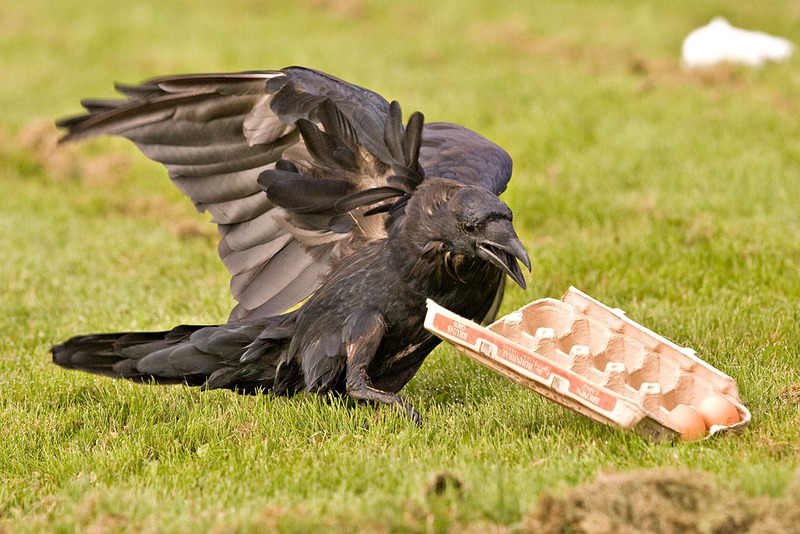 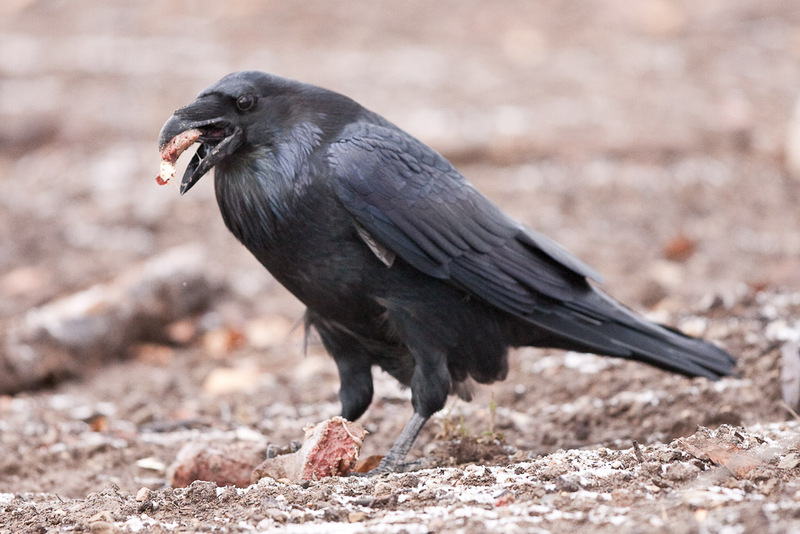 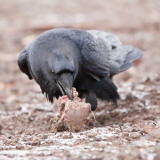 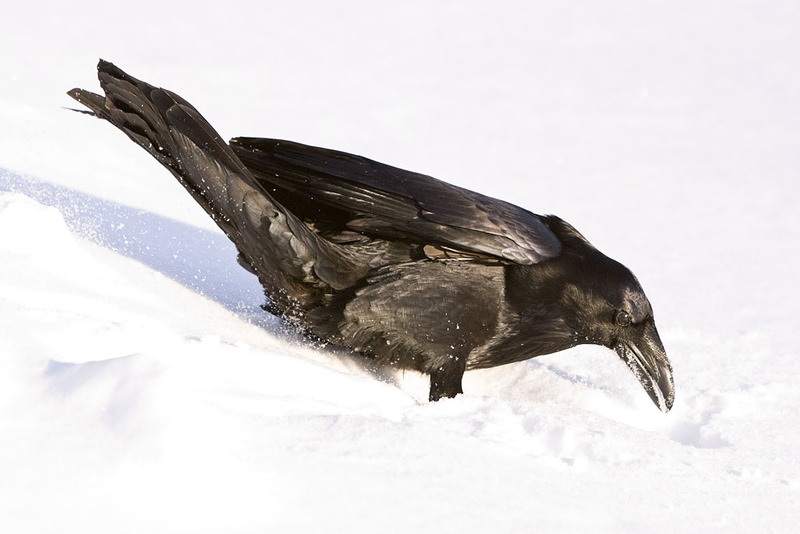 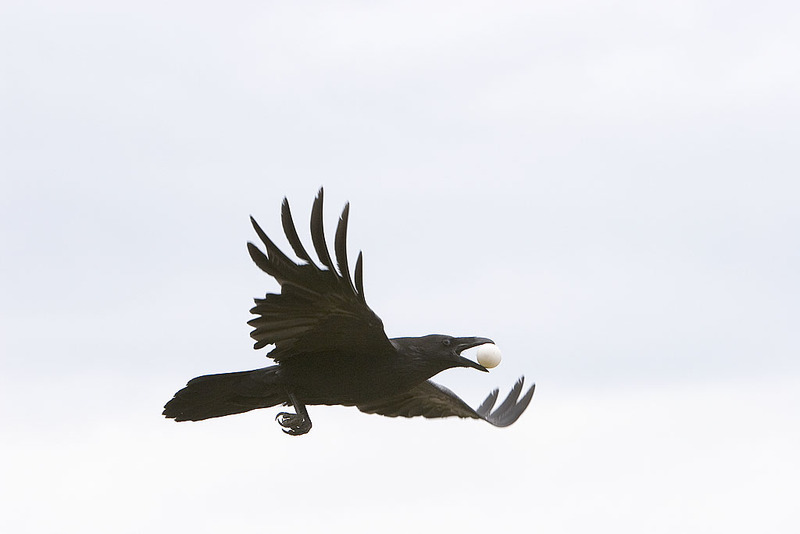 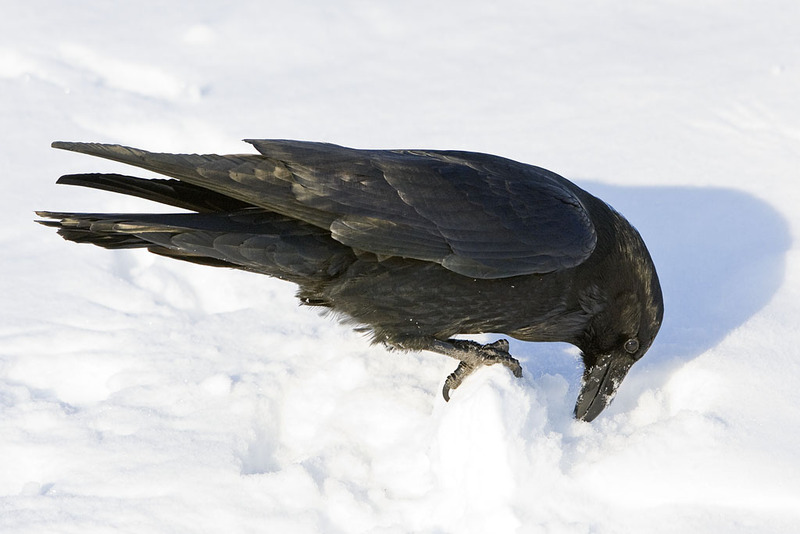 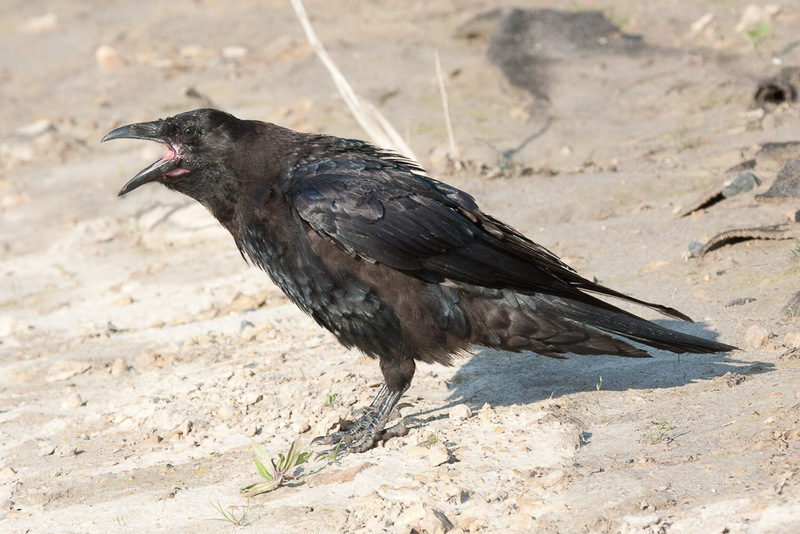 Ravens have a broad diet that includes carrion. 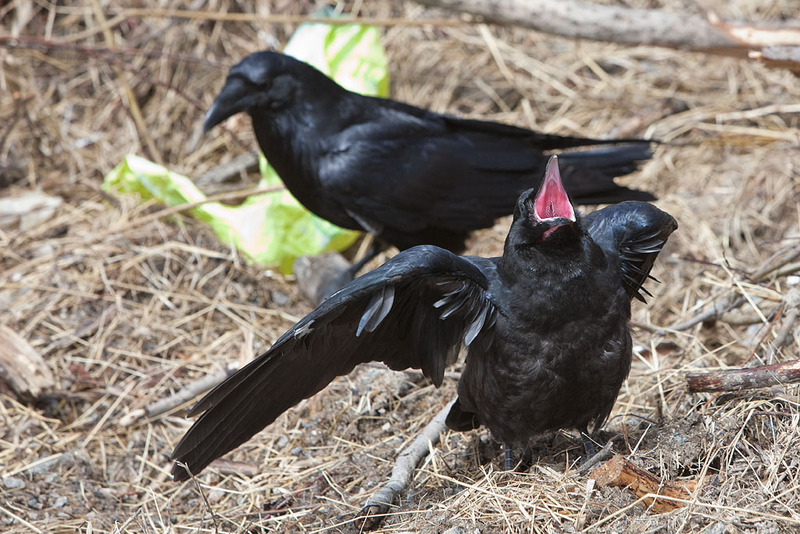 They make a wide variety of sounds. 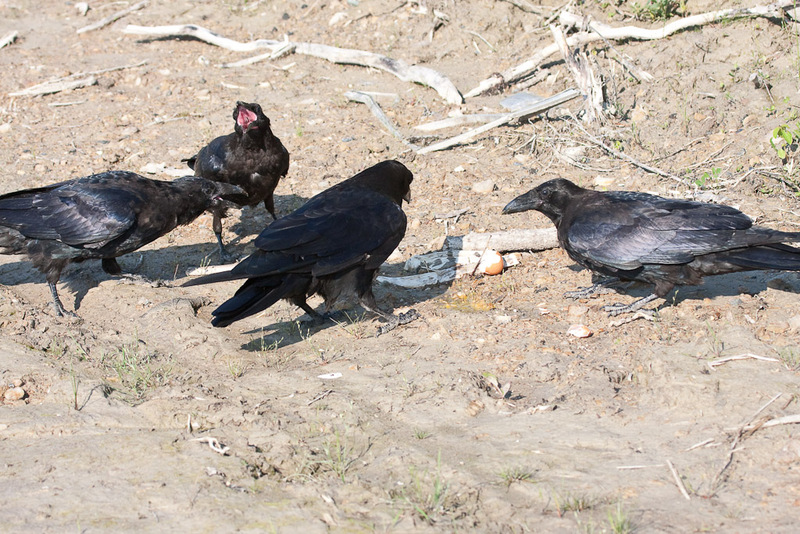 They are wary of new situations and foods (neophobic). 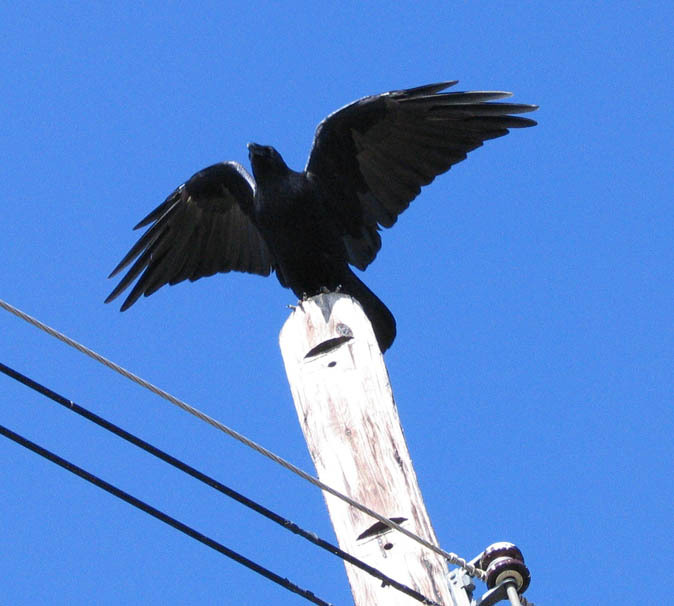 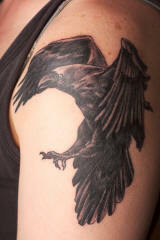 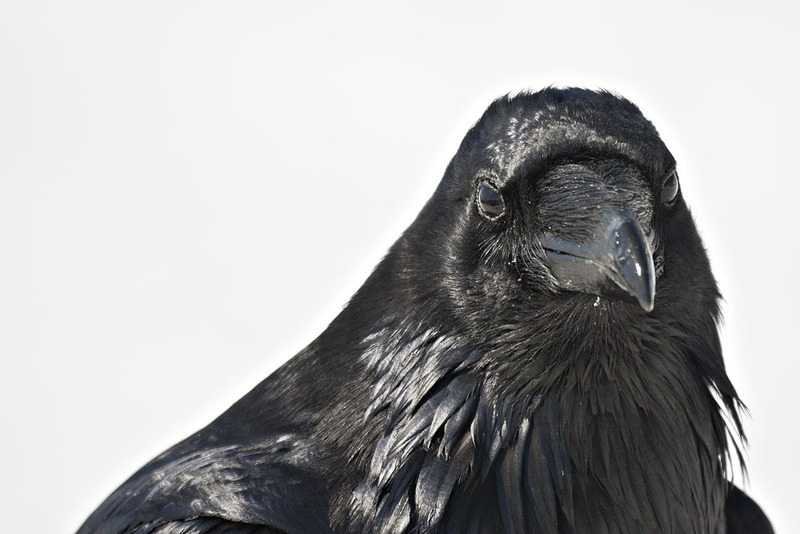 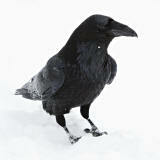 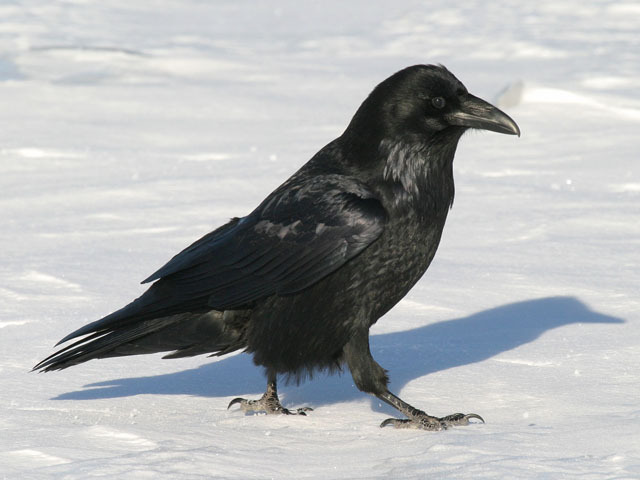 Ravens are often mistaken for crows. 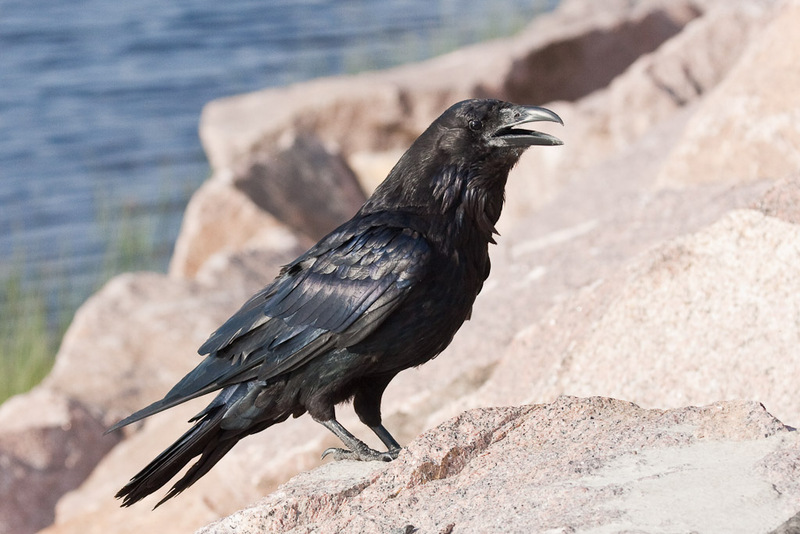 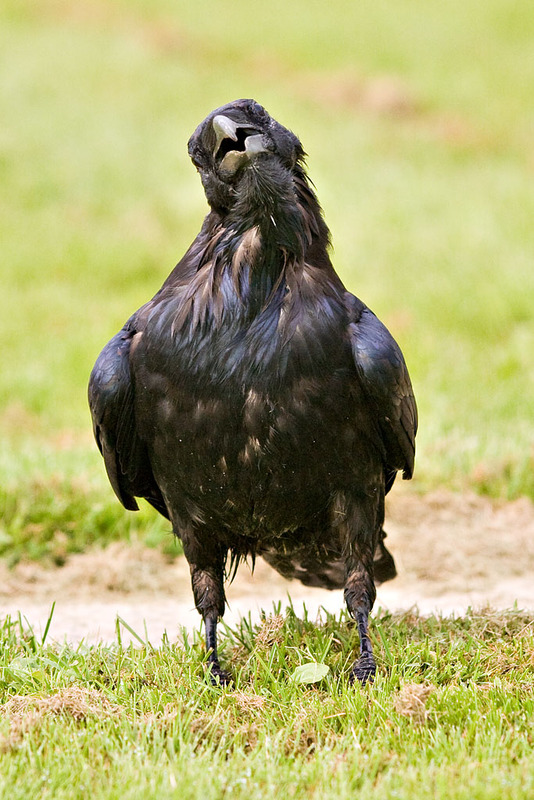 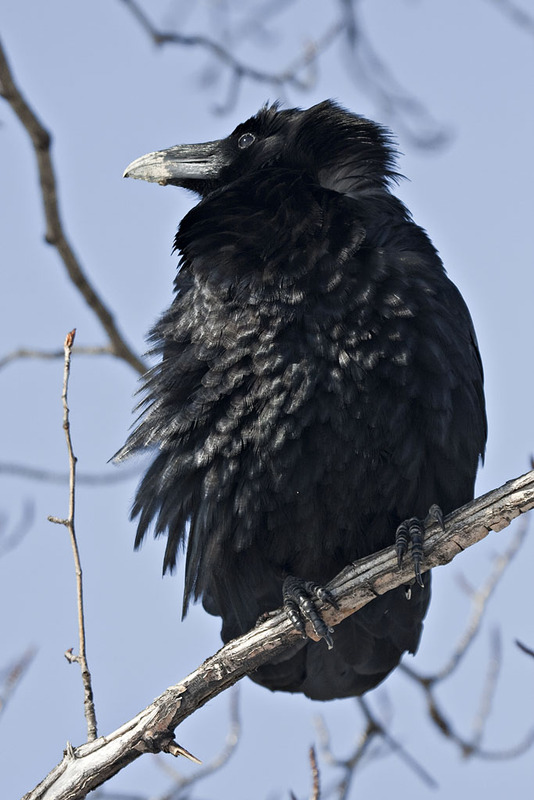 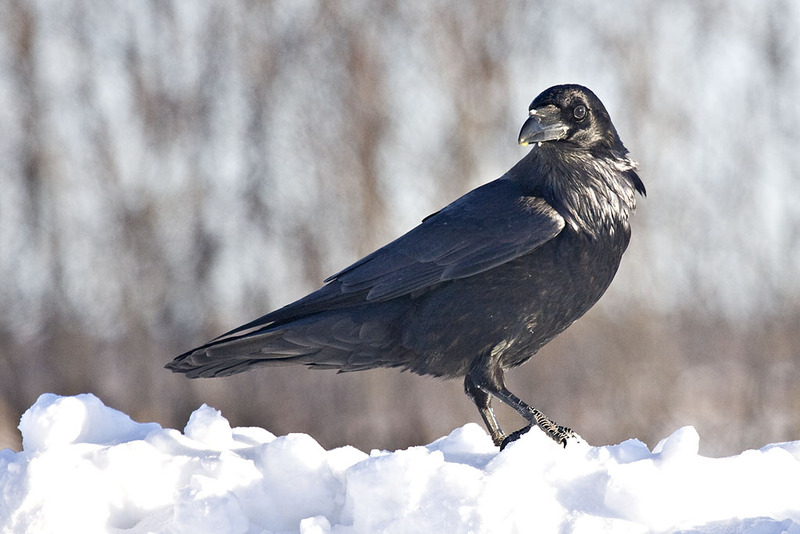 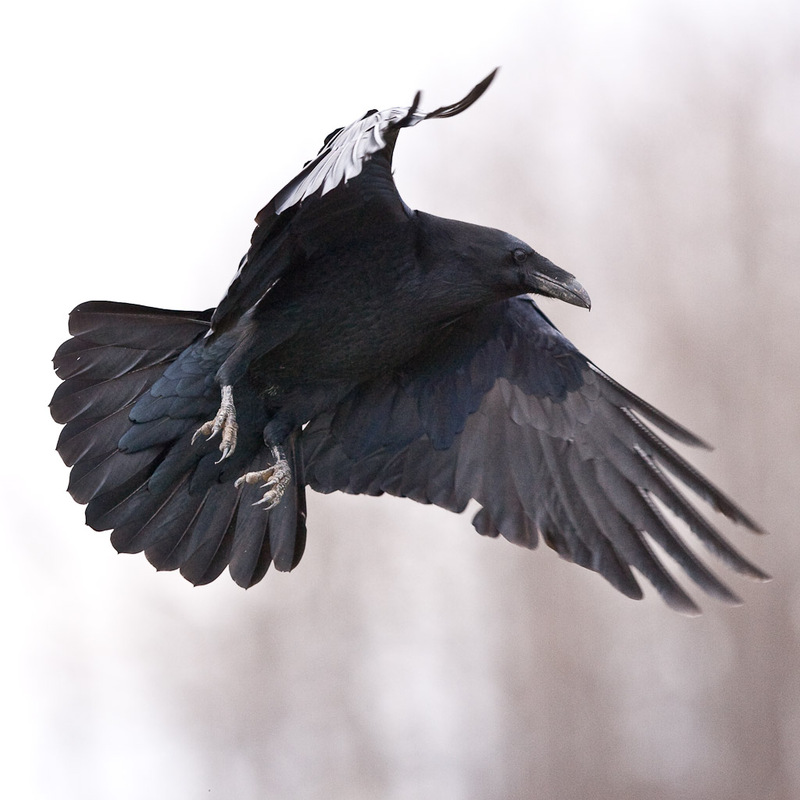 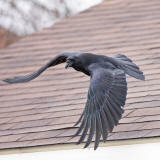 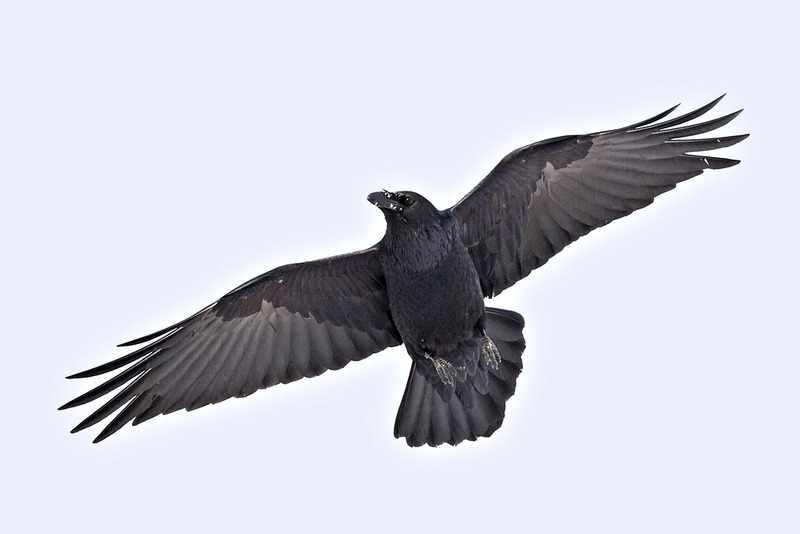 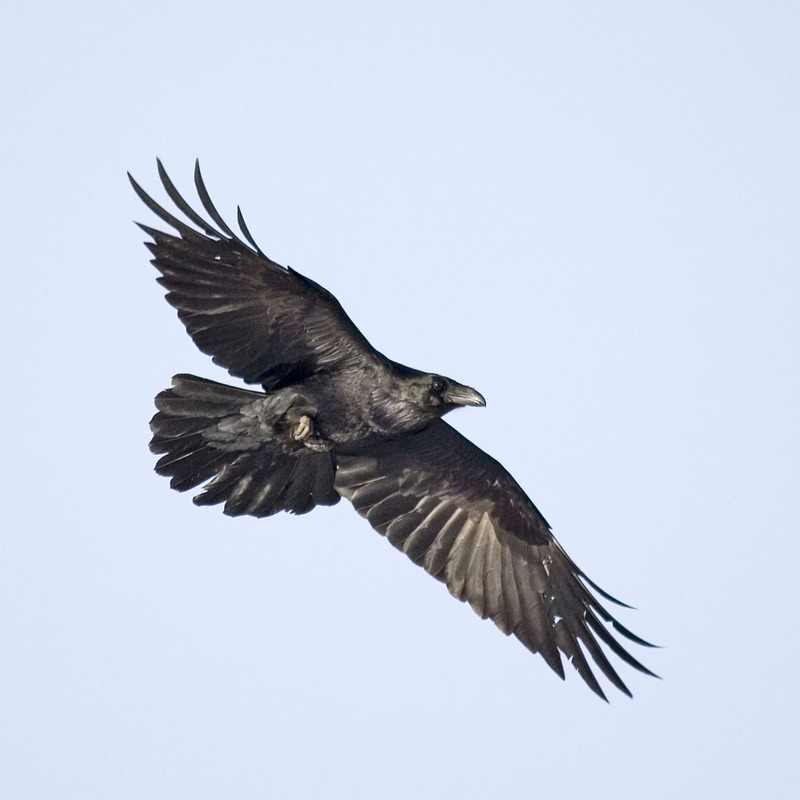 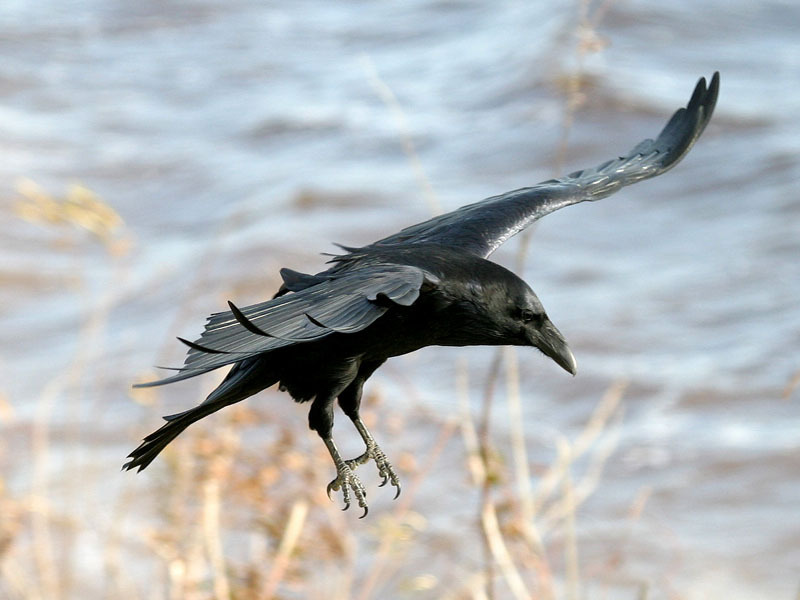 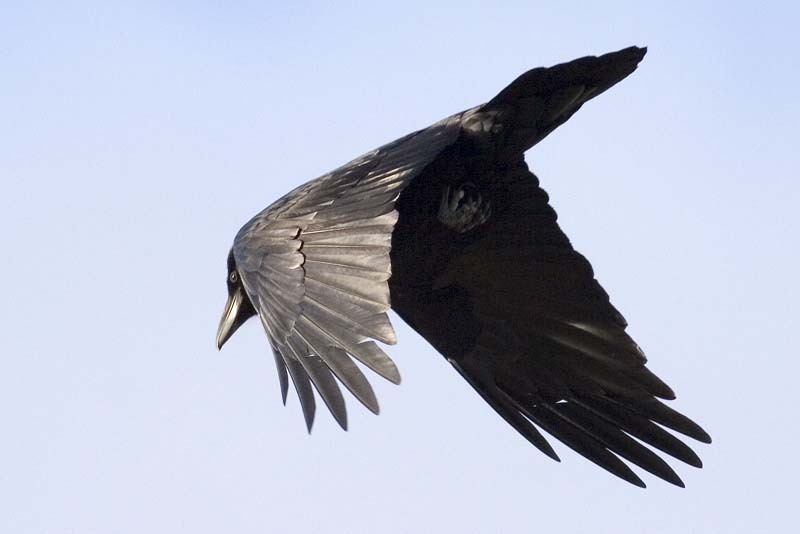 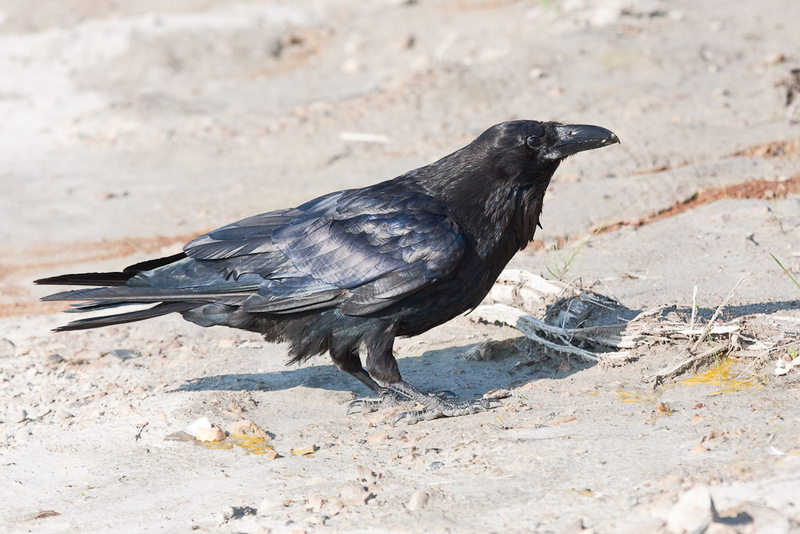 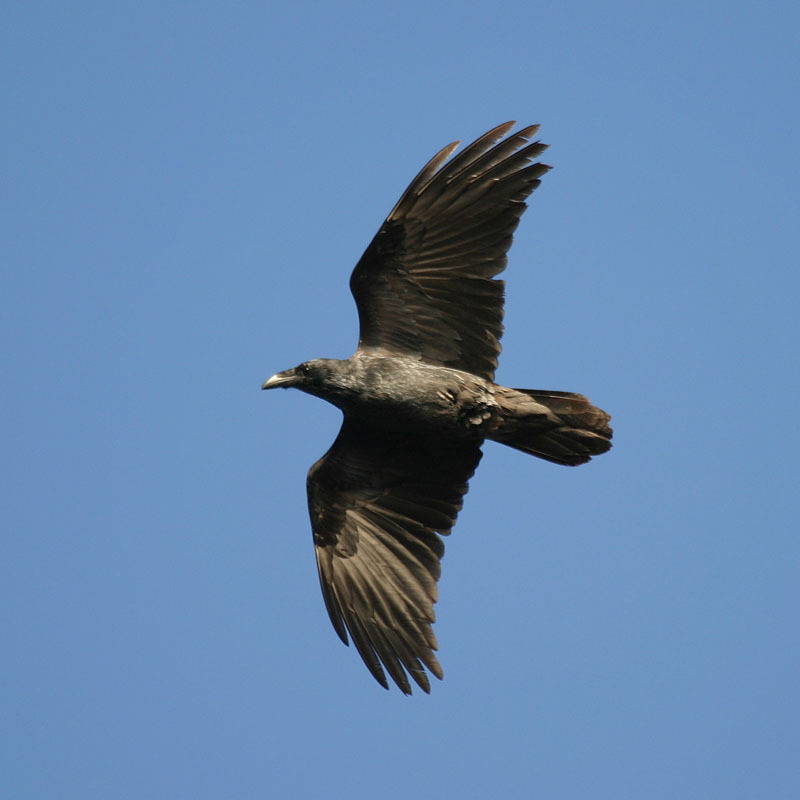 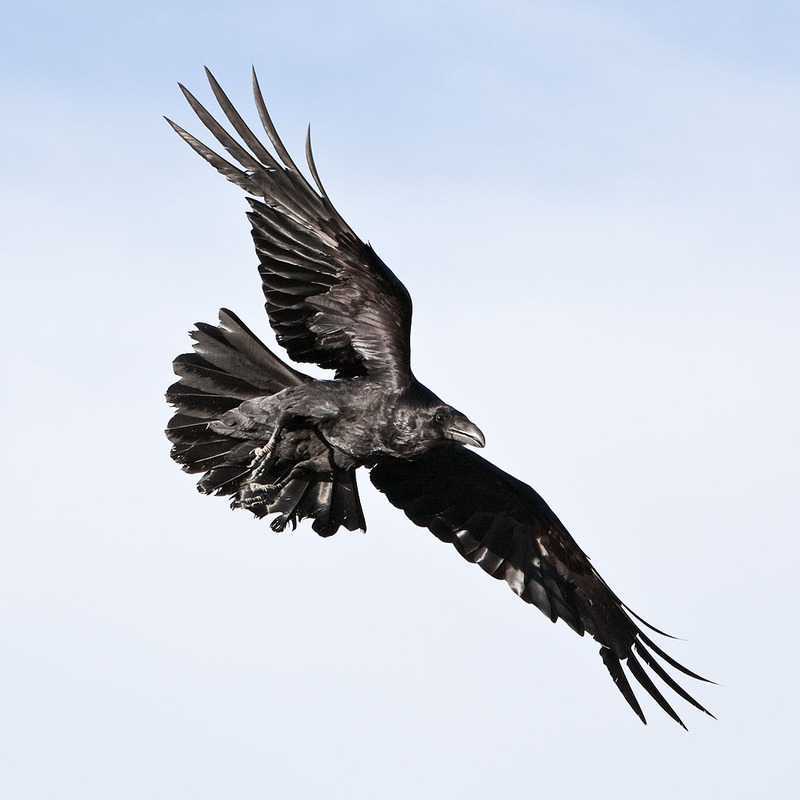 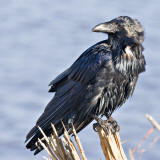 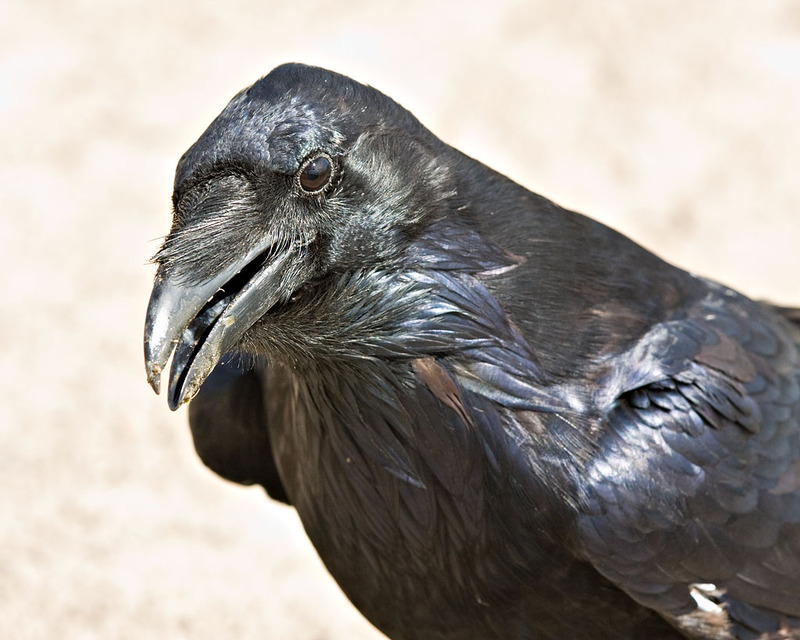 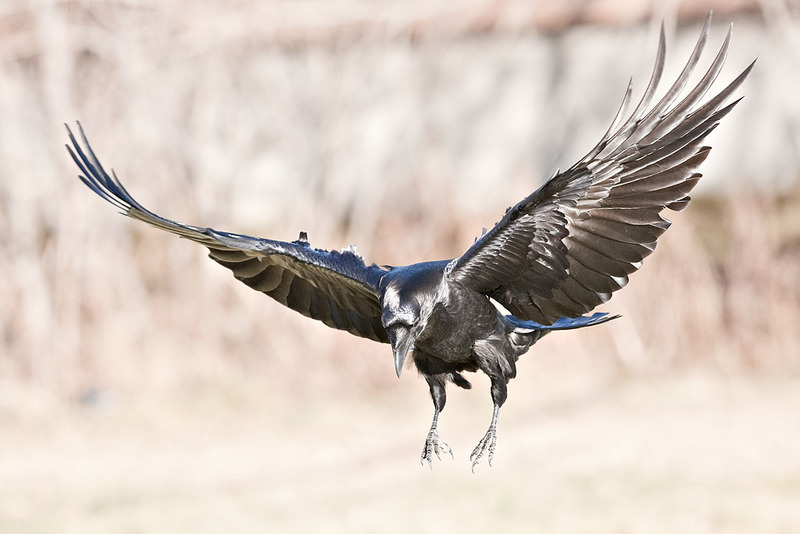 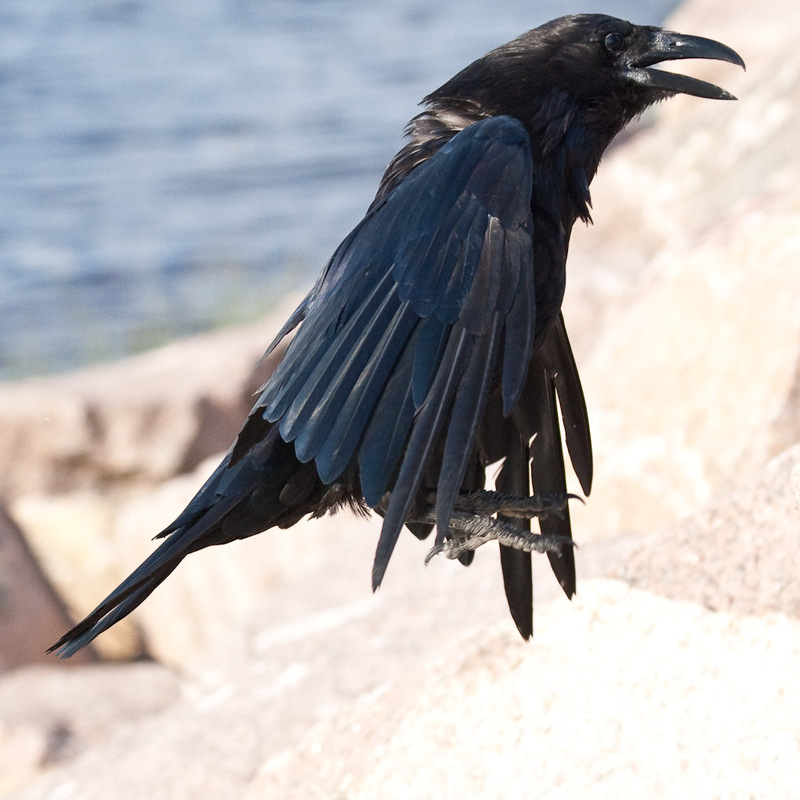 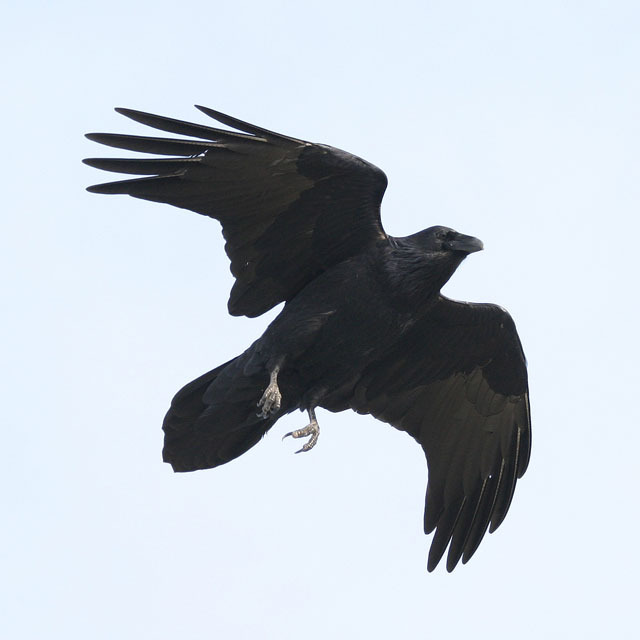 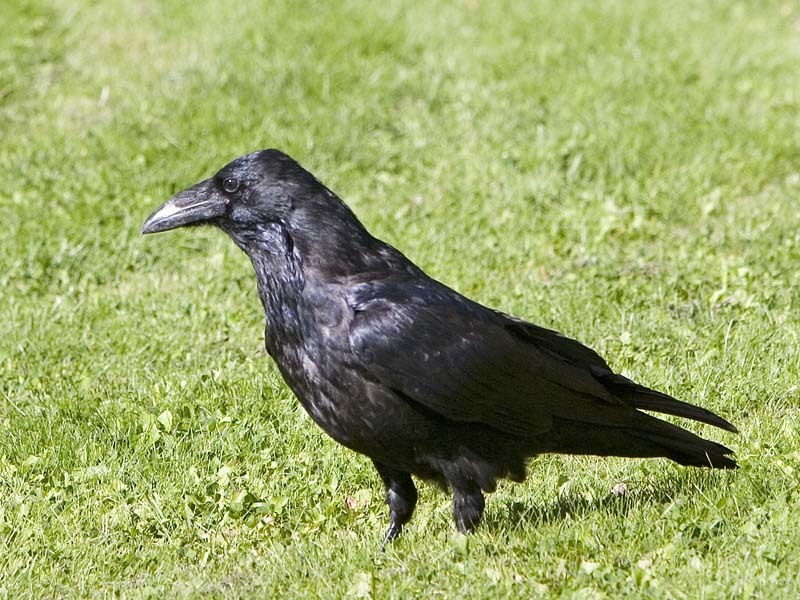 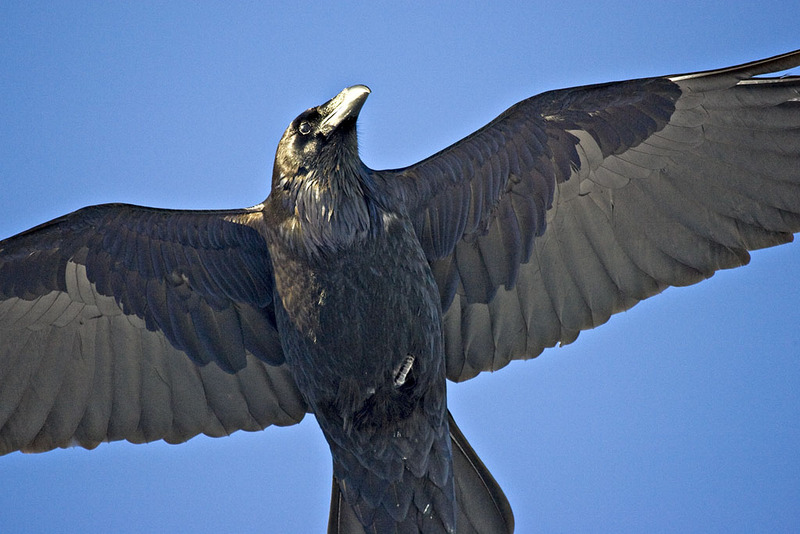 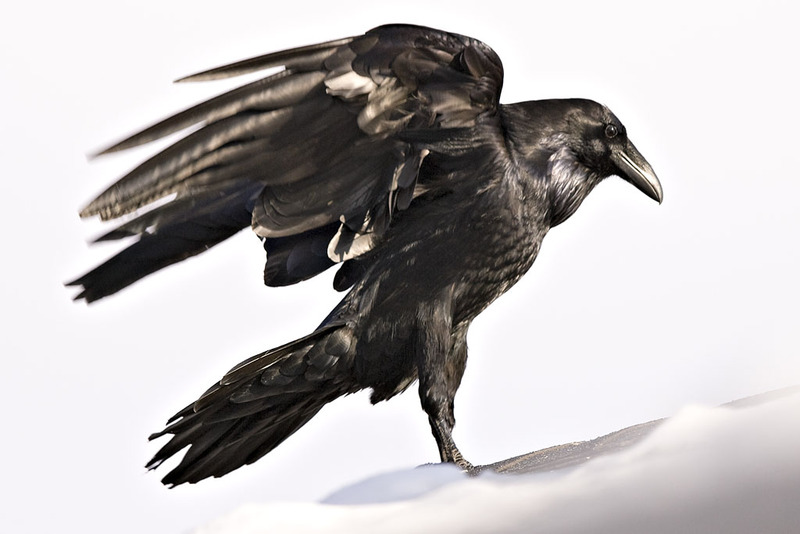 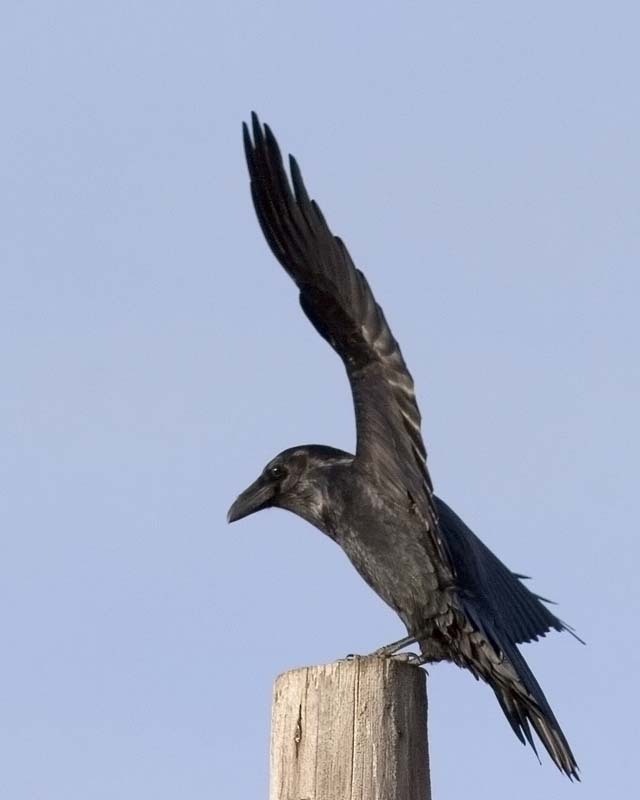 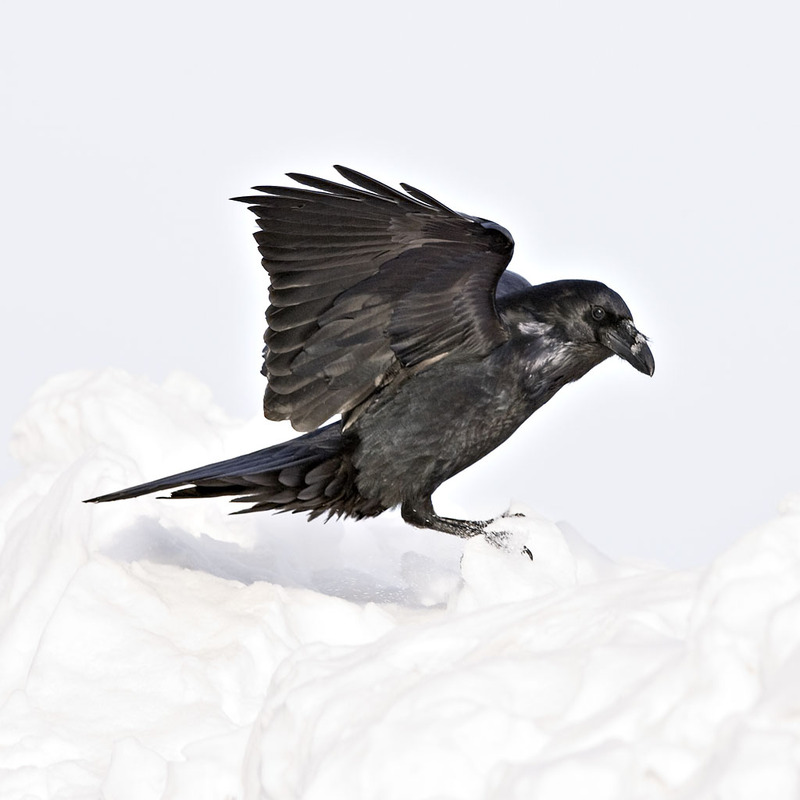 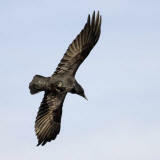 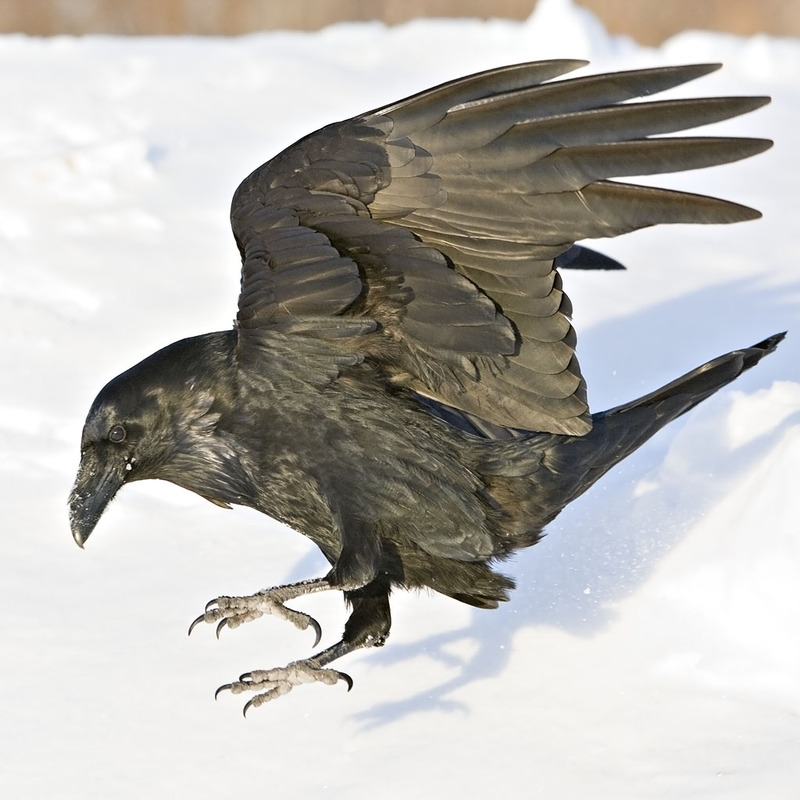 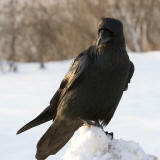 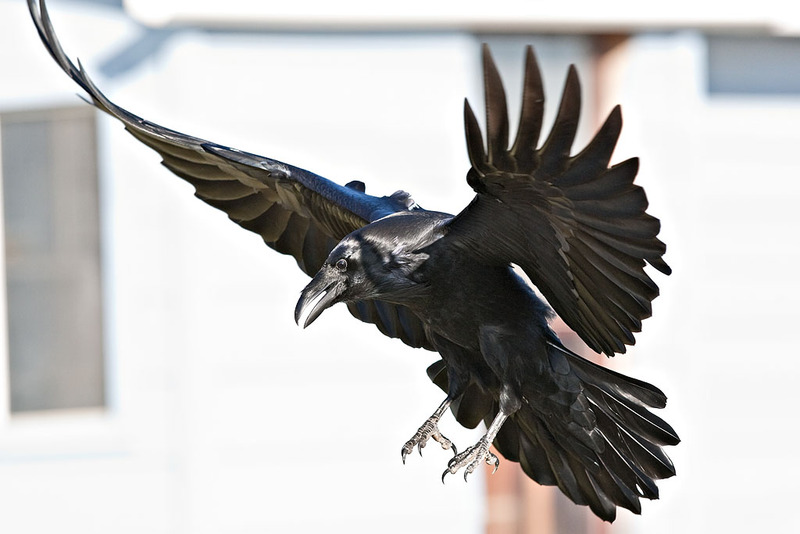 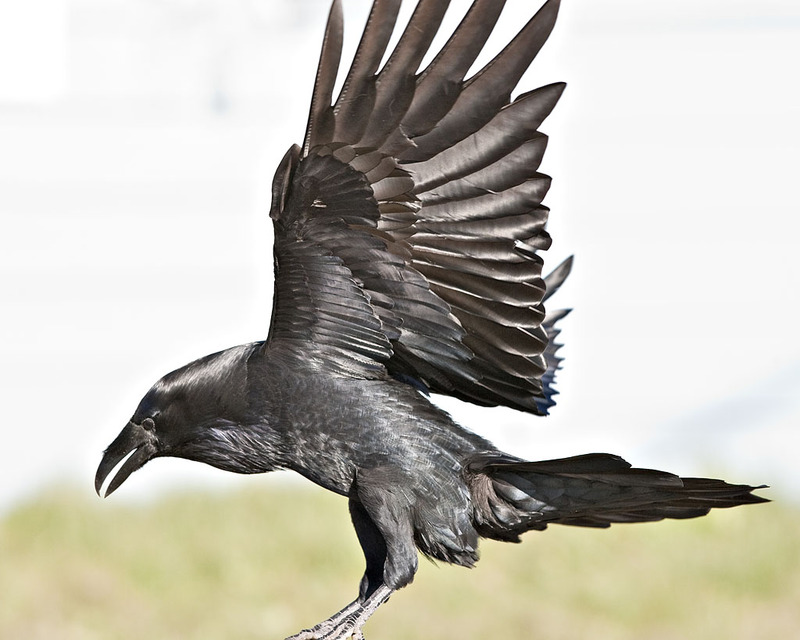 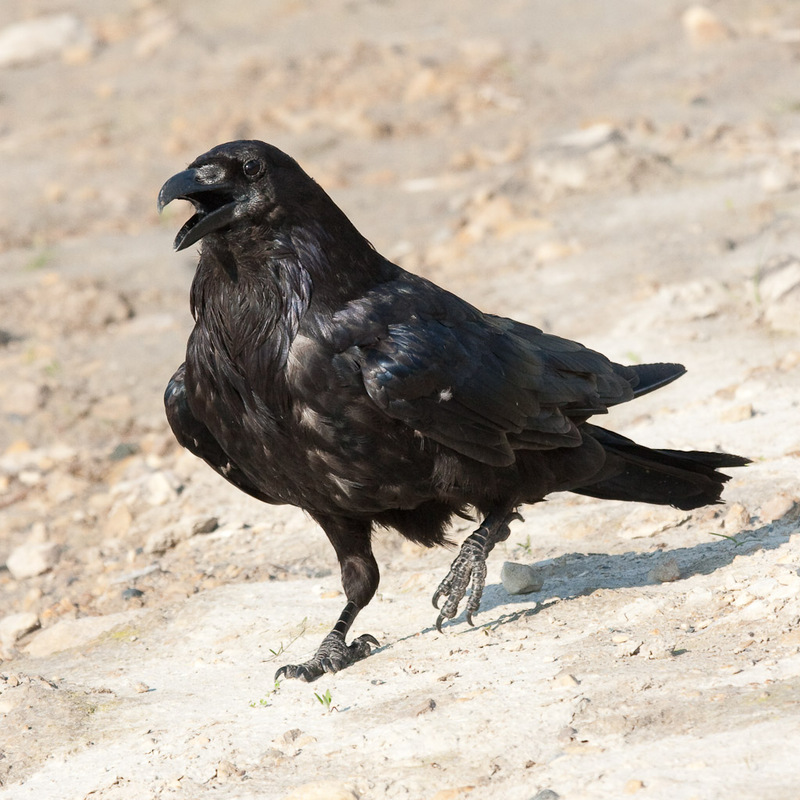 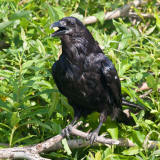 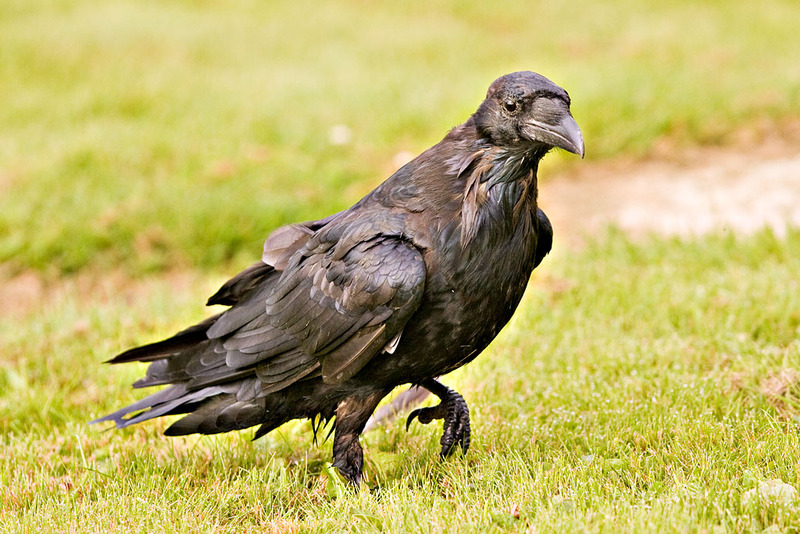 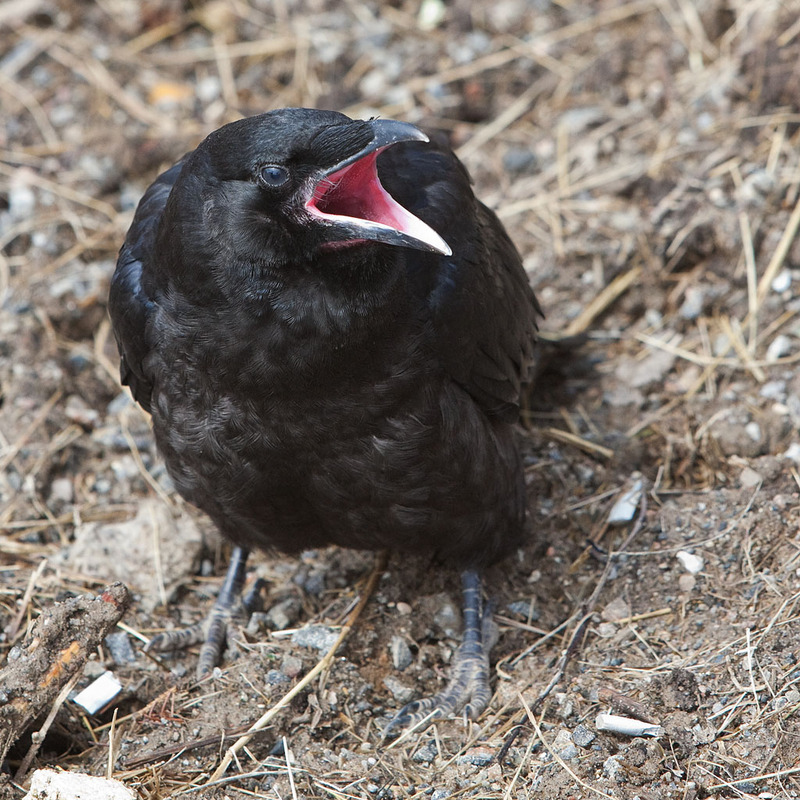 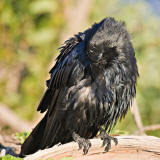 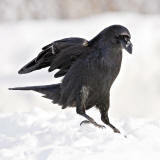 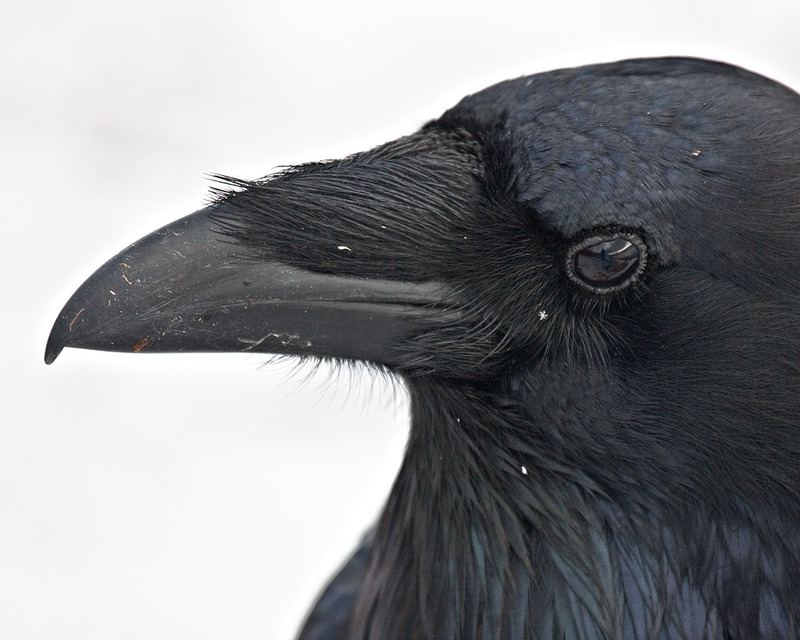 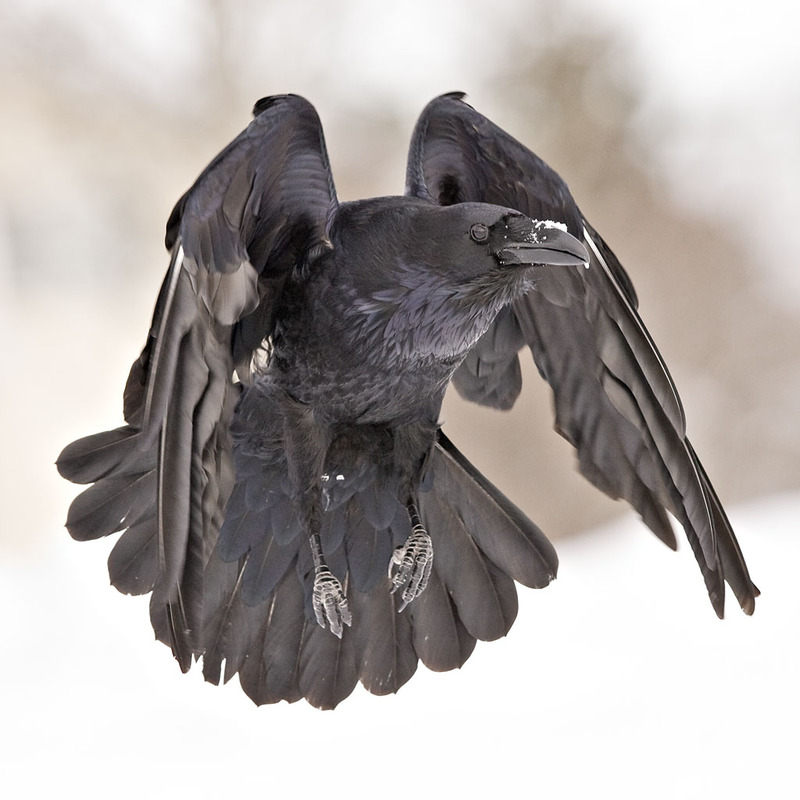 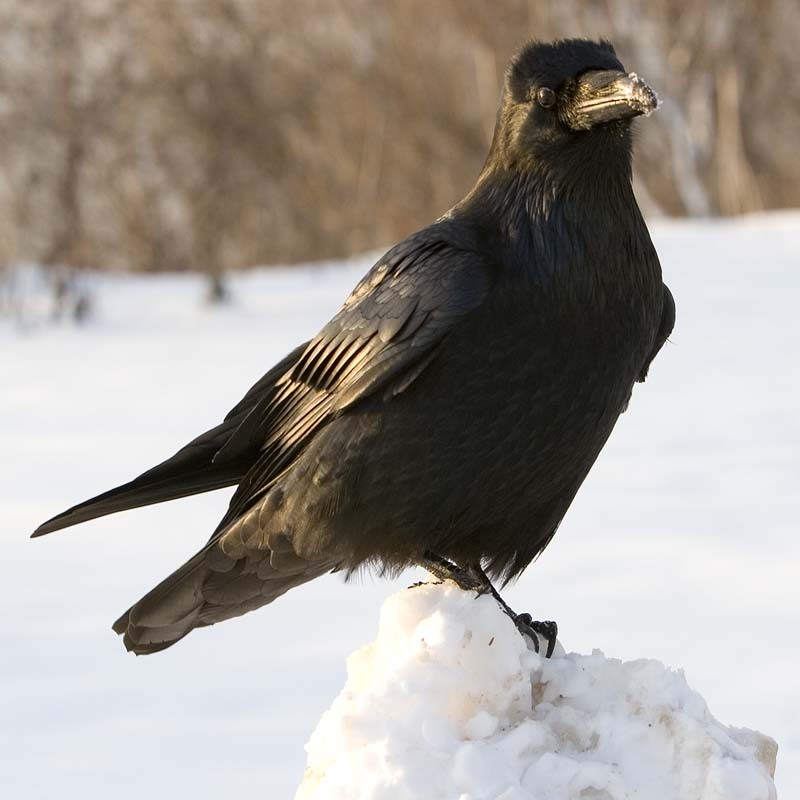 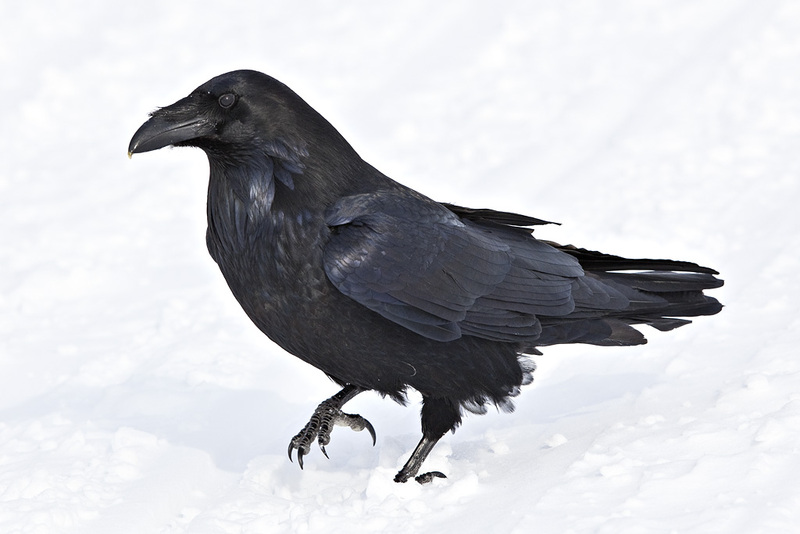 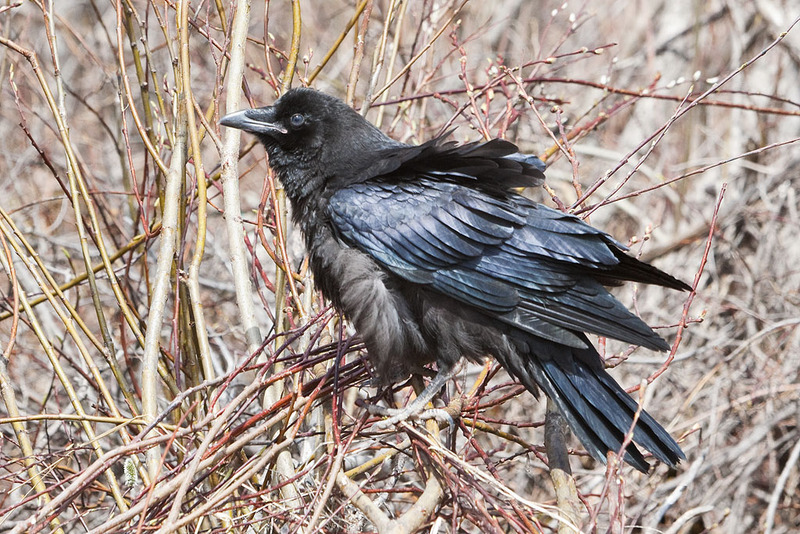 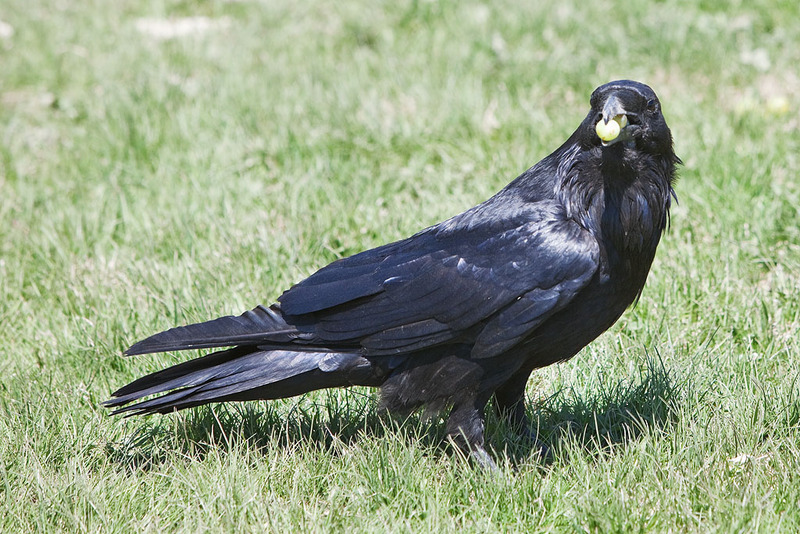 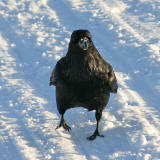 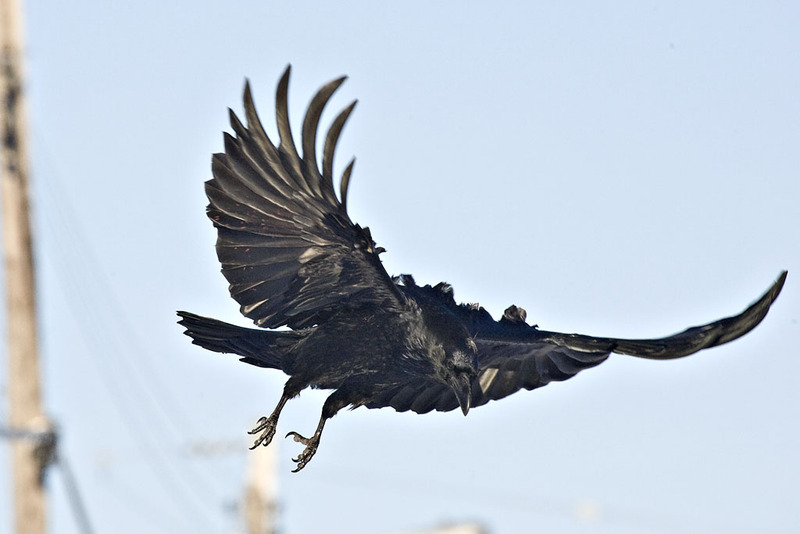 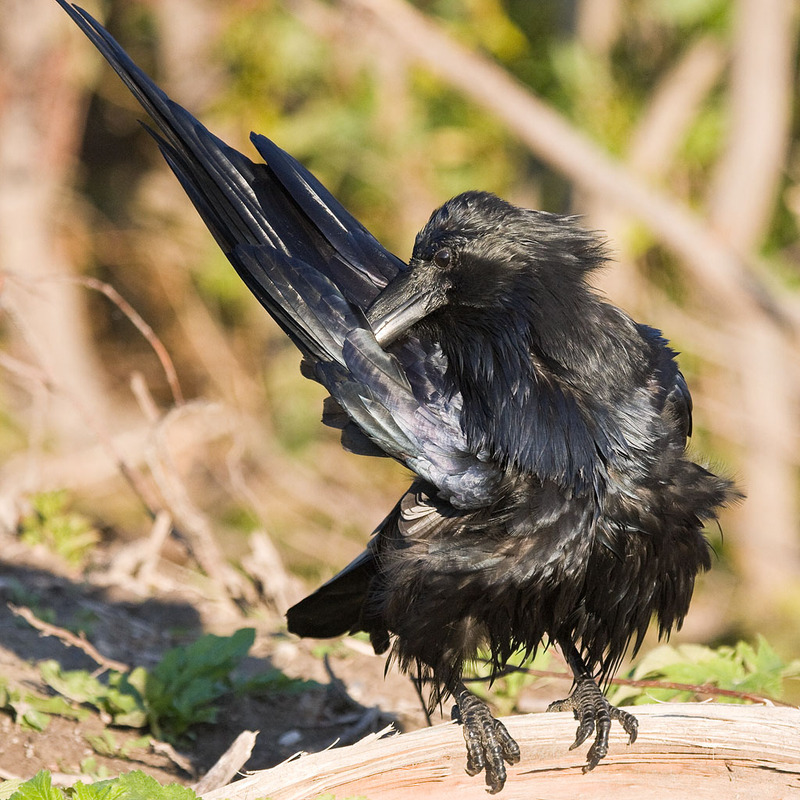 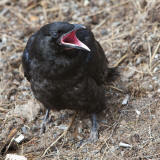 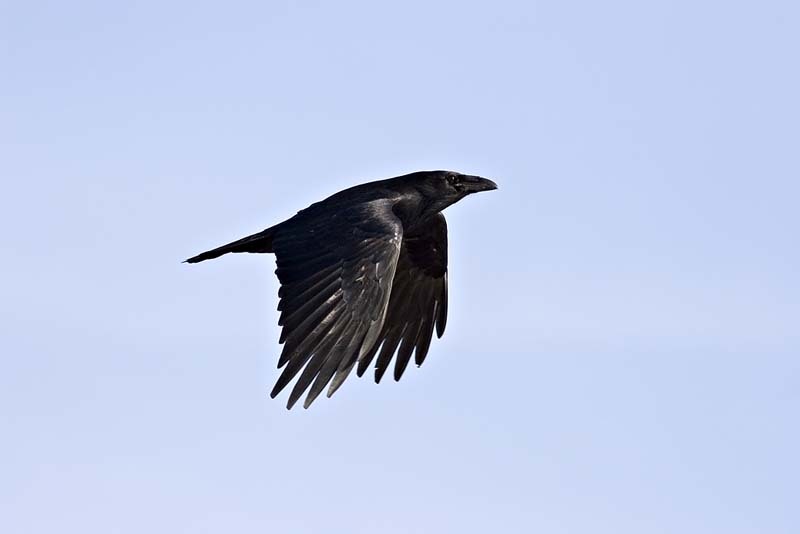 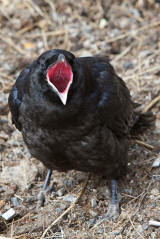 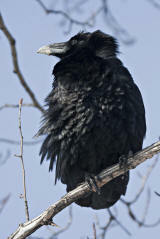 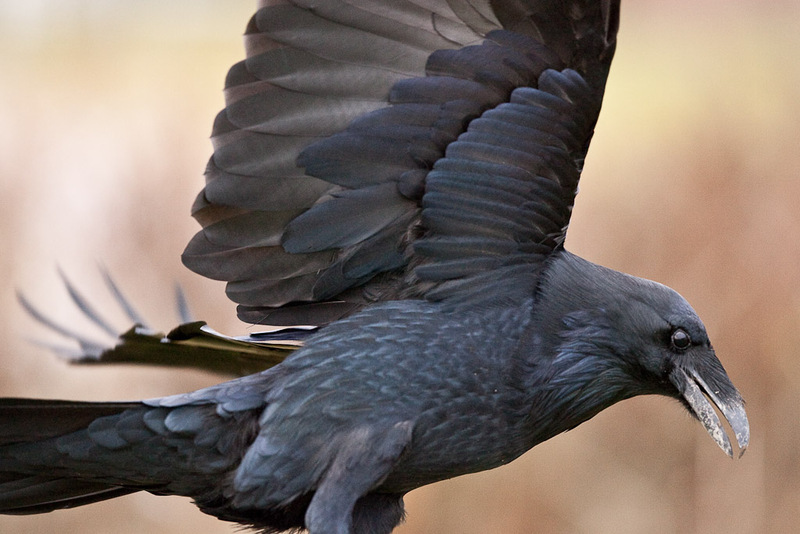 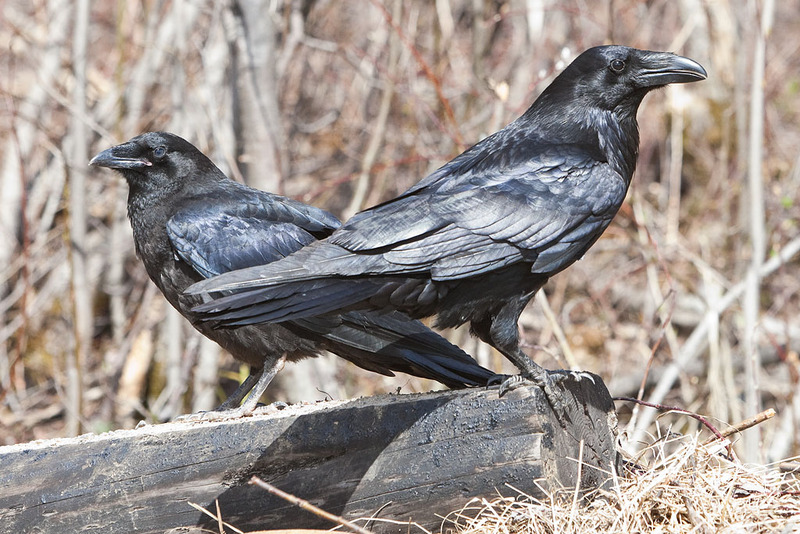 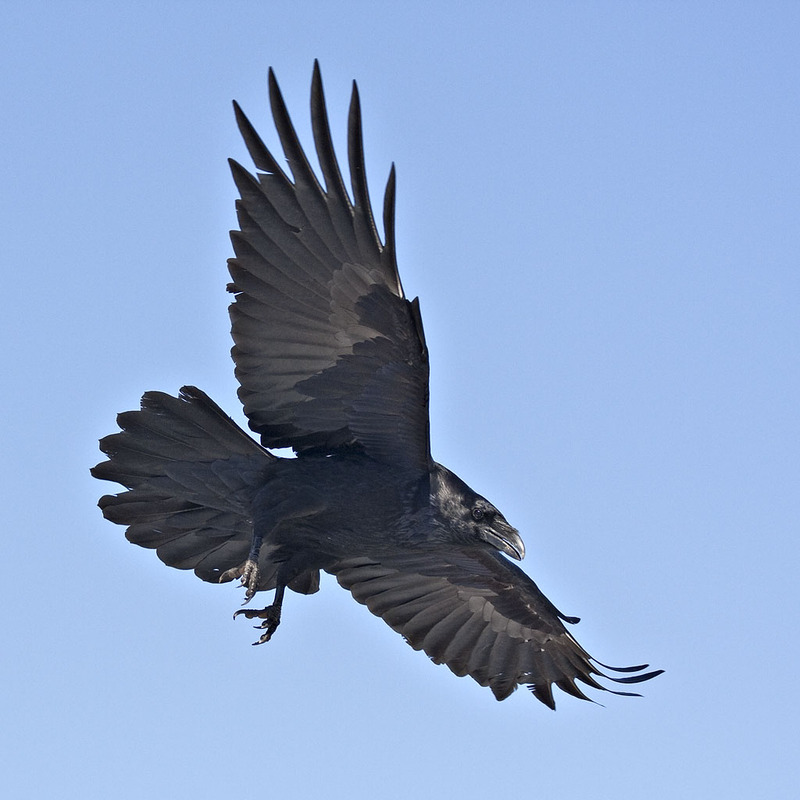 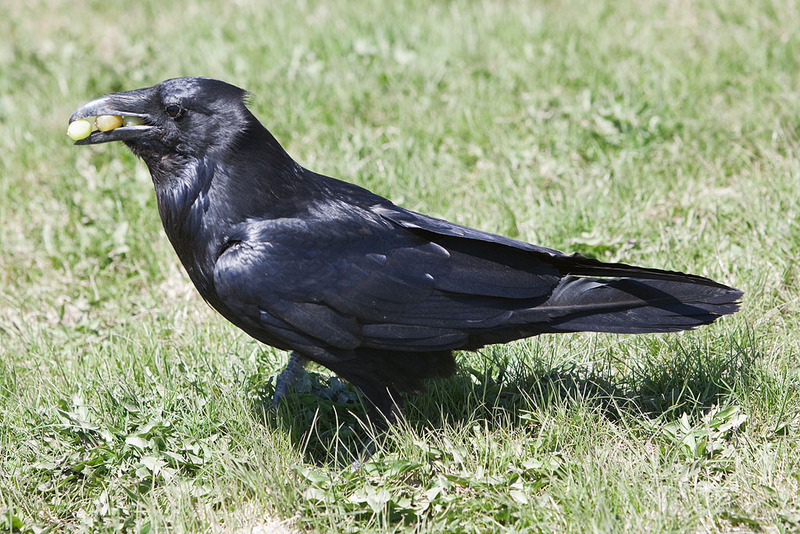 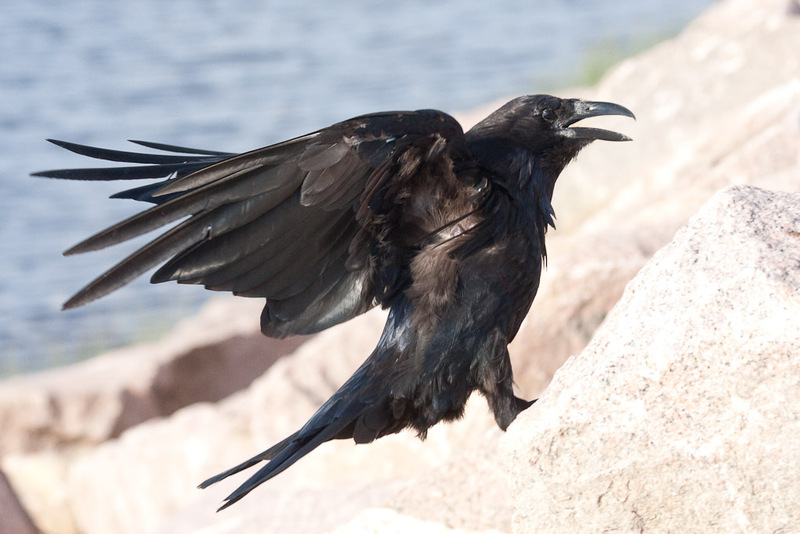 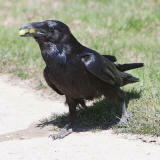 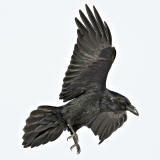 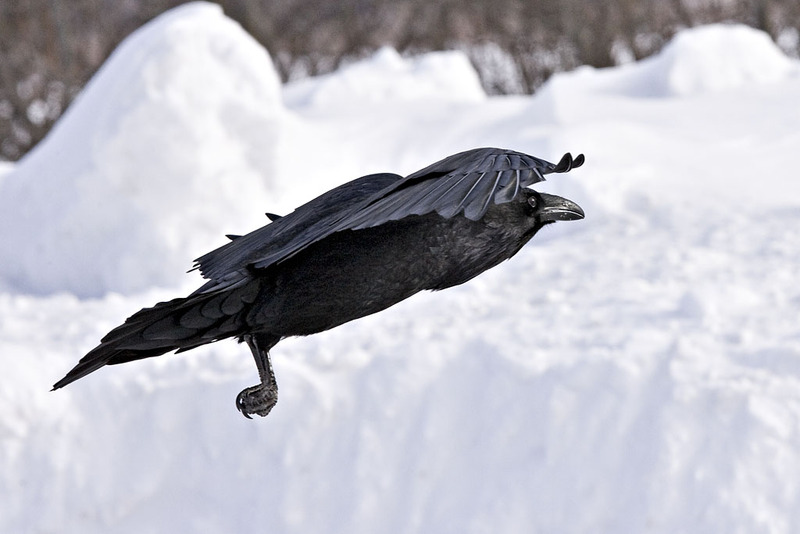 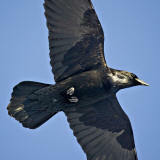 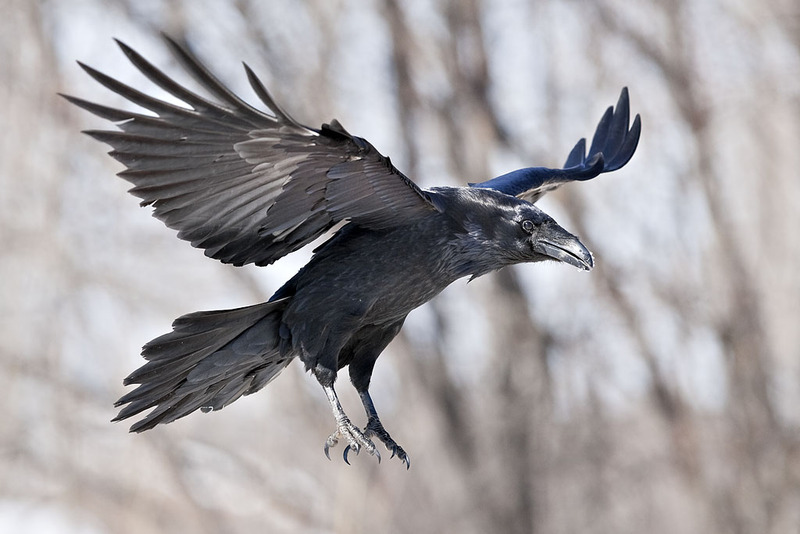 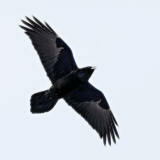 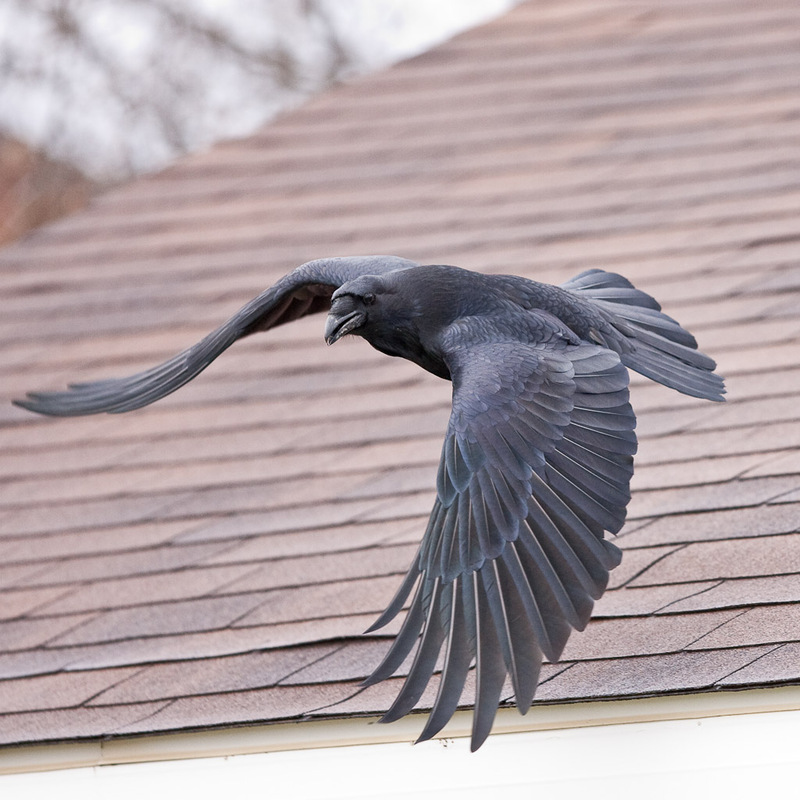 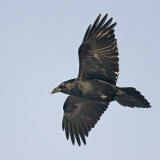 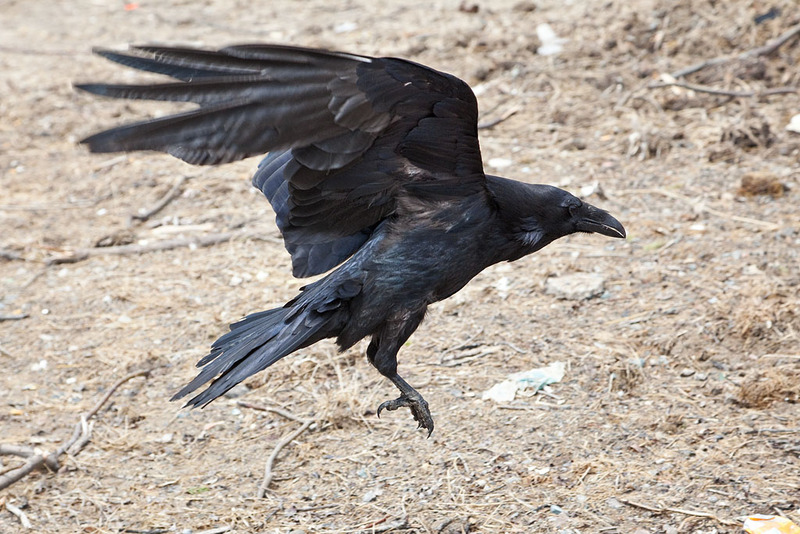 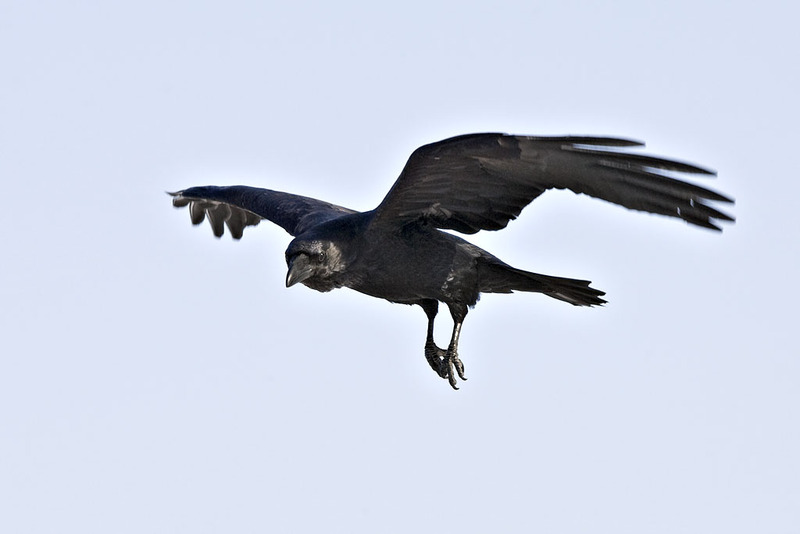 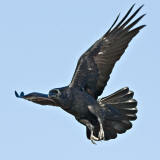 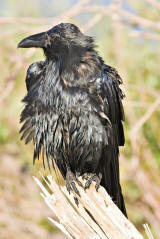 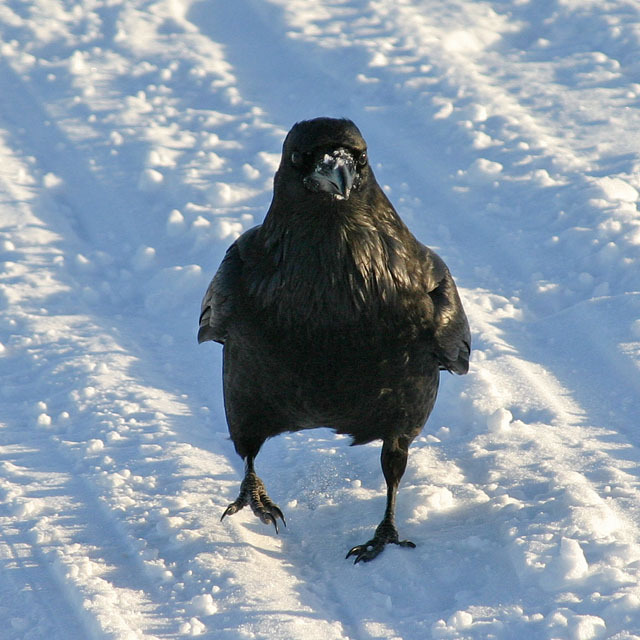 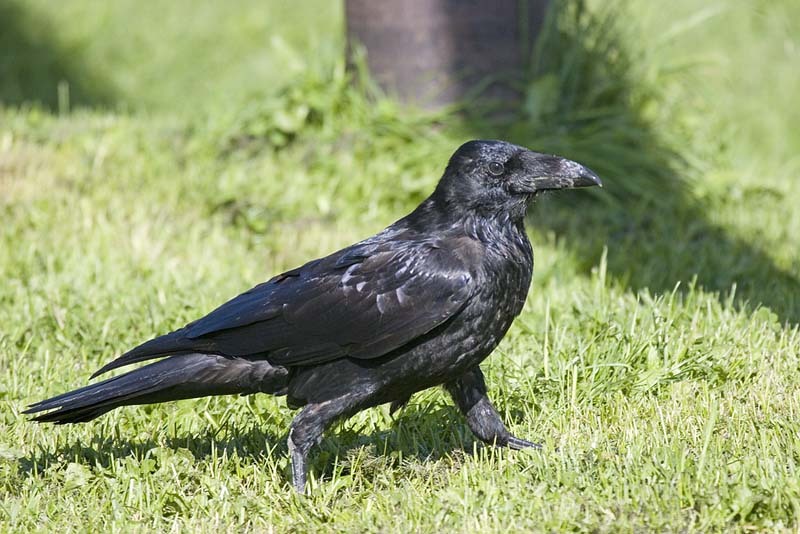 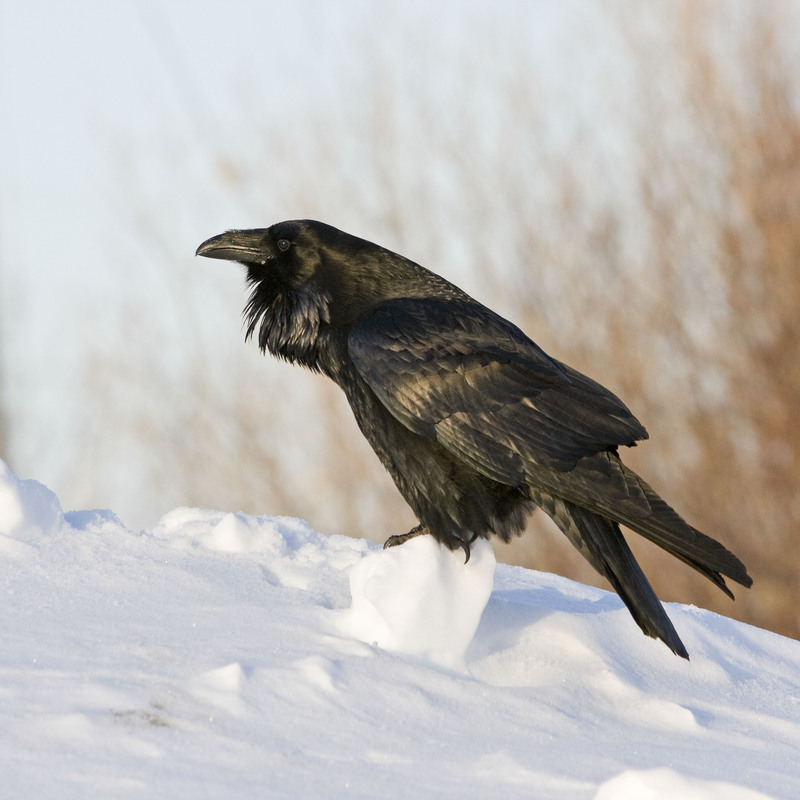 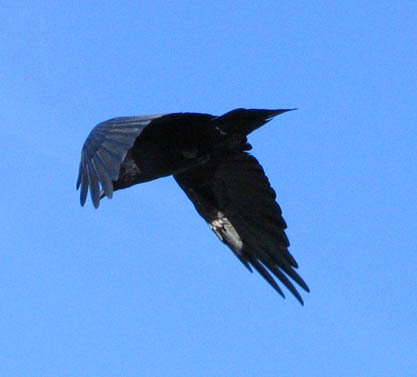 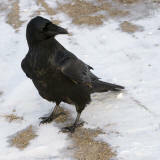 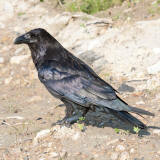 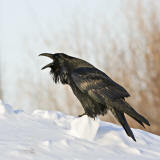 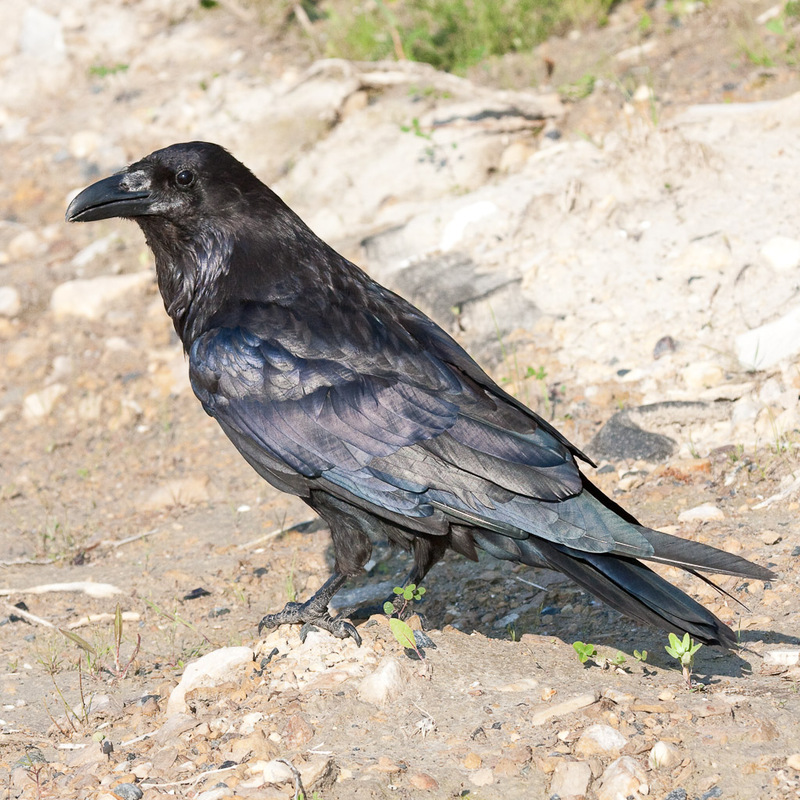 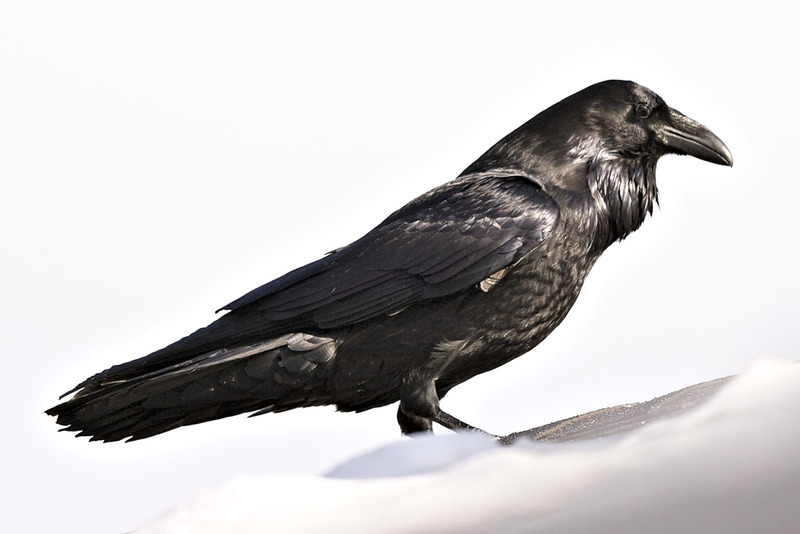 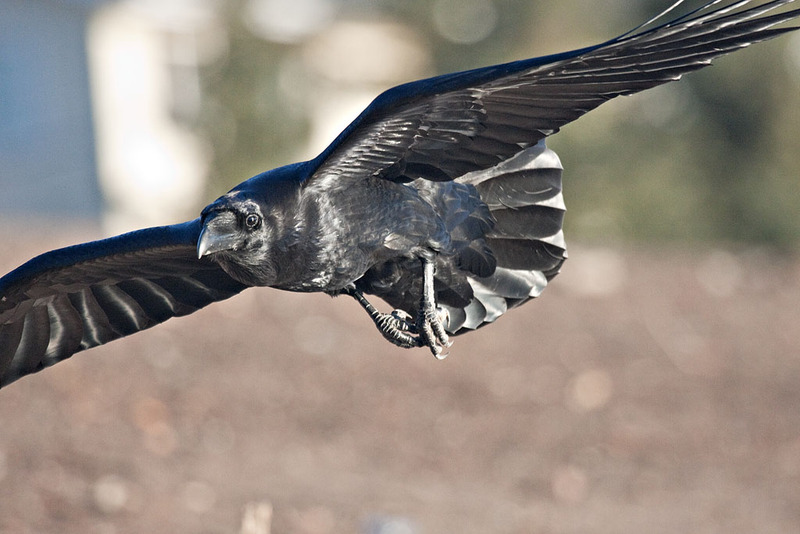 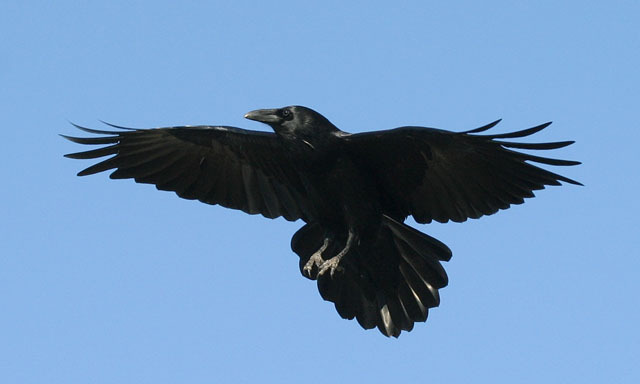 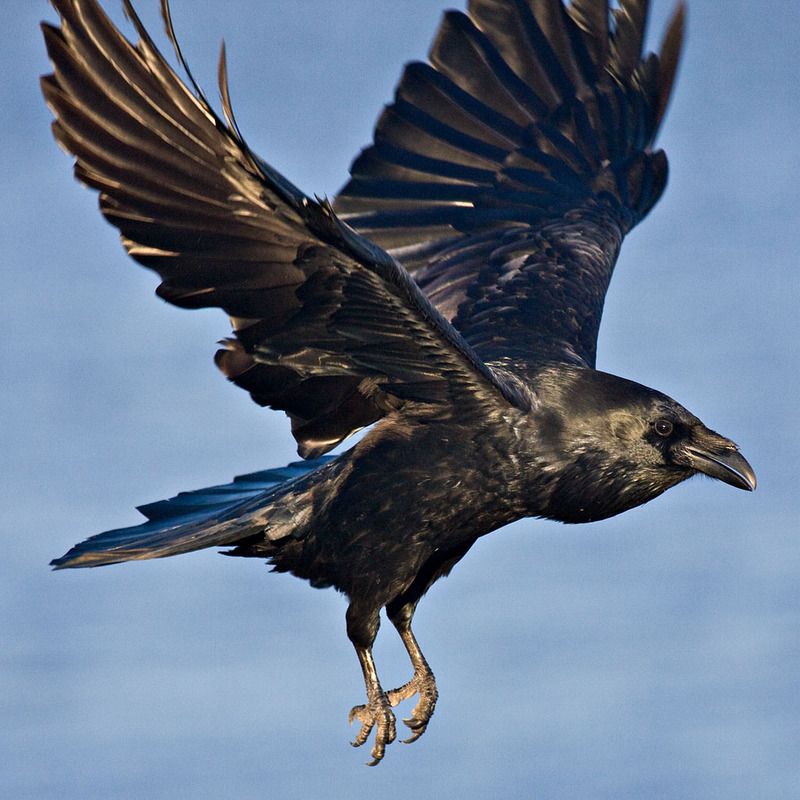 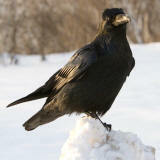 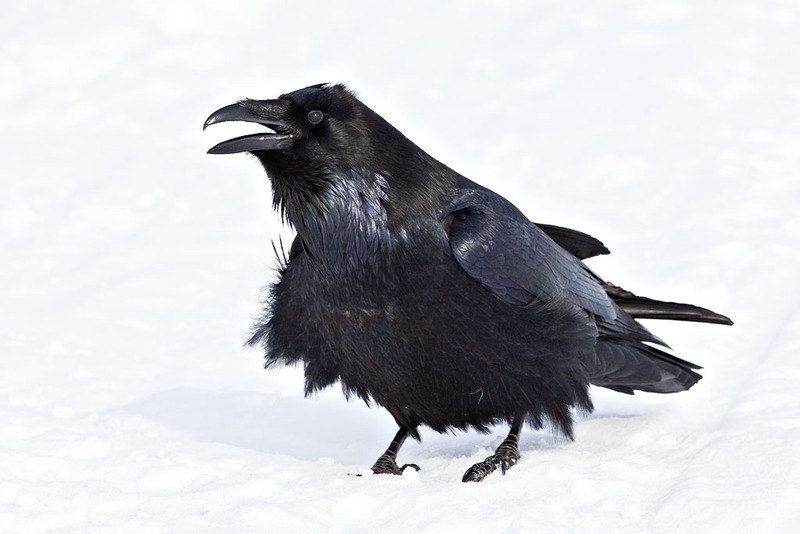 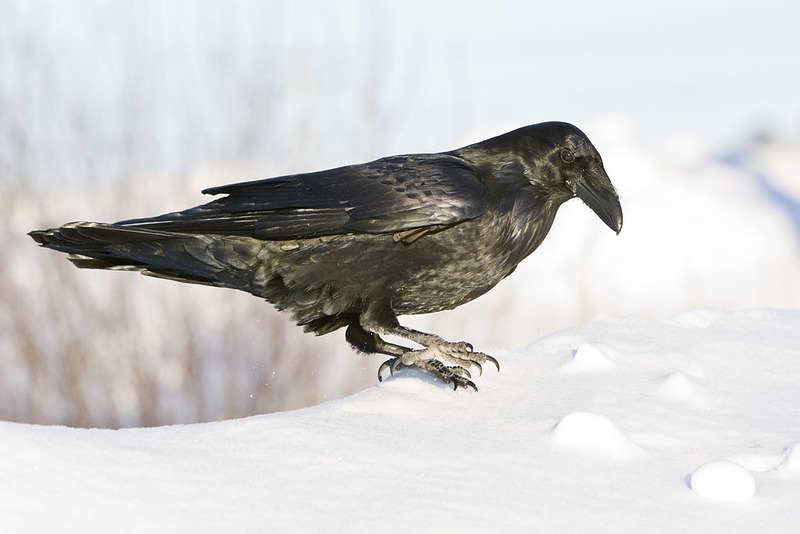 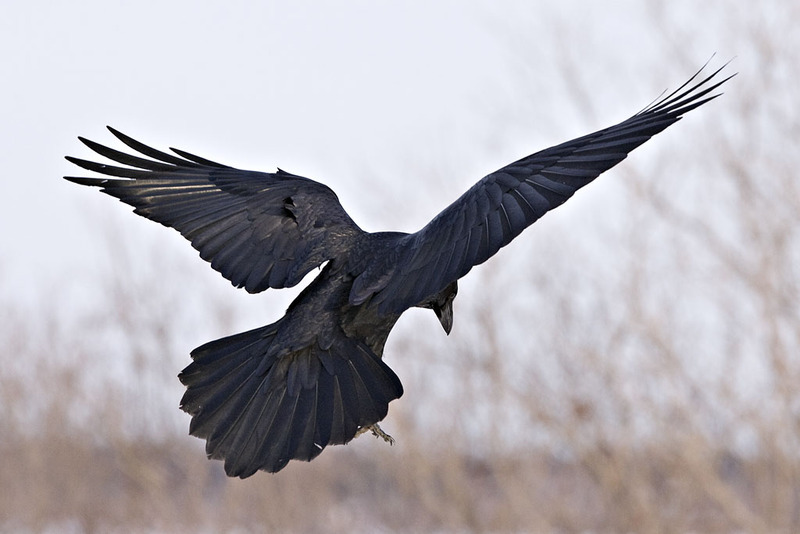 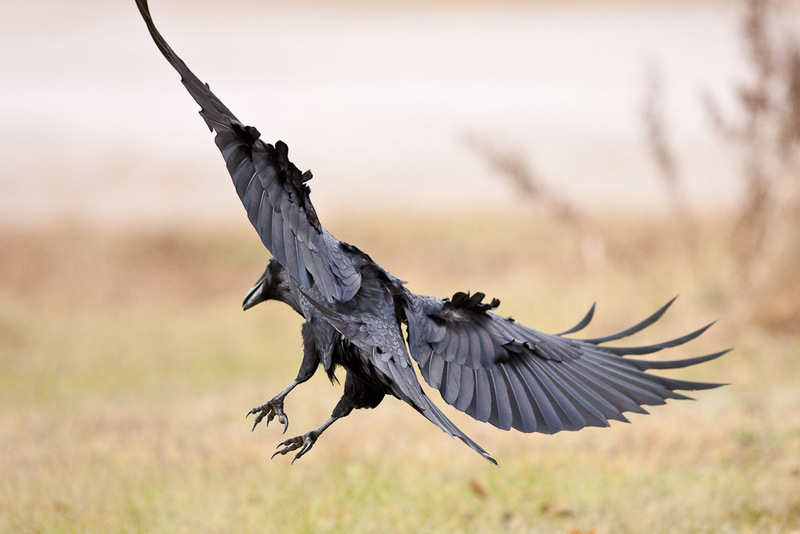 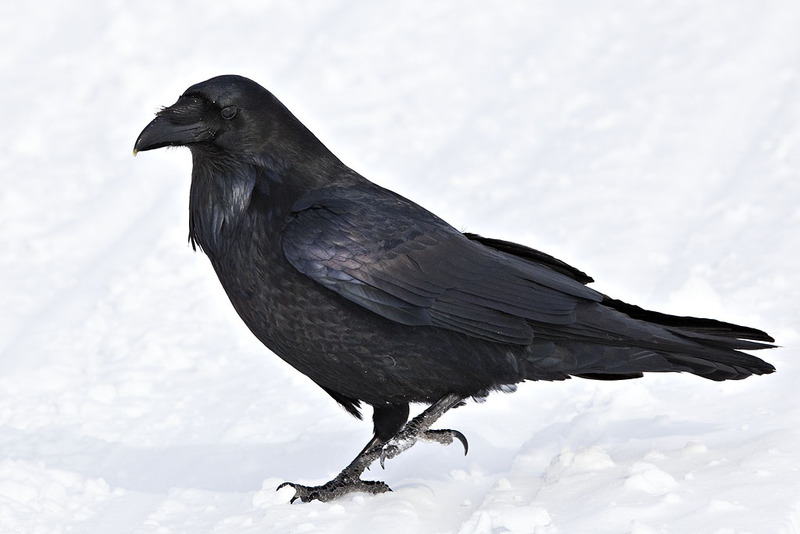 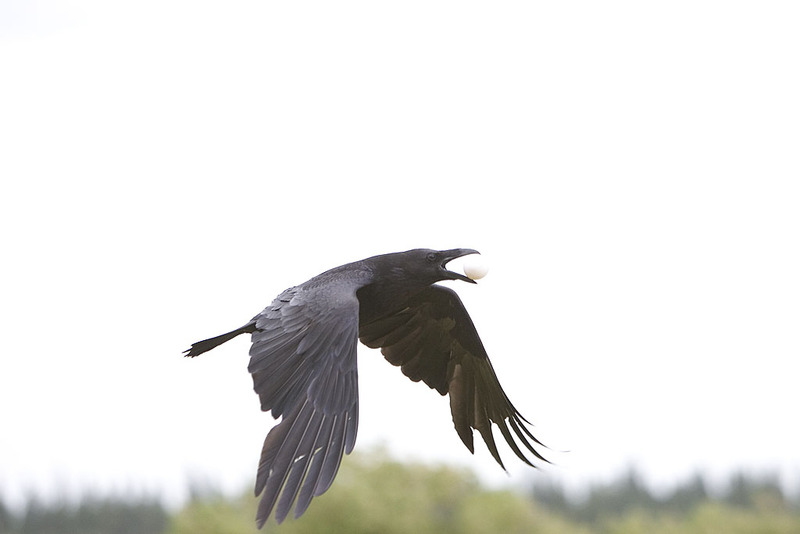 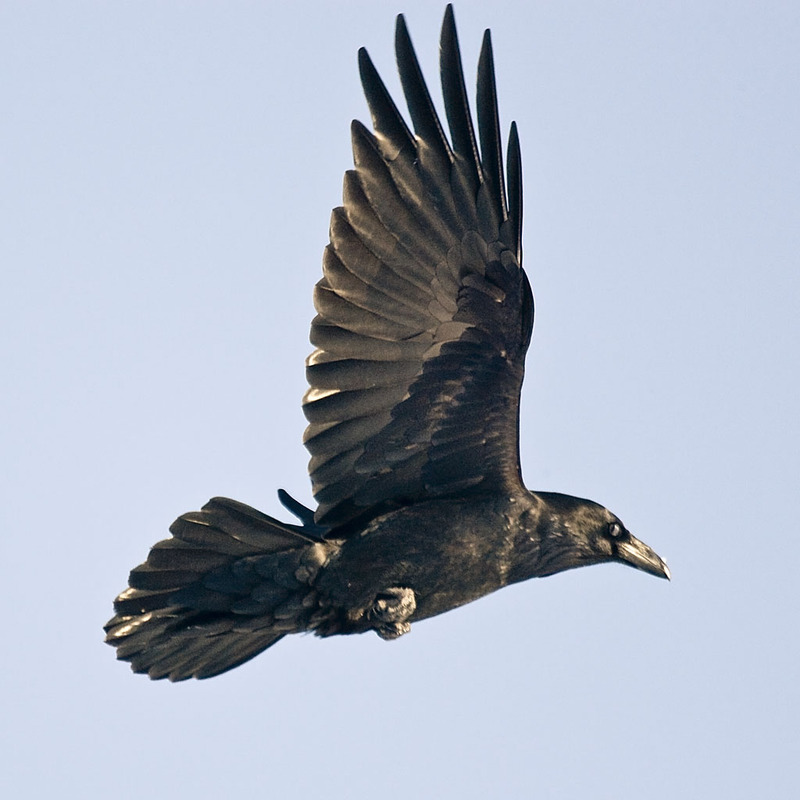 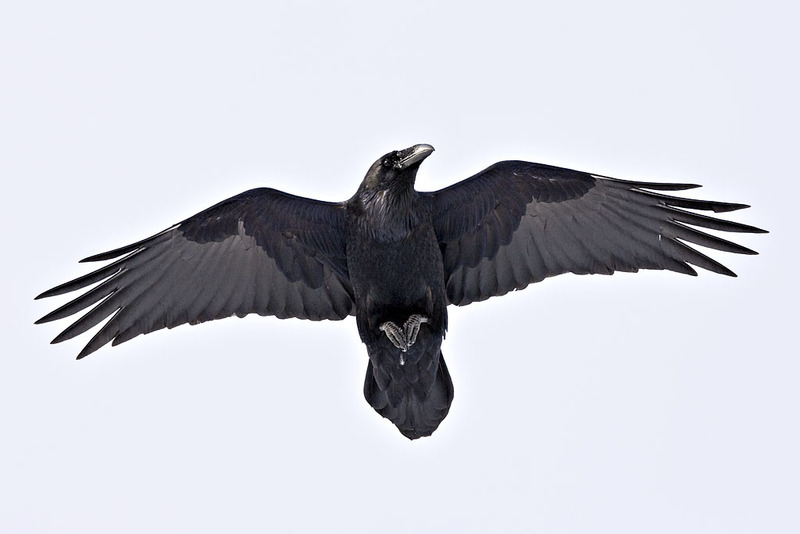 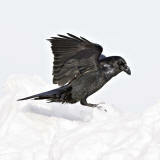 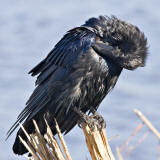 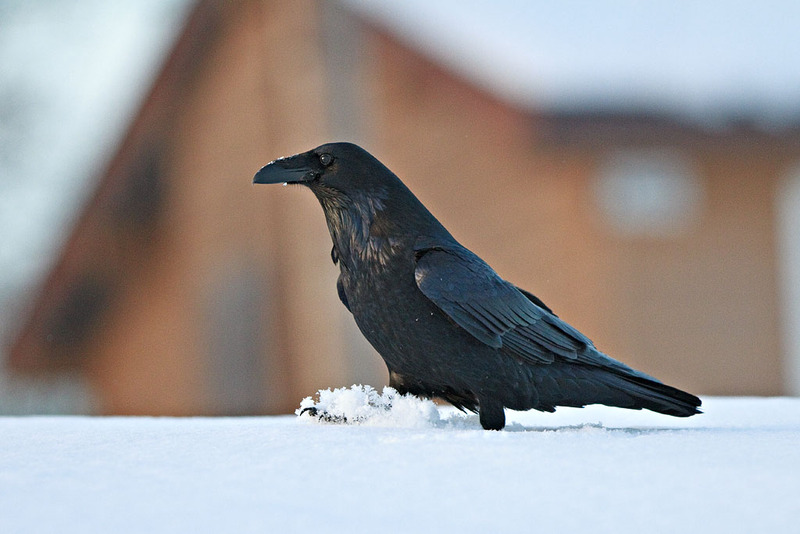 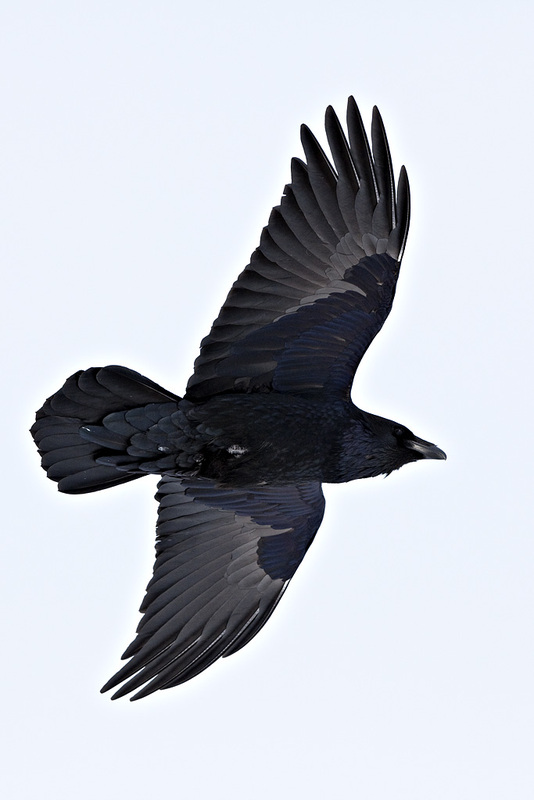 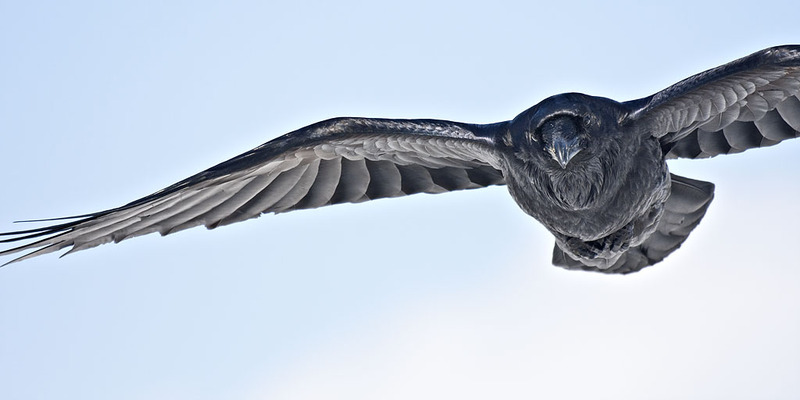 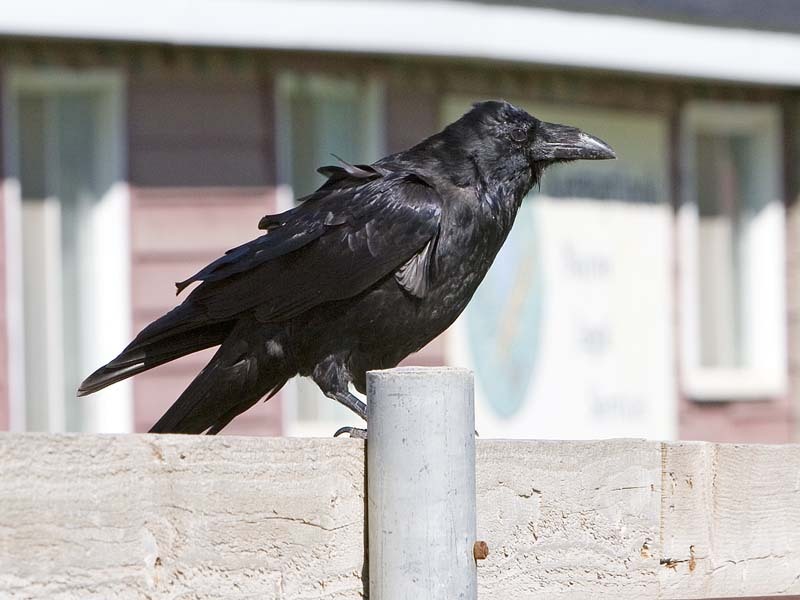 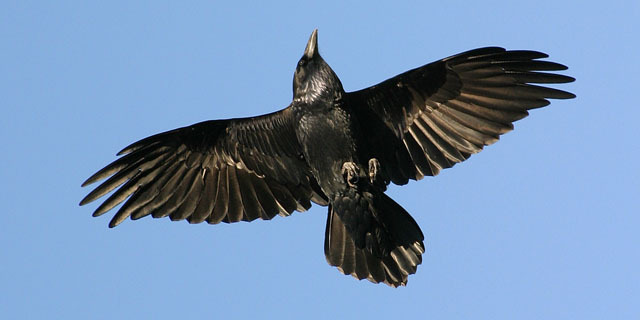 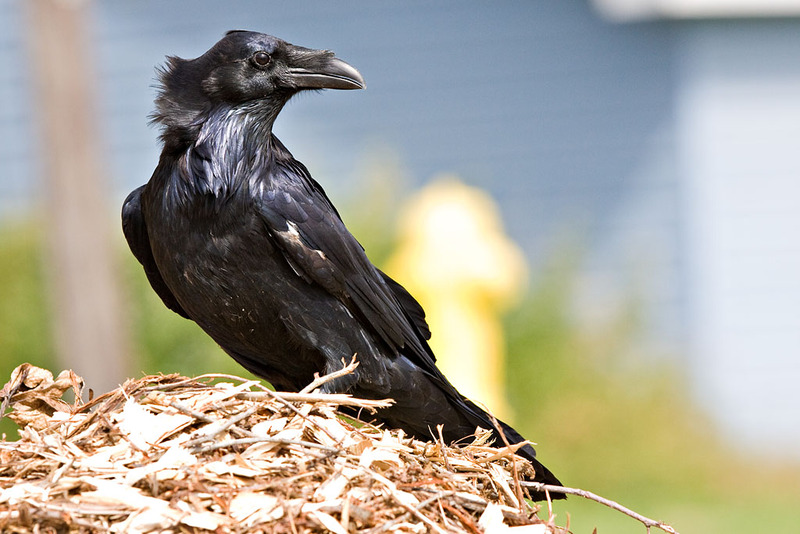 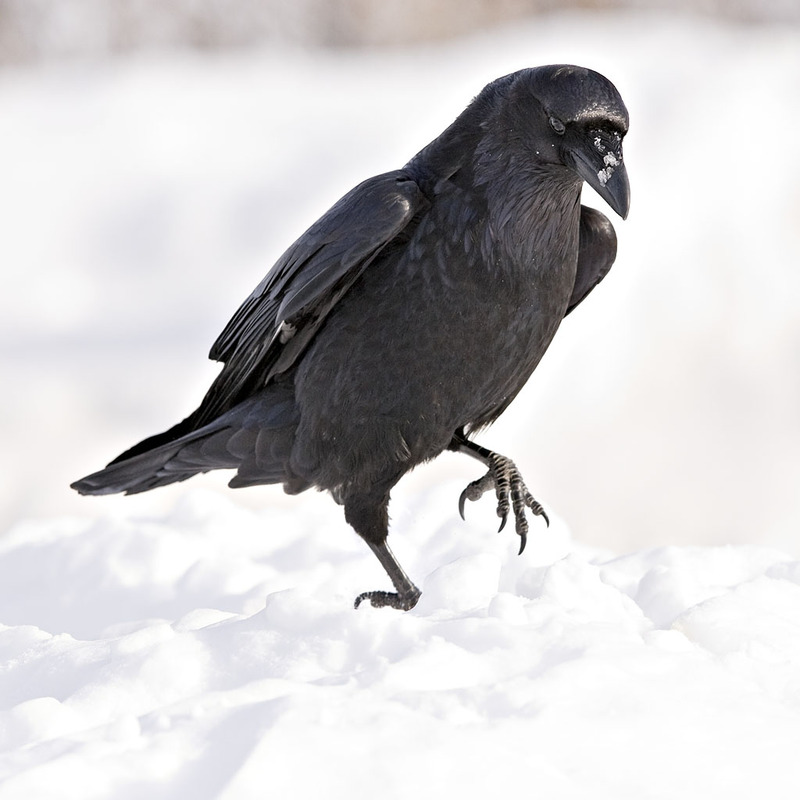 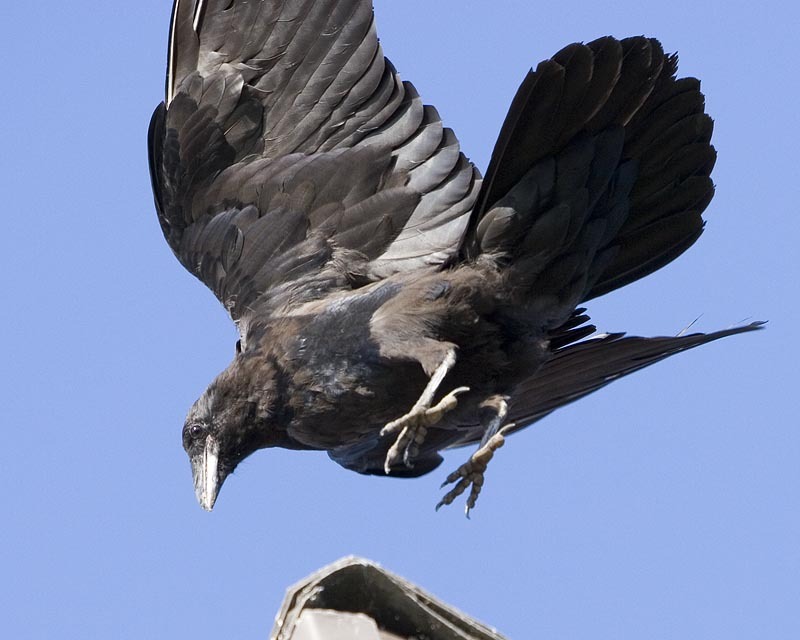 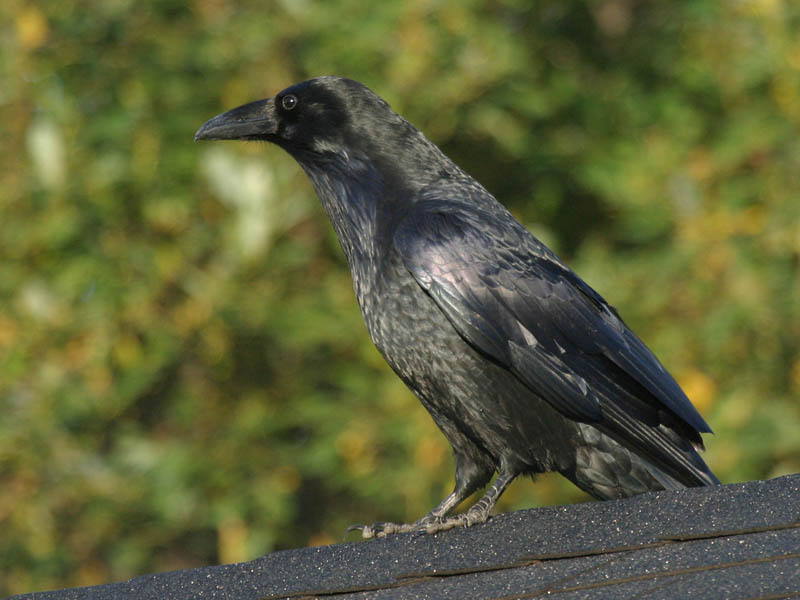 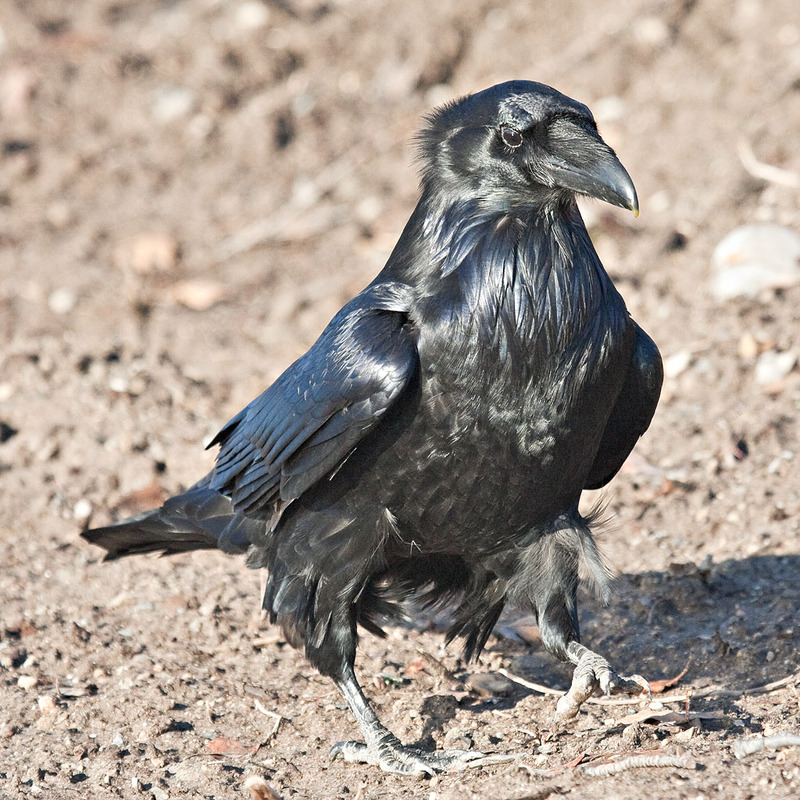 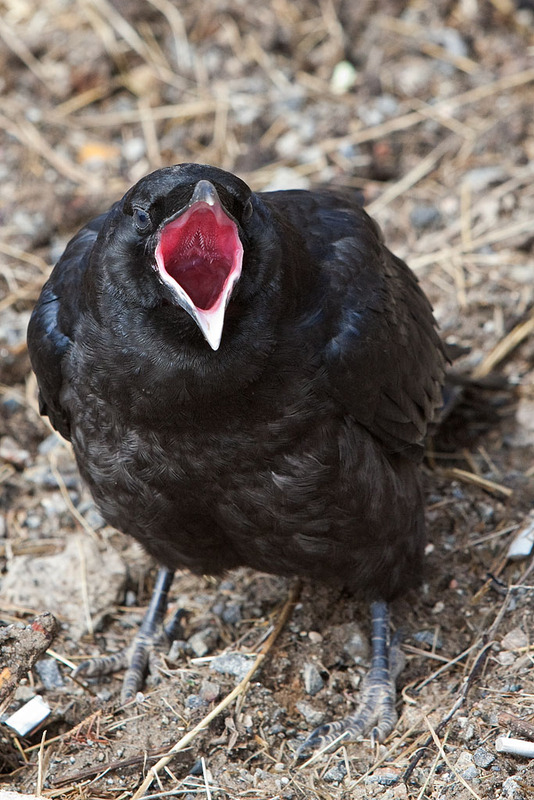 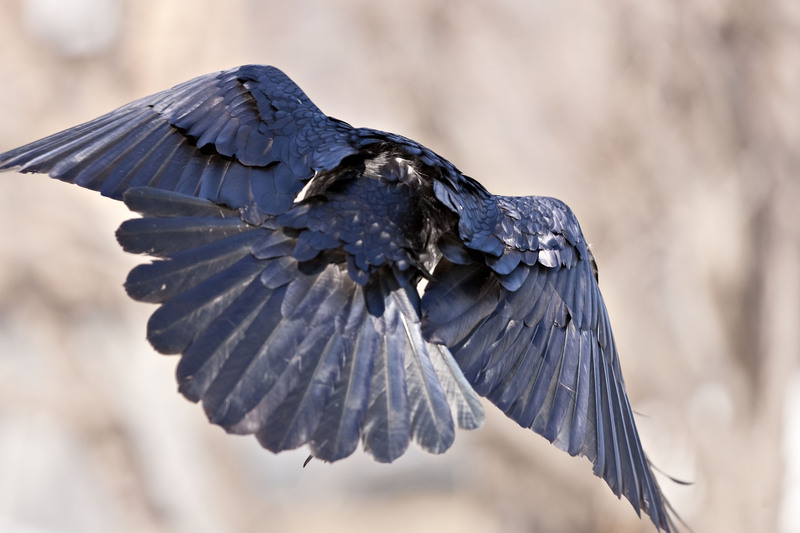 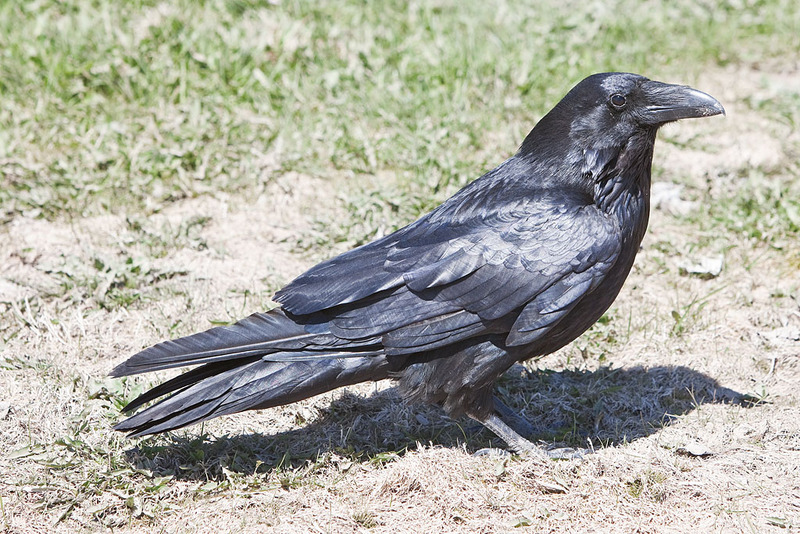 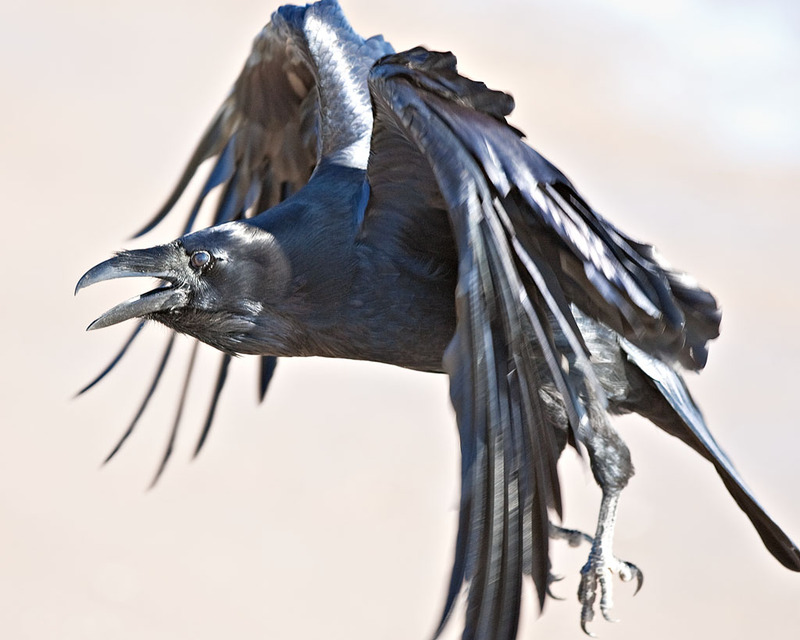 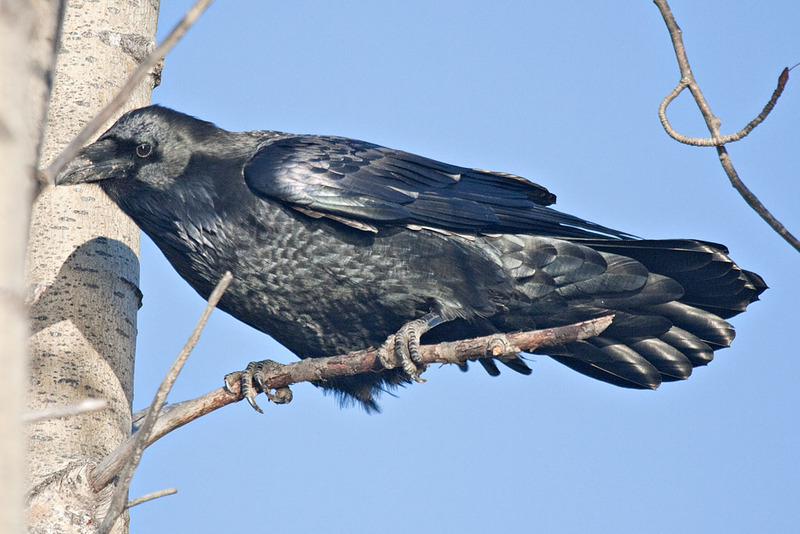 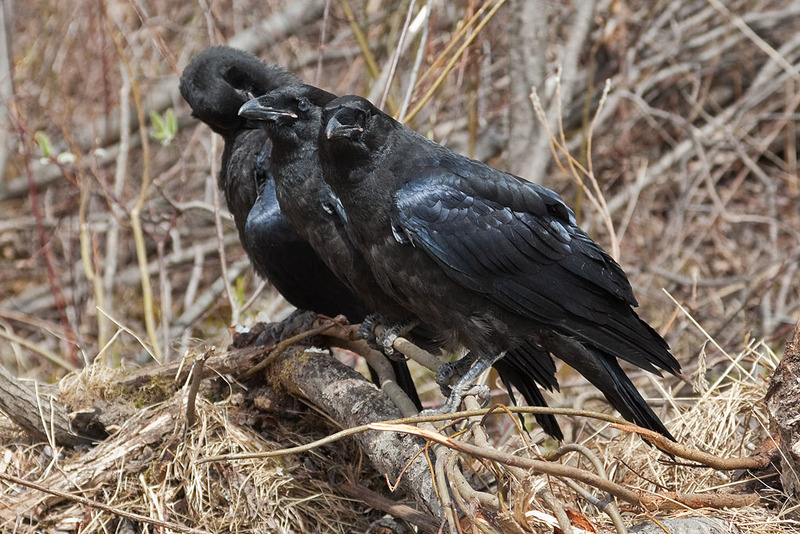 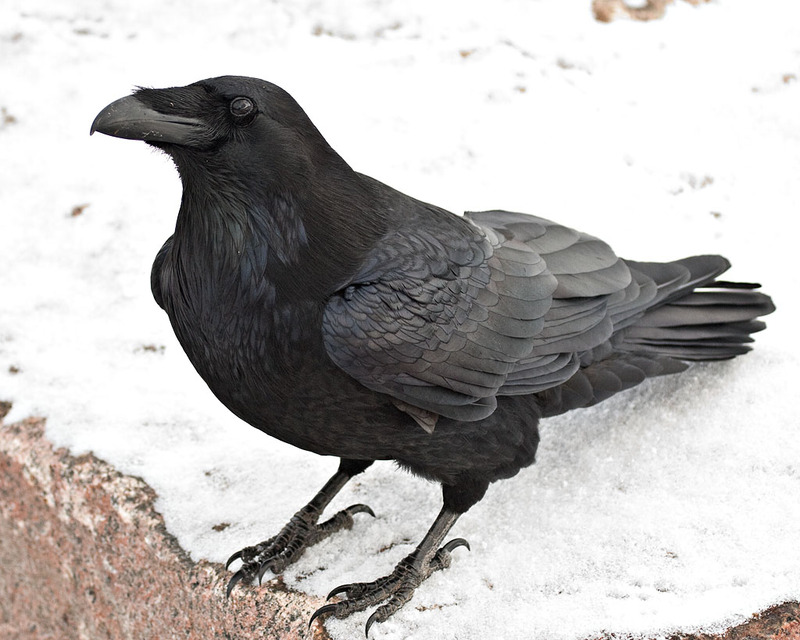 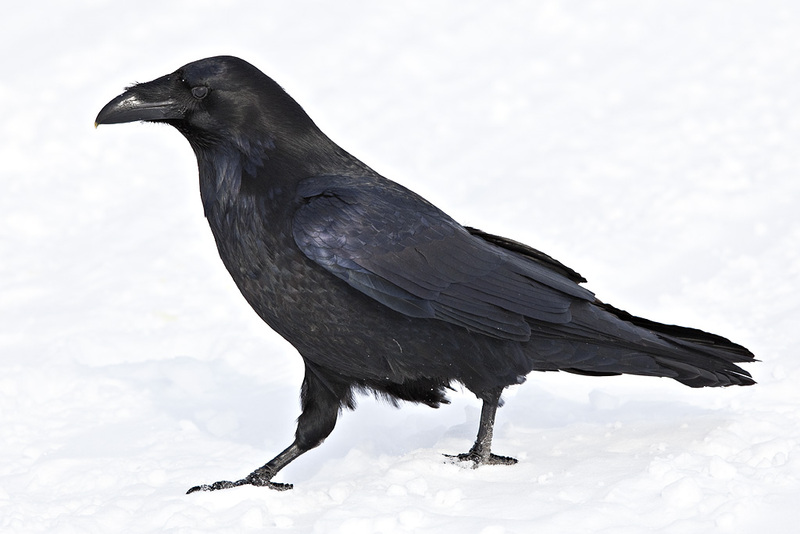 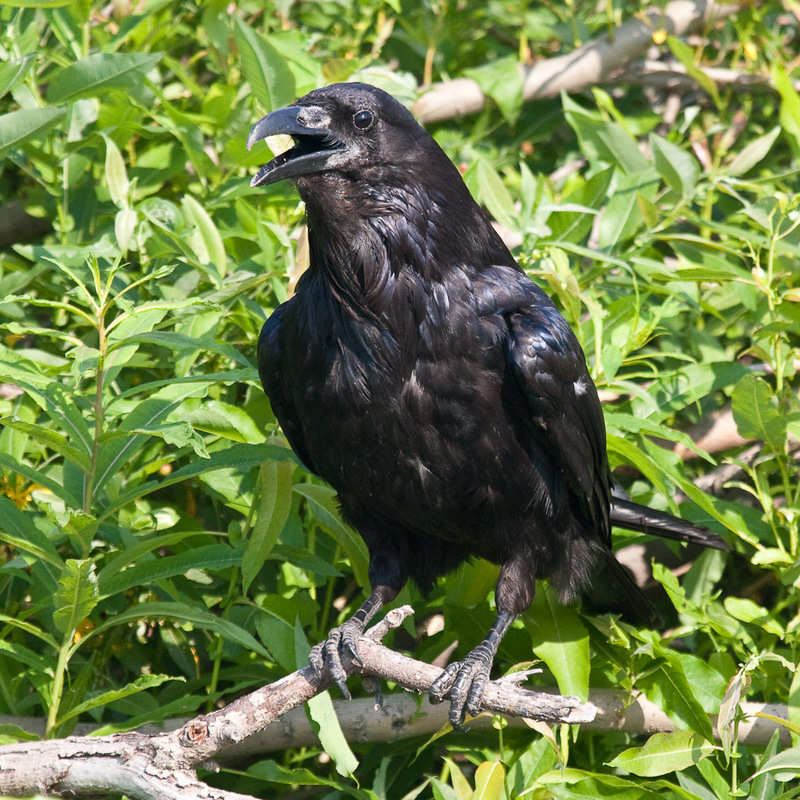 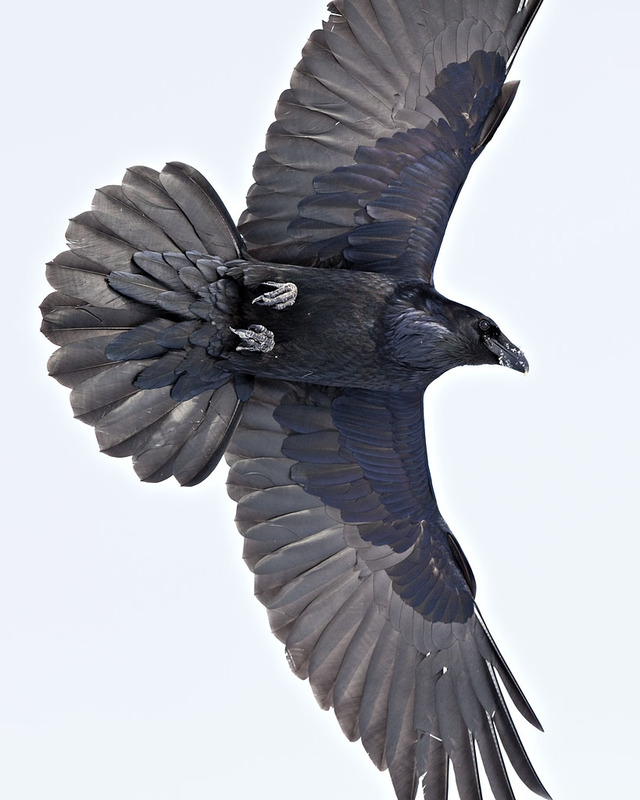 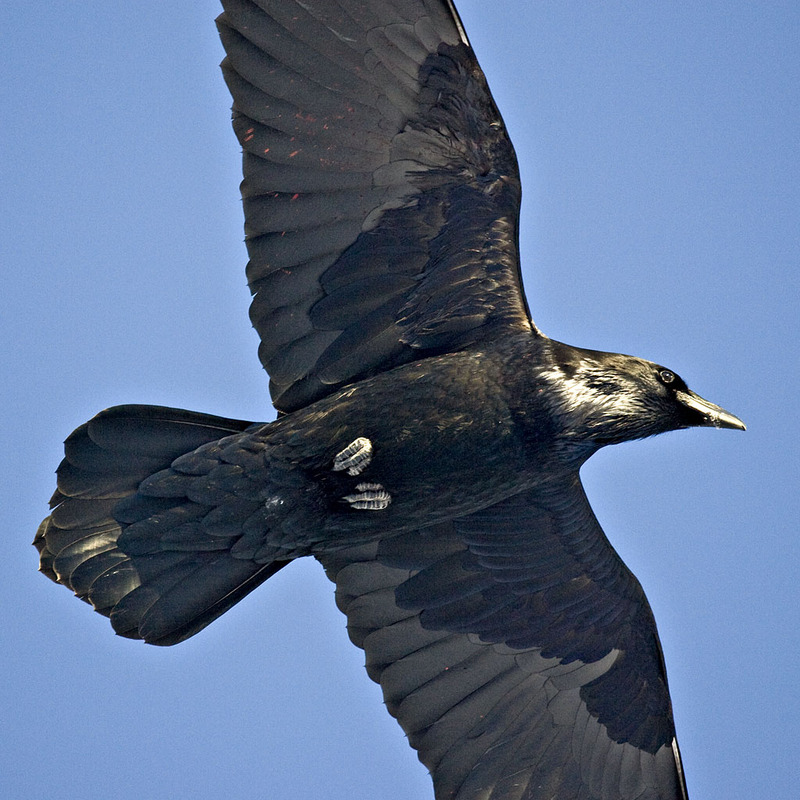 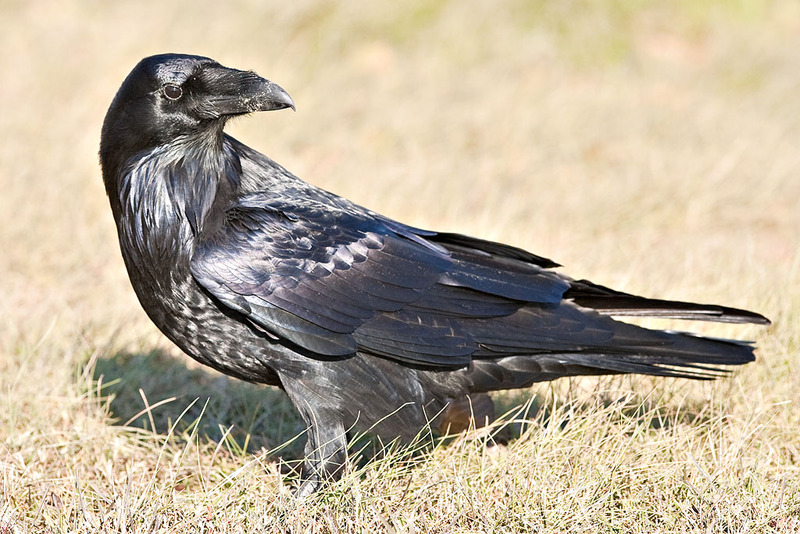 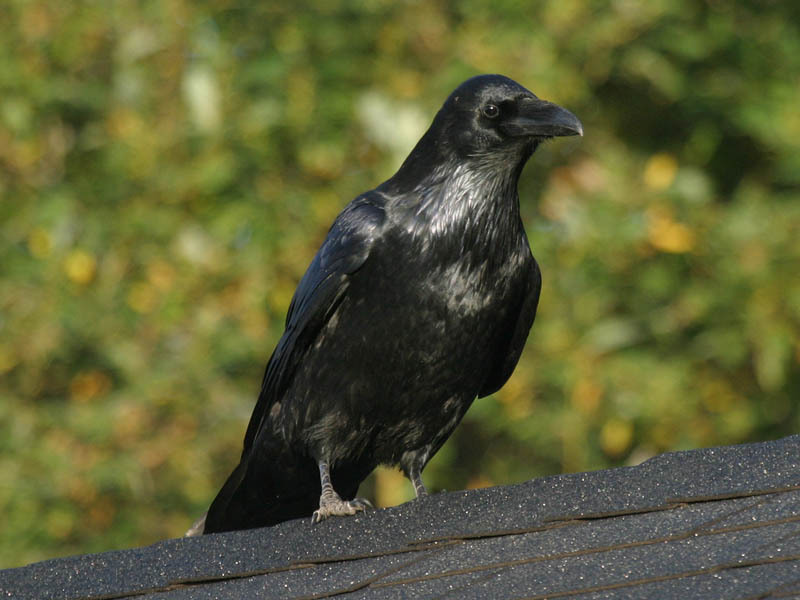 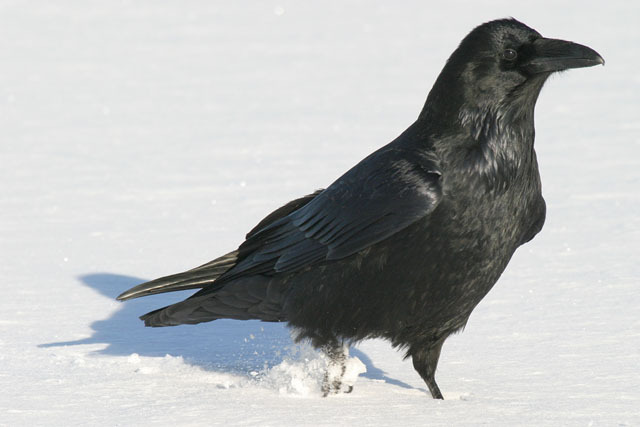 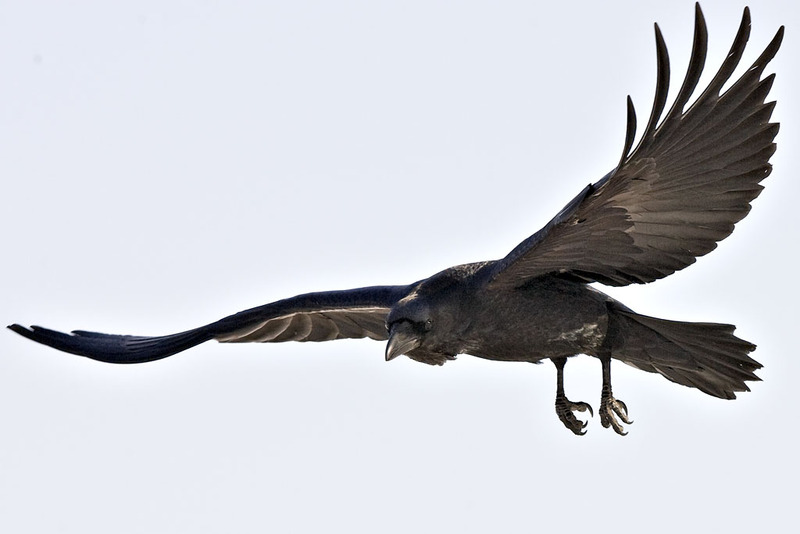 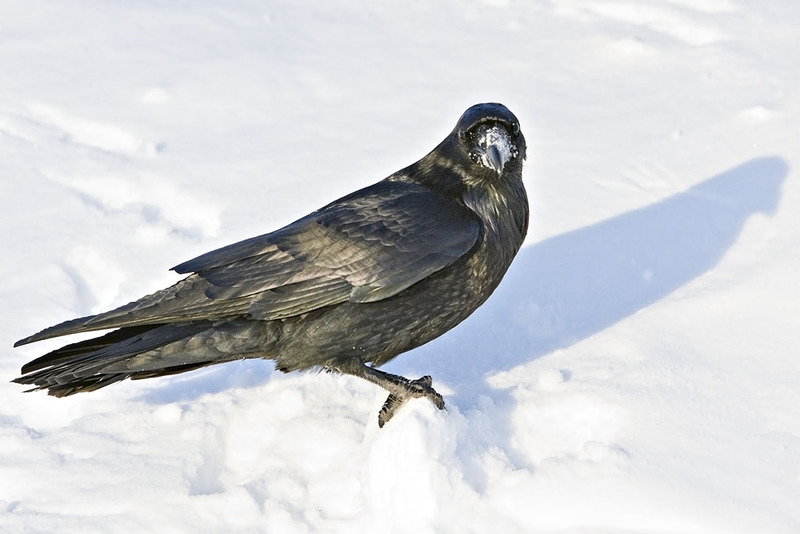 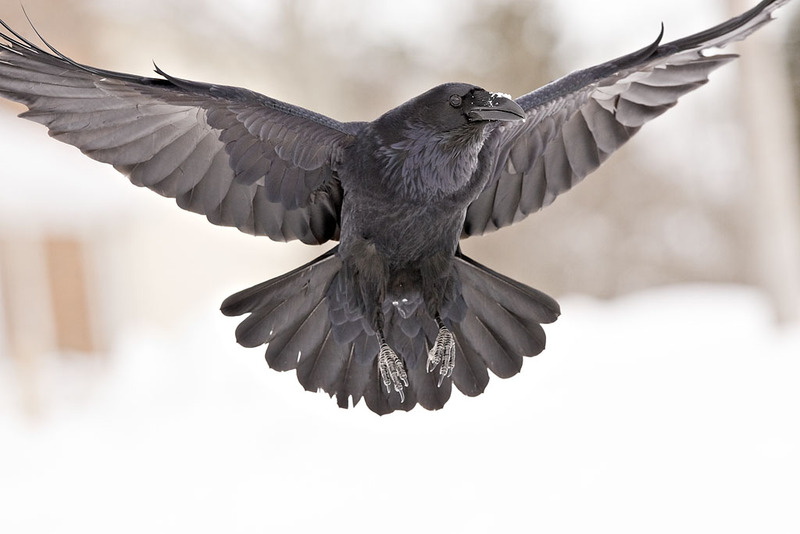 Compared to crows, ravens are much larger birds that generally make lower toned sounds (crows "caw", ravens "rack"). 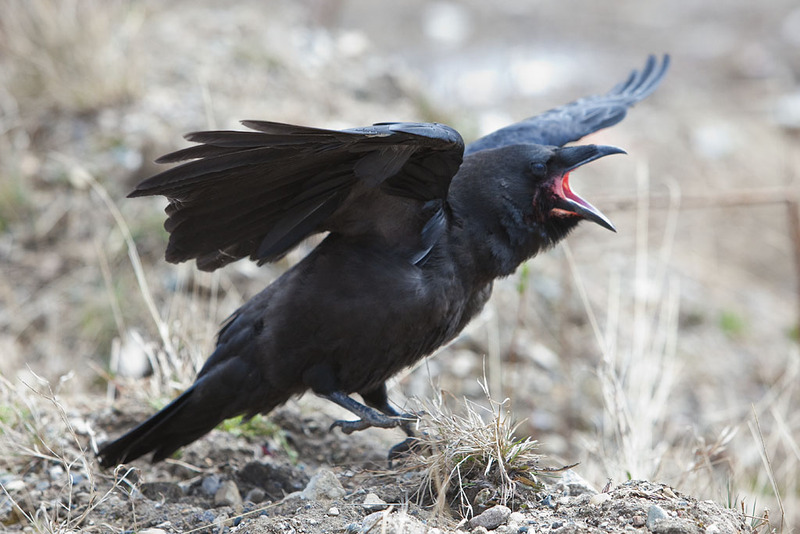 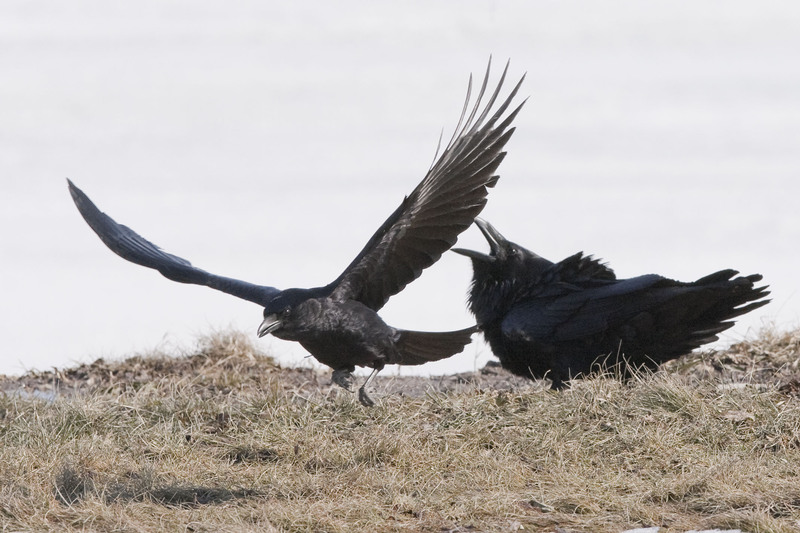 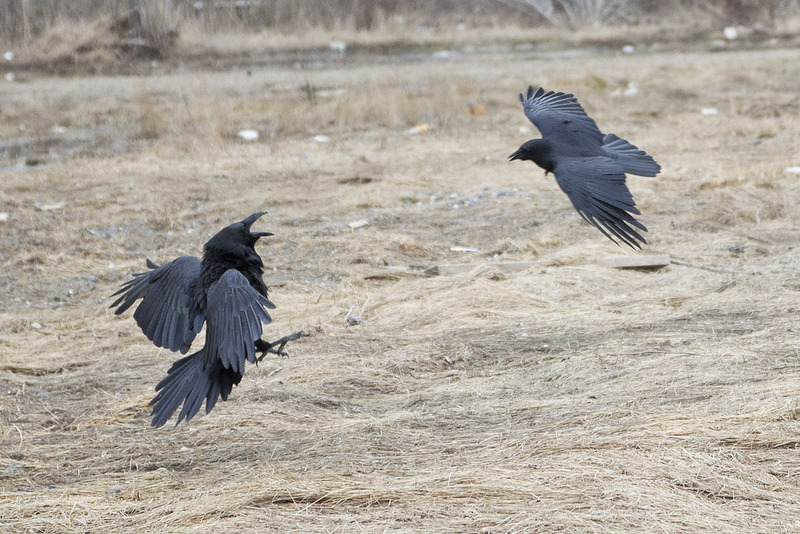 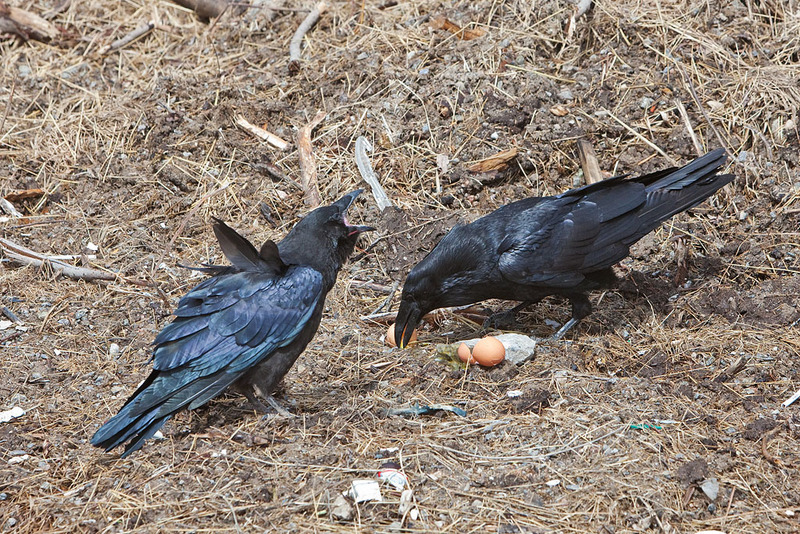 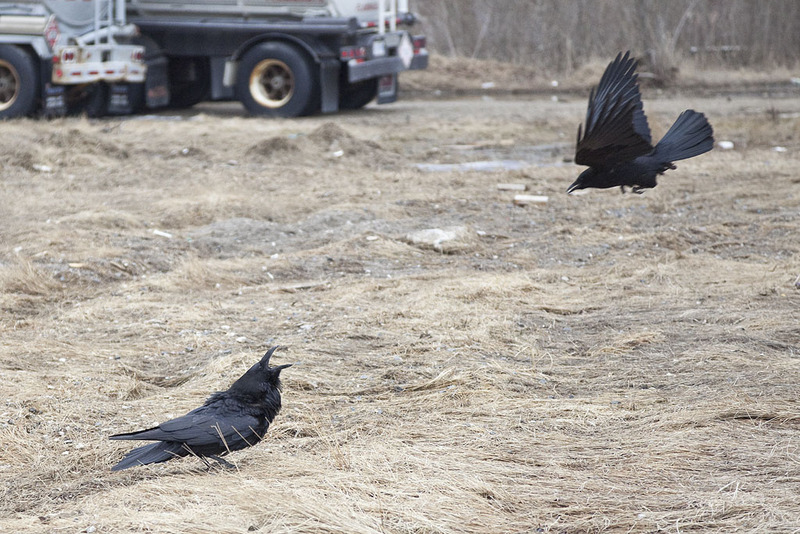 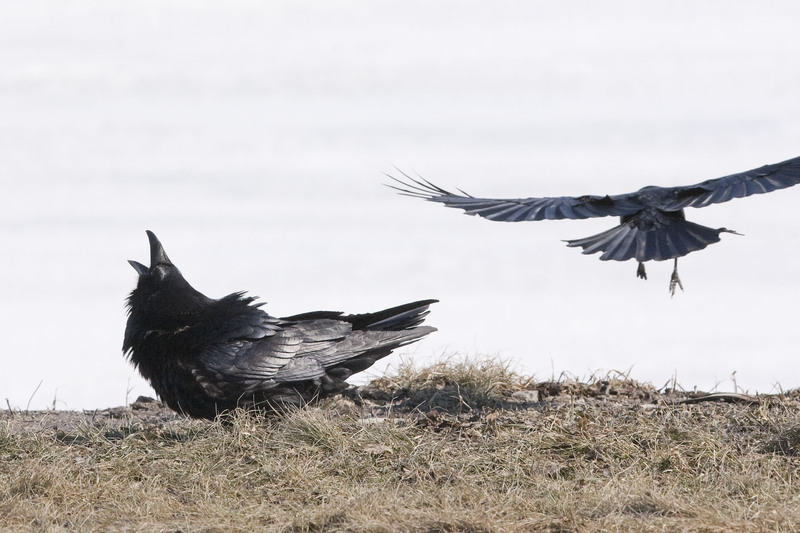 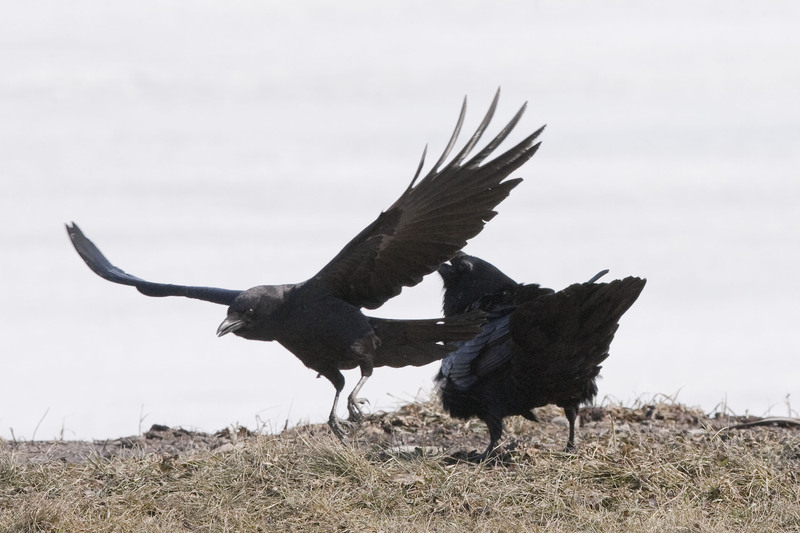 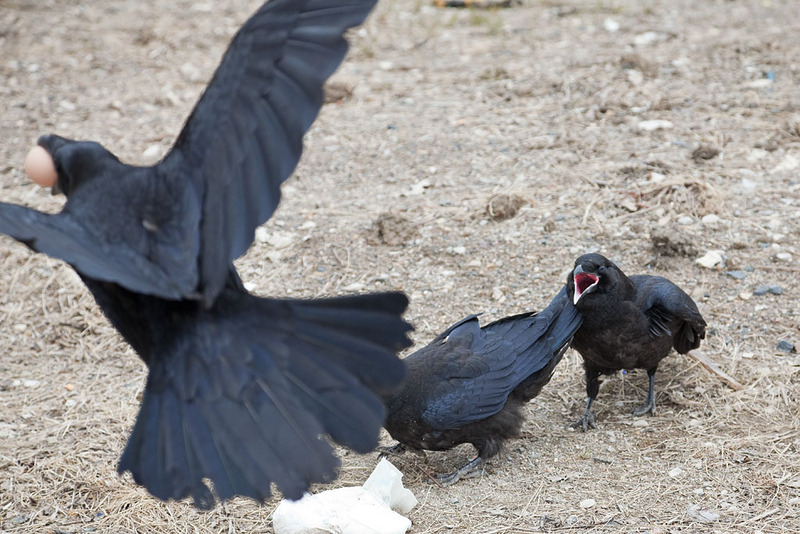 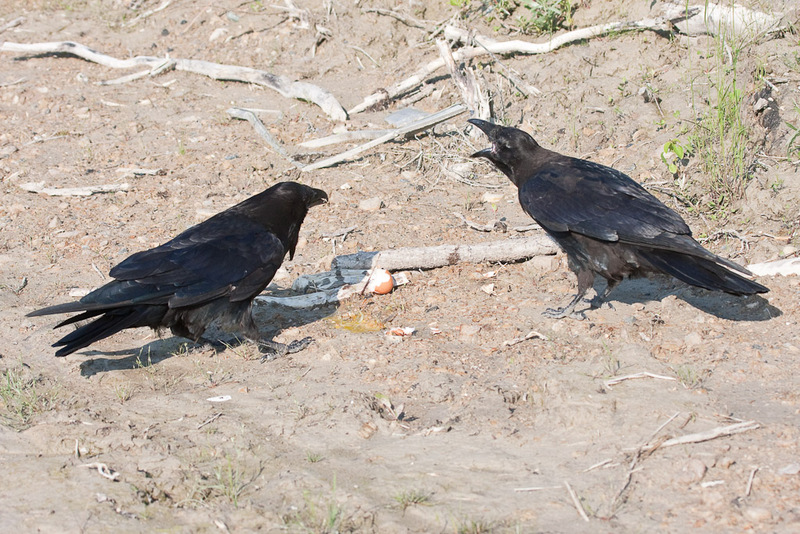 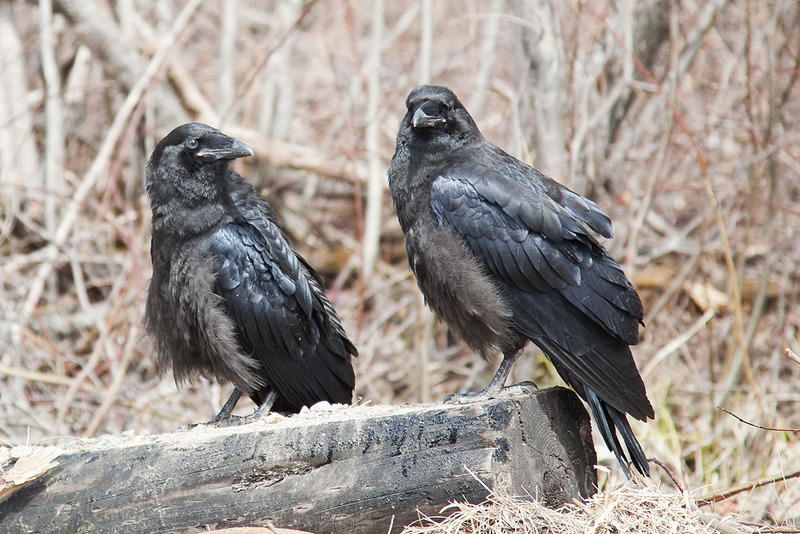 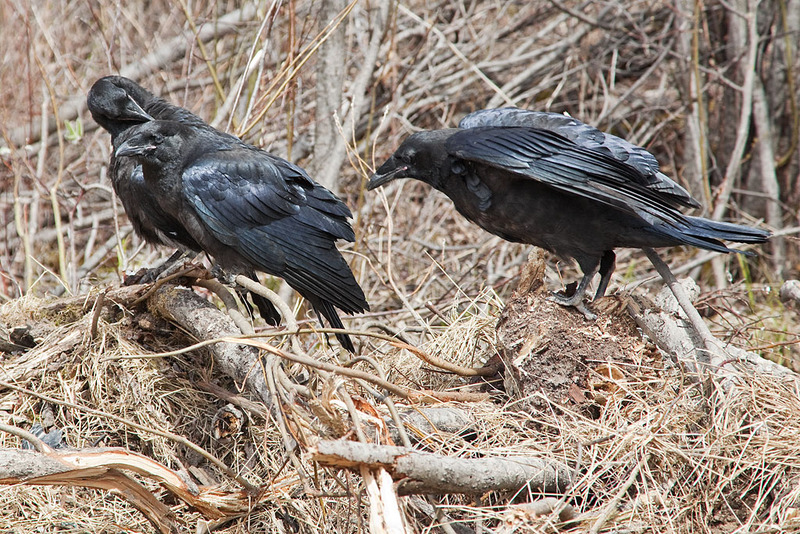 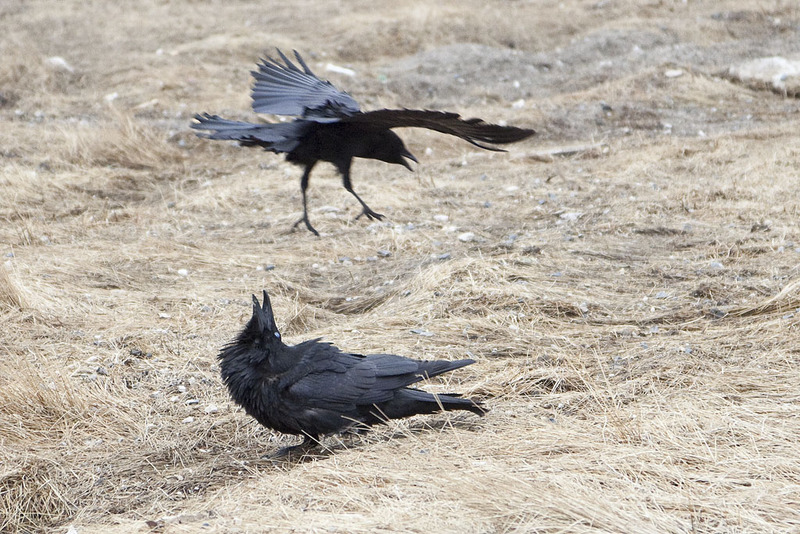 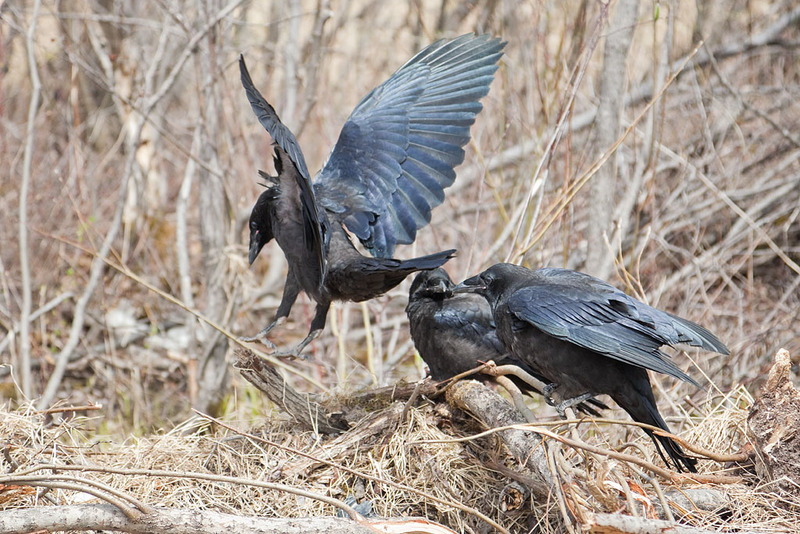 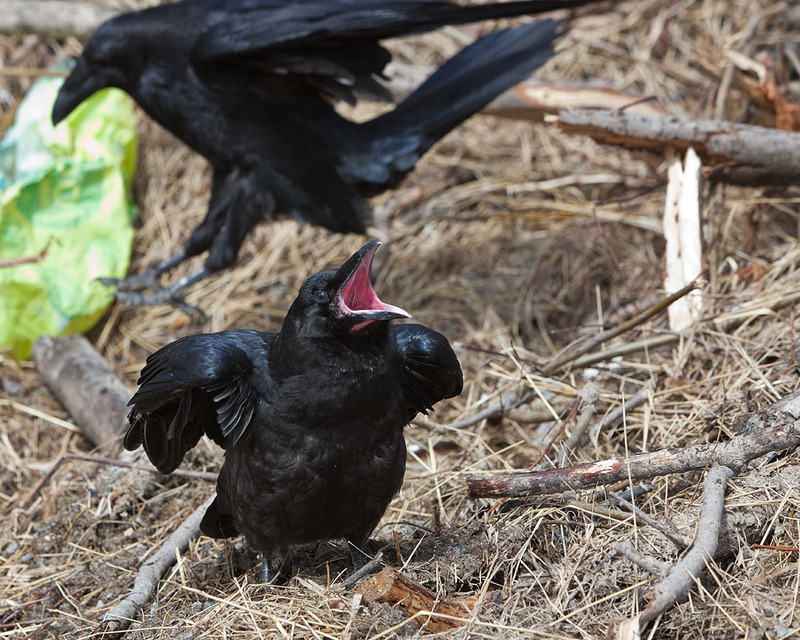 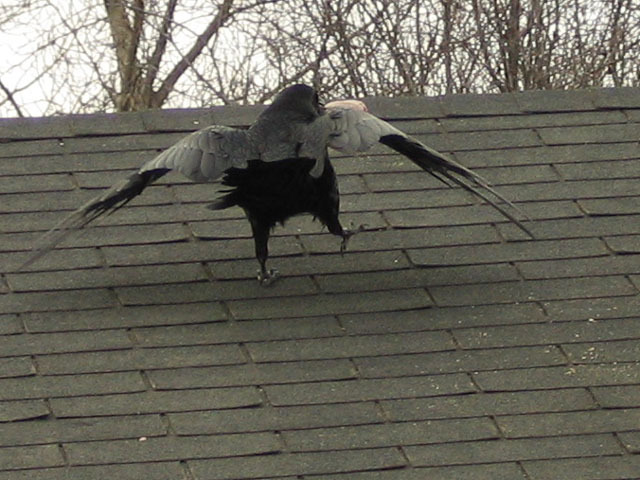 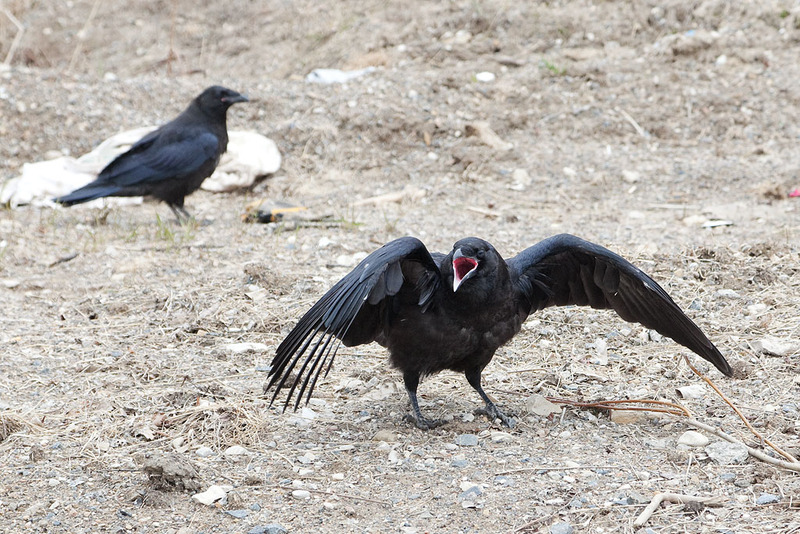 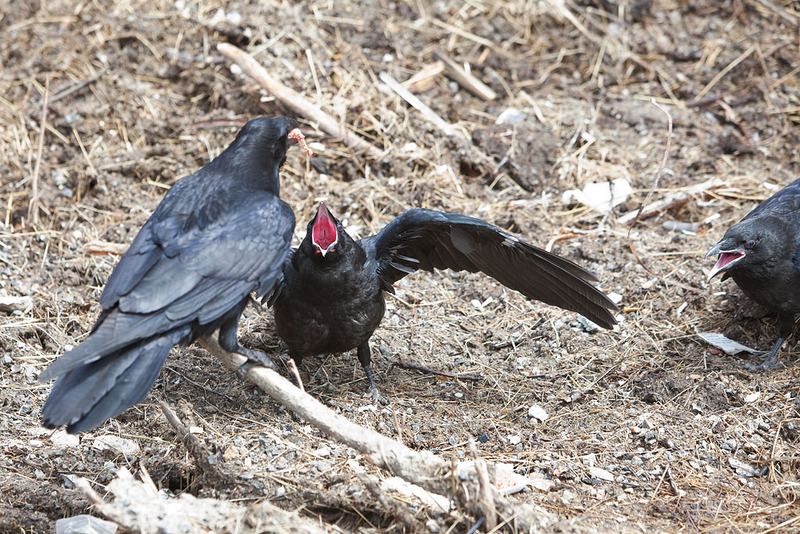 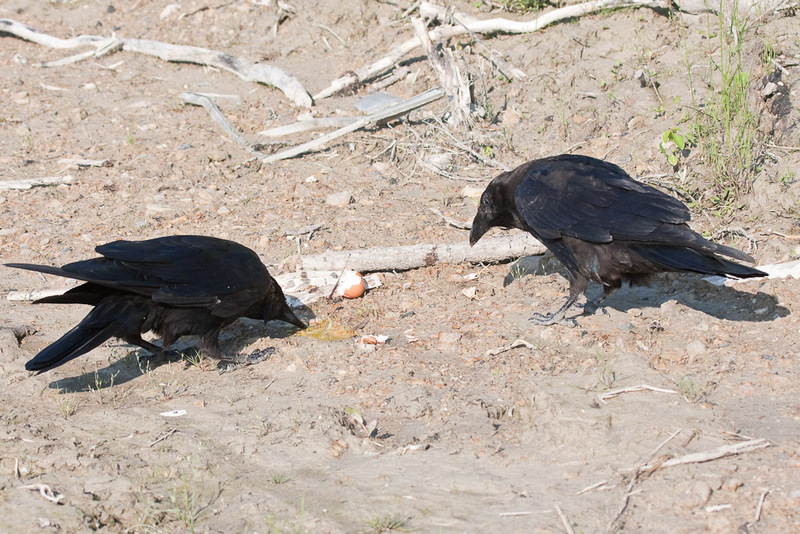 Ravens and crows often display a marked distaste for each other and harrassment of ravens by crows is quite common. 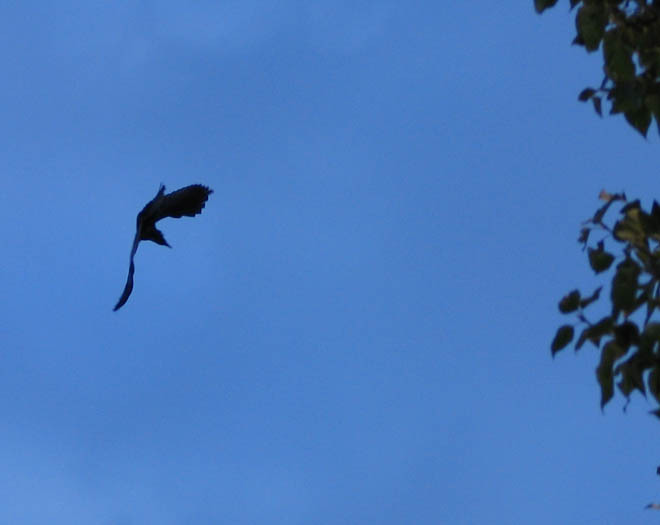 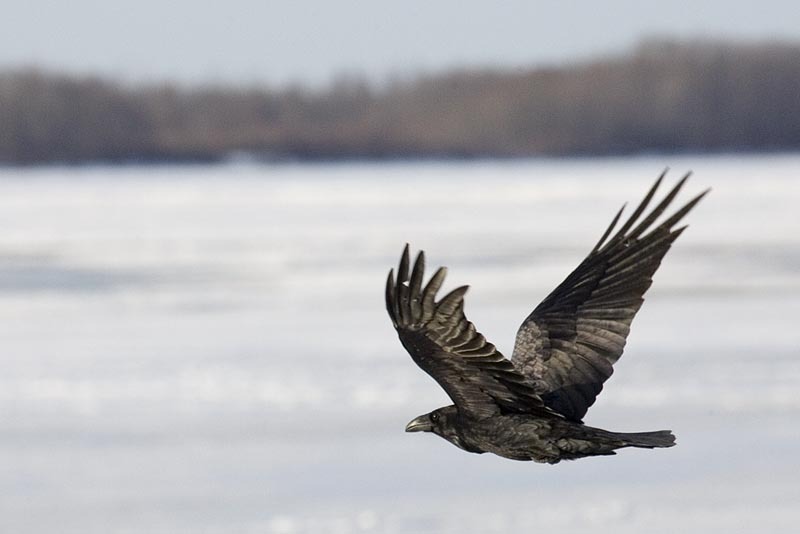 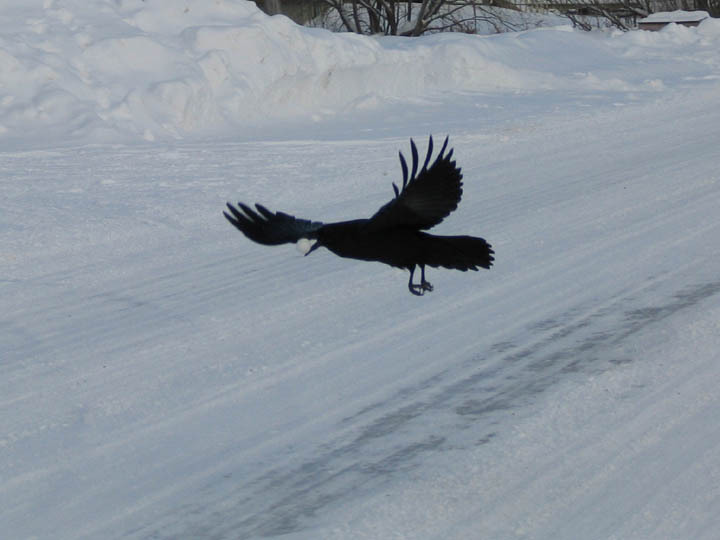 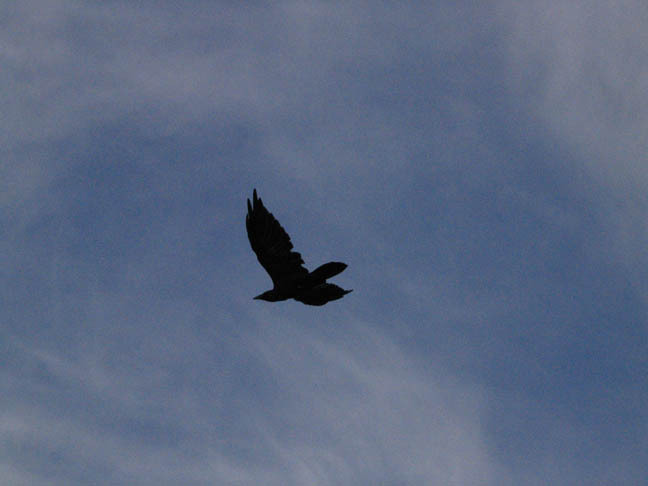 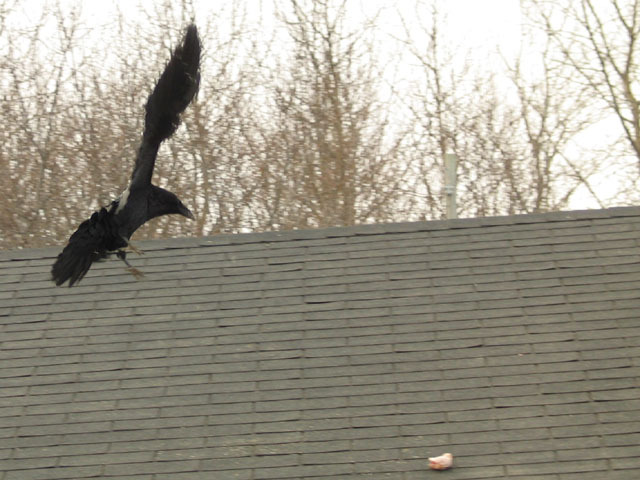 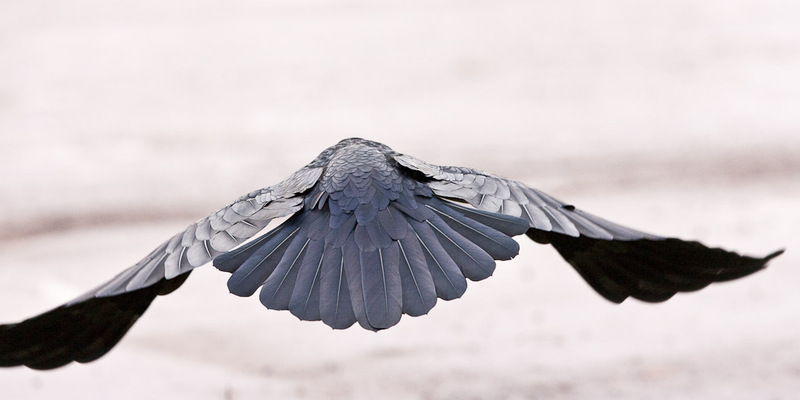 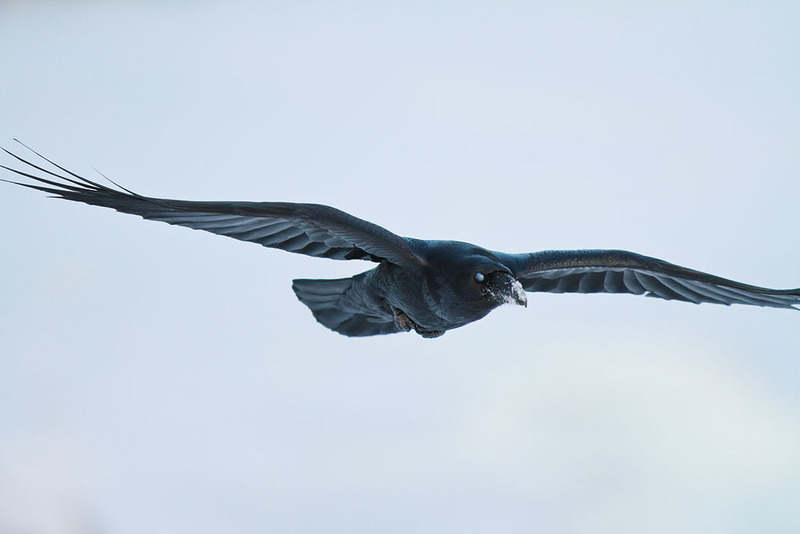 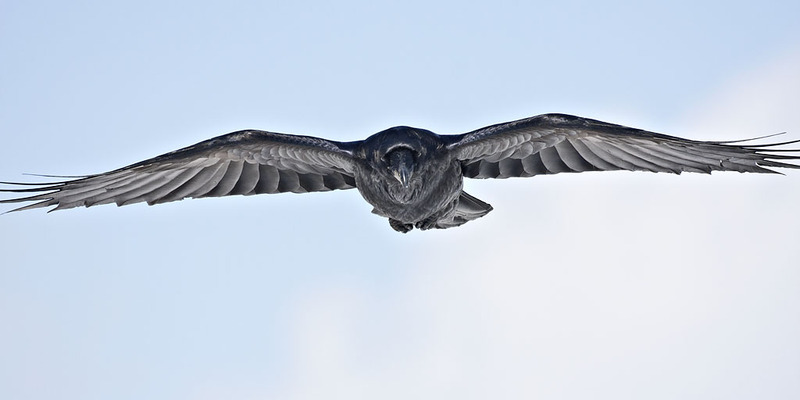 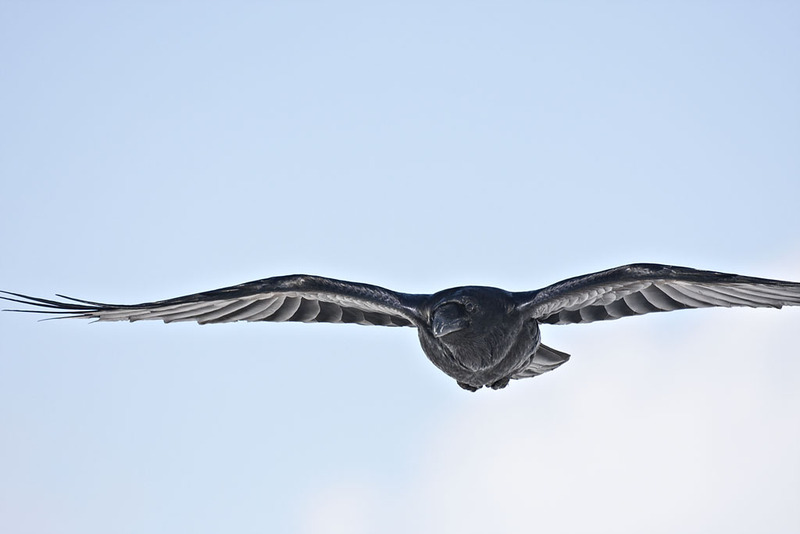 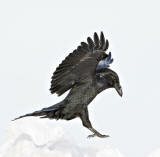 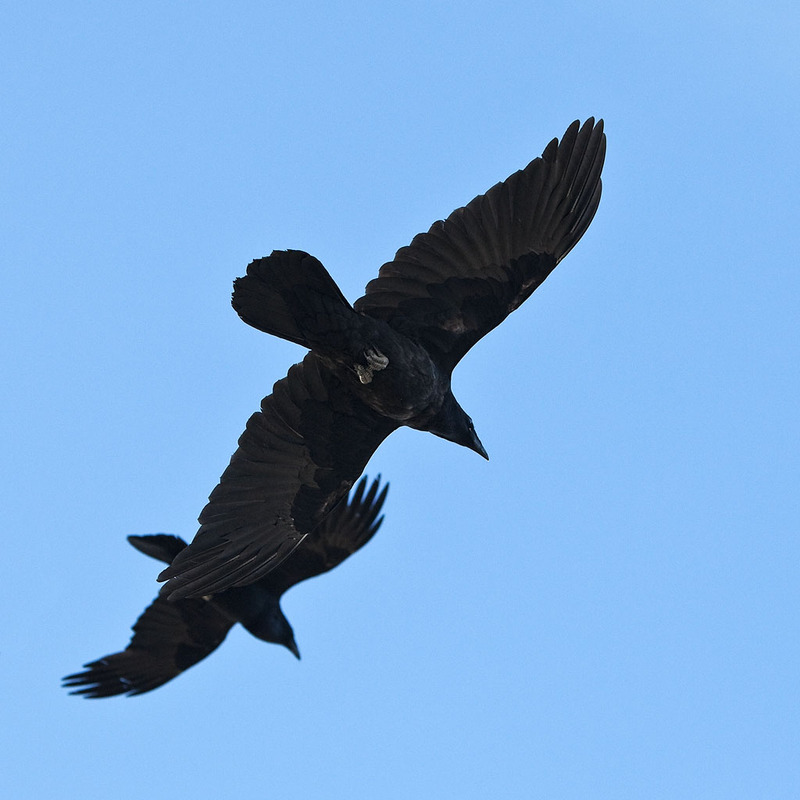 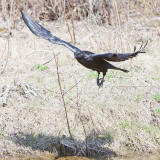 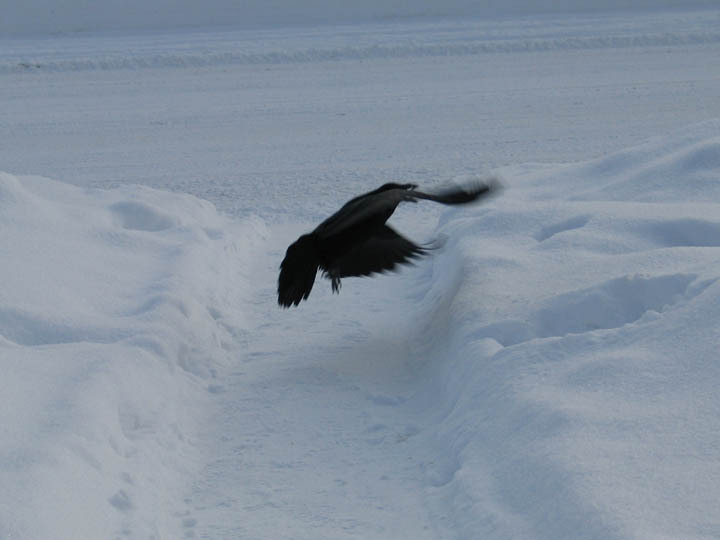 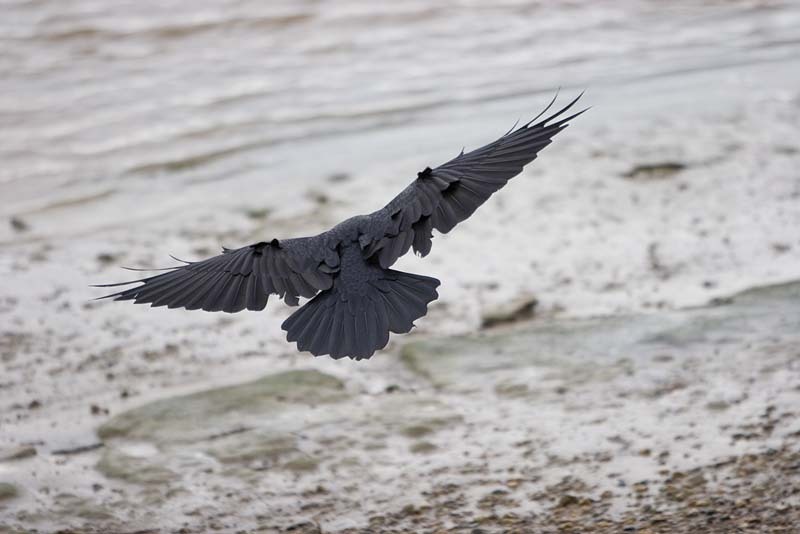 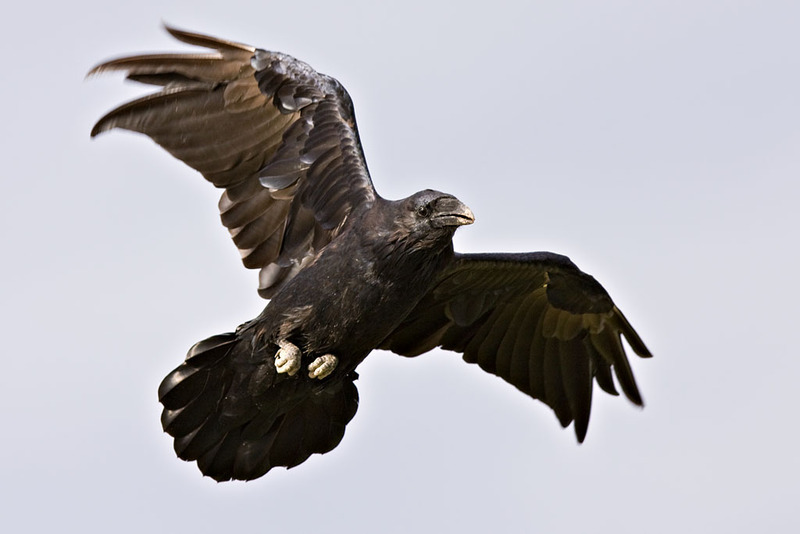 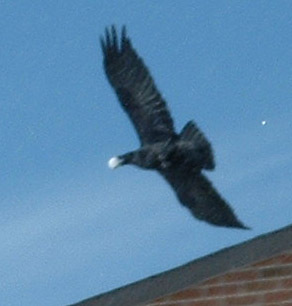 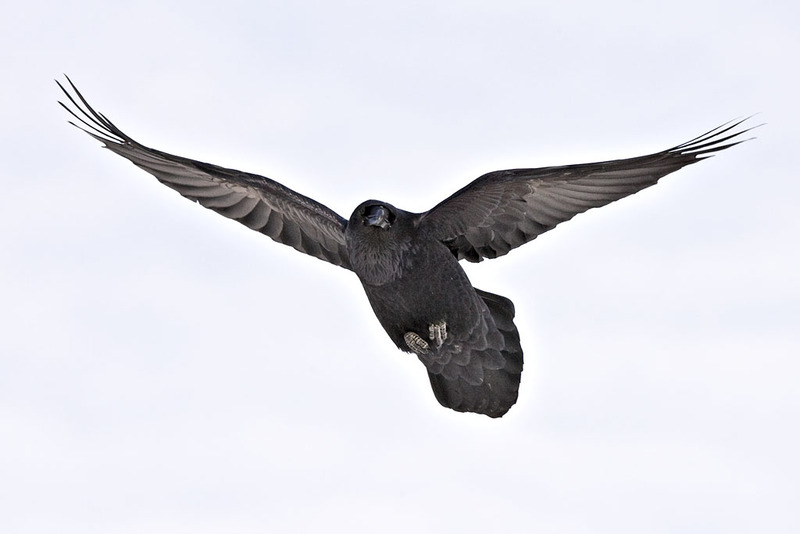 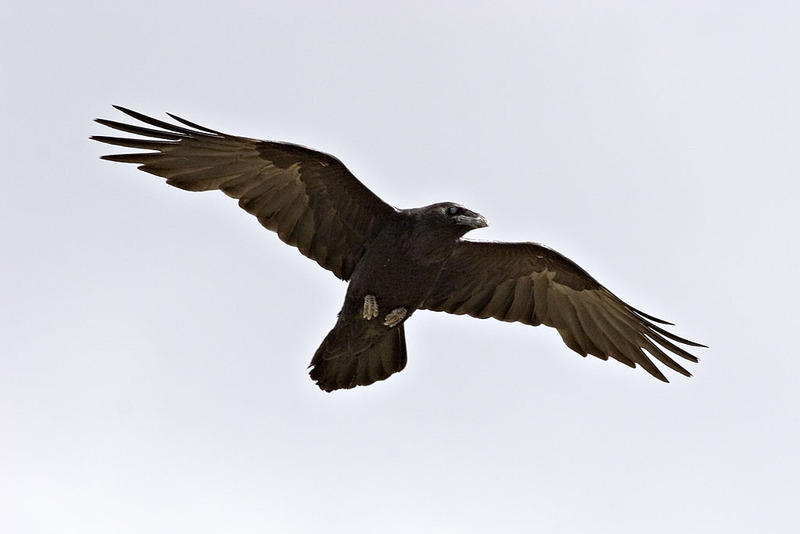 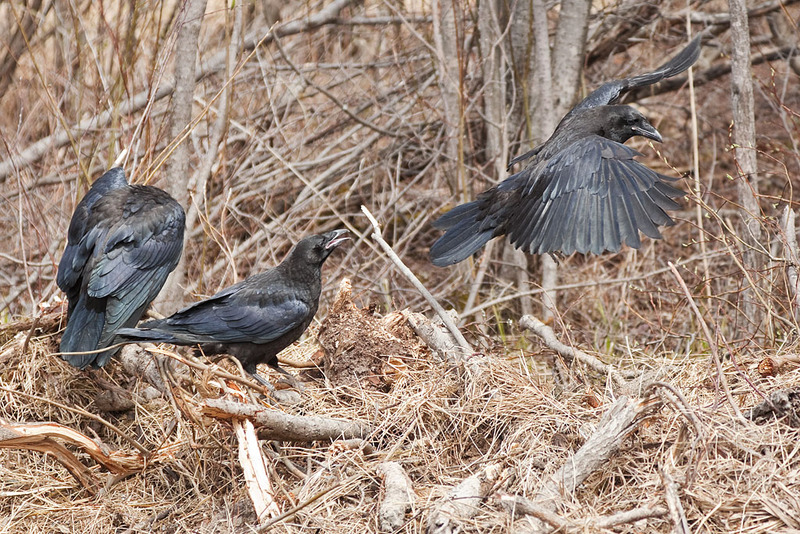 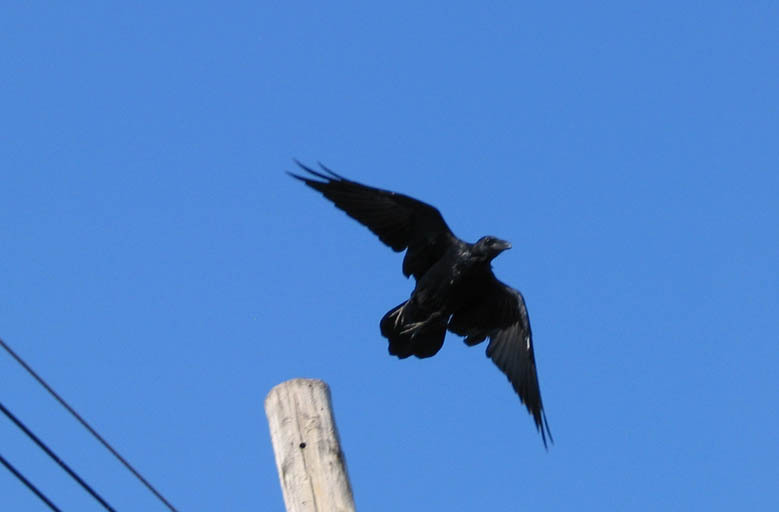 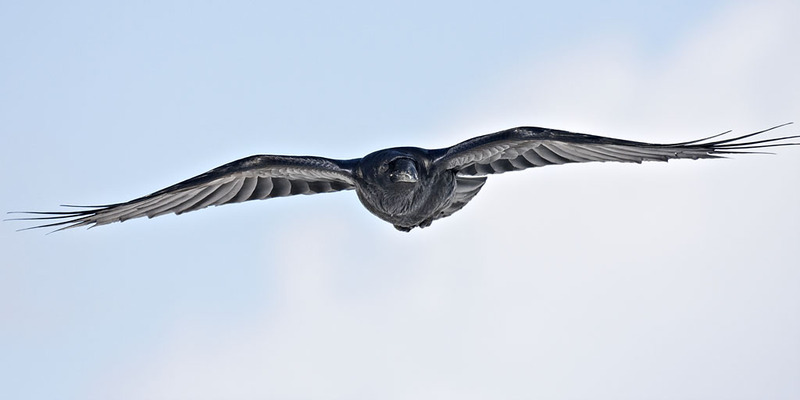 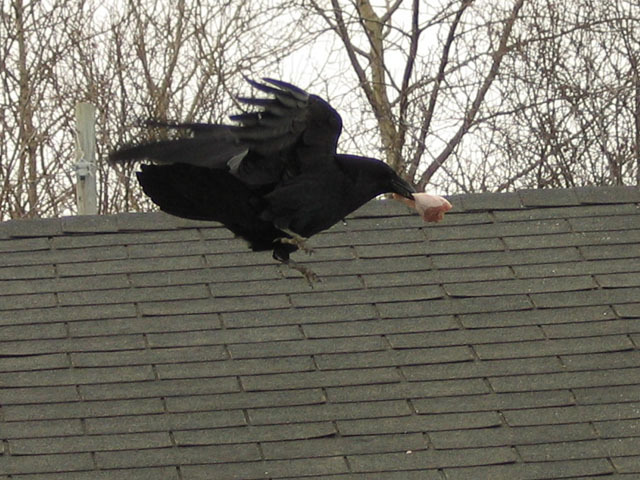 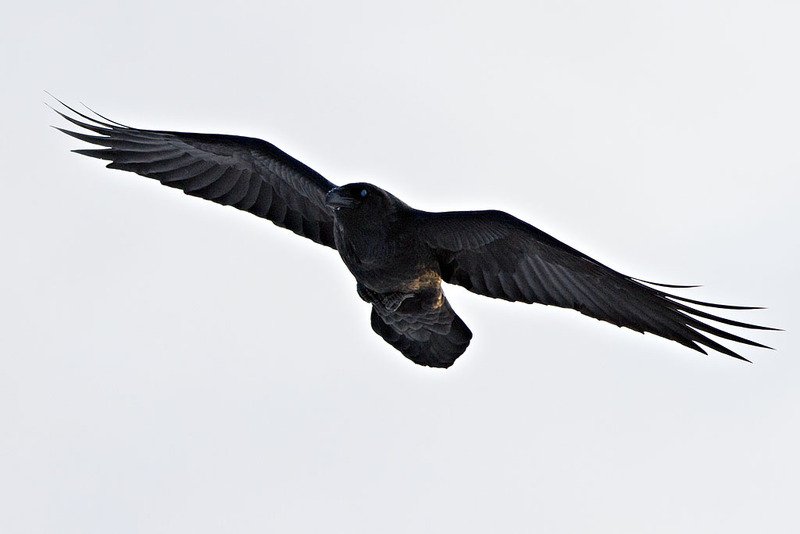 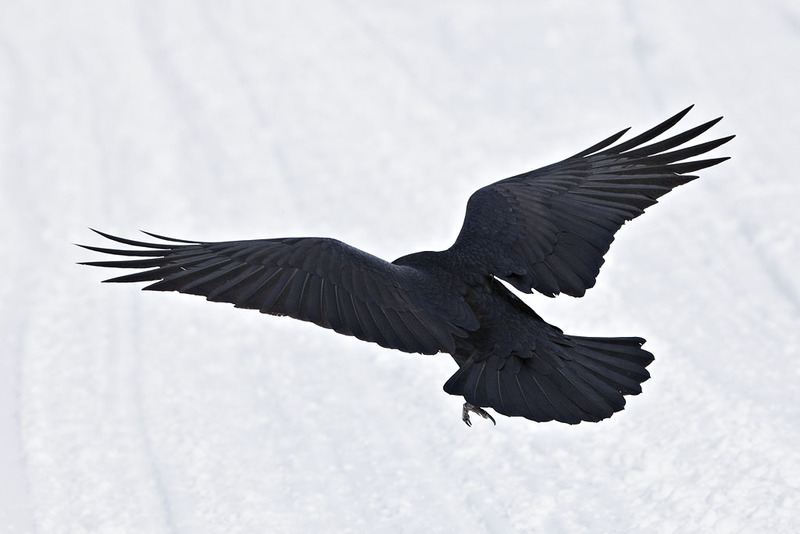 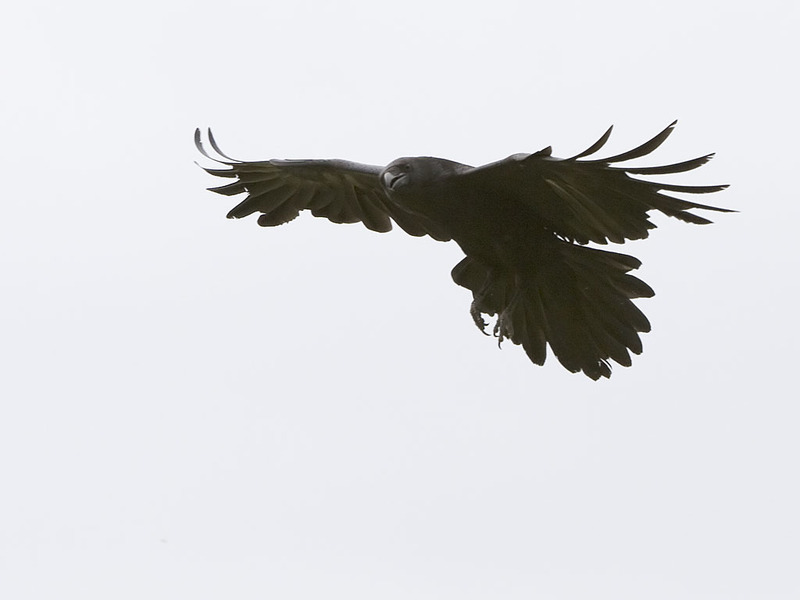 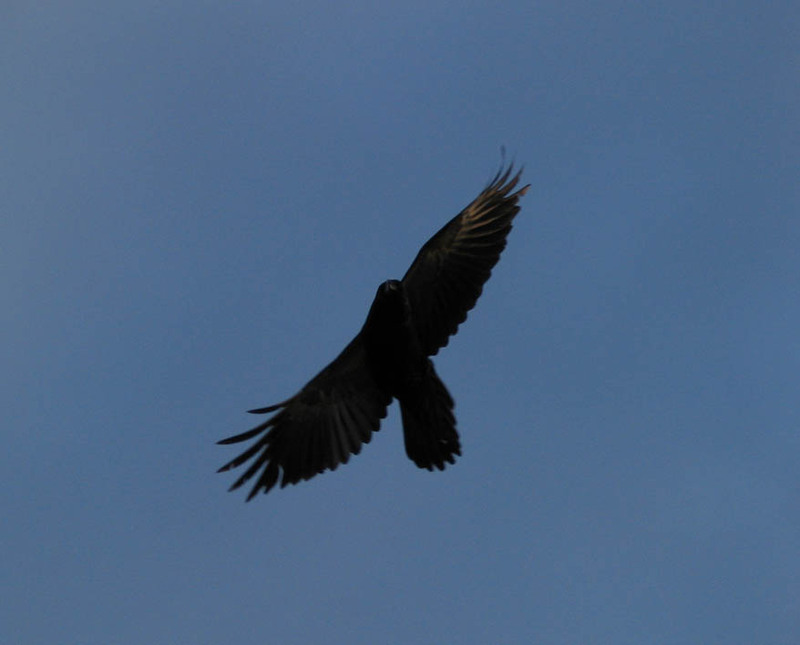 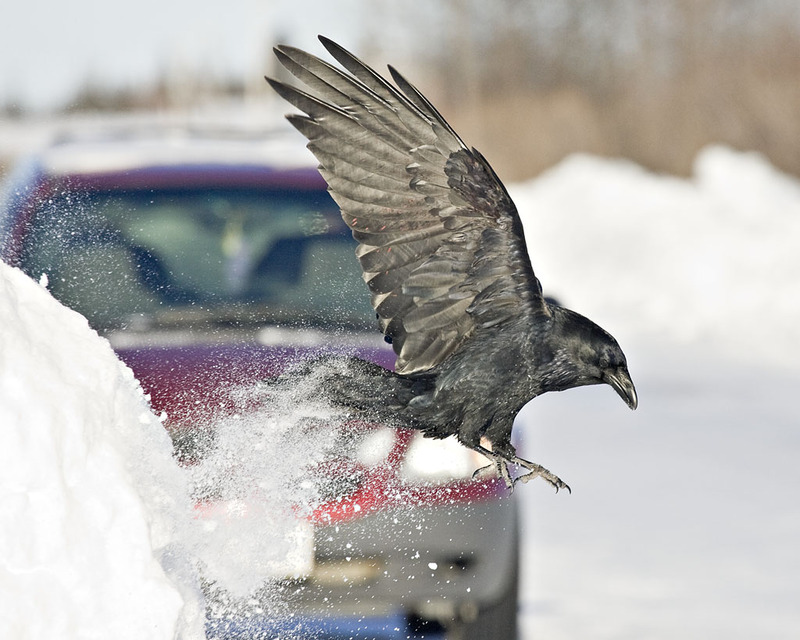 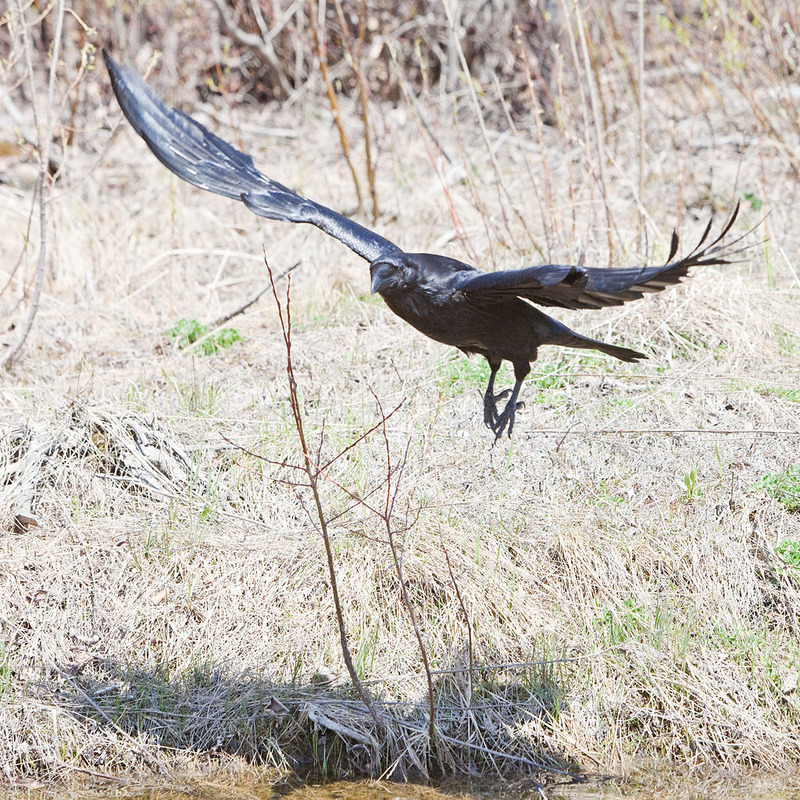 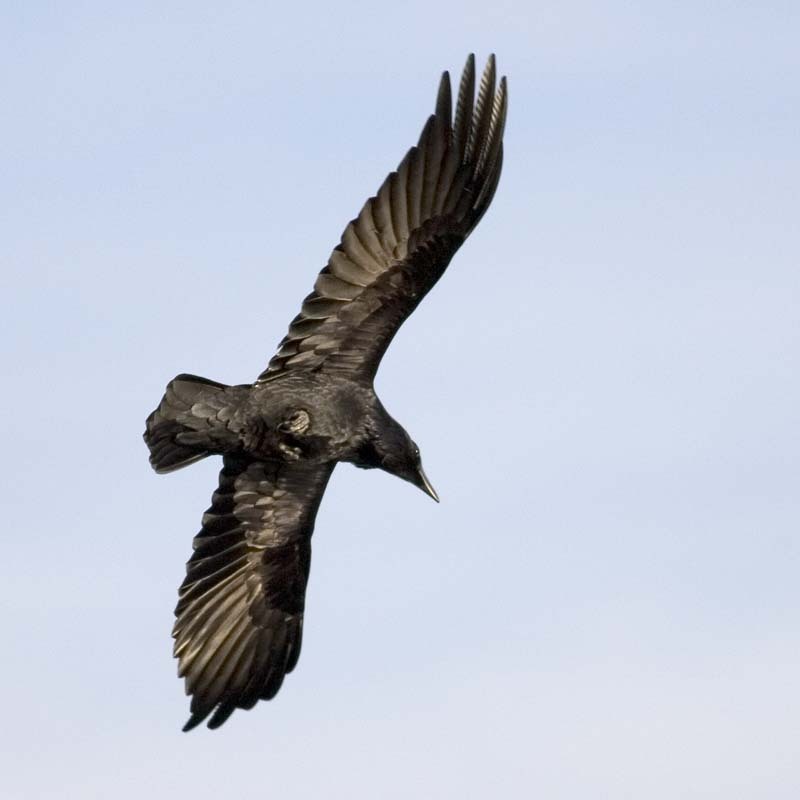 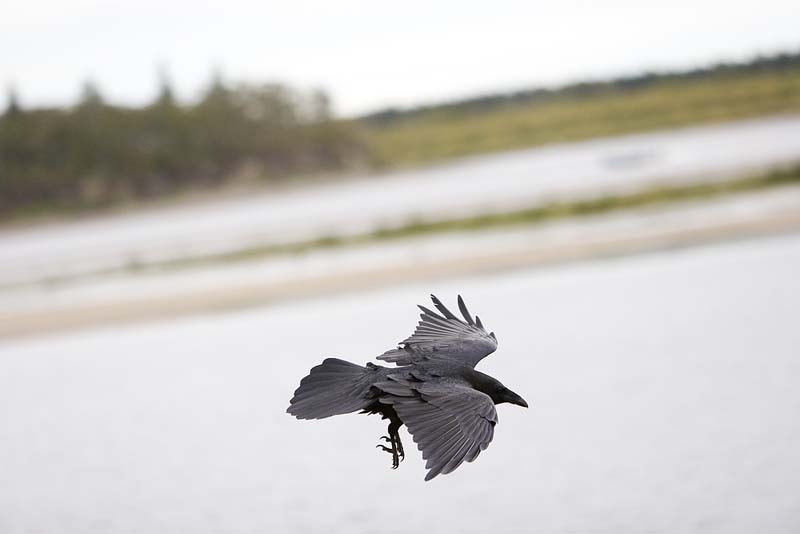 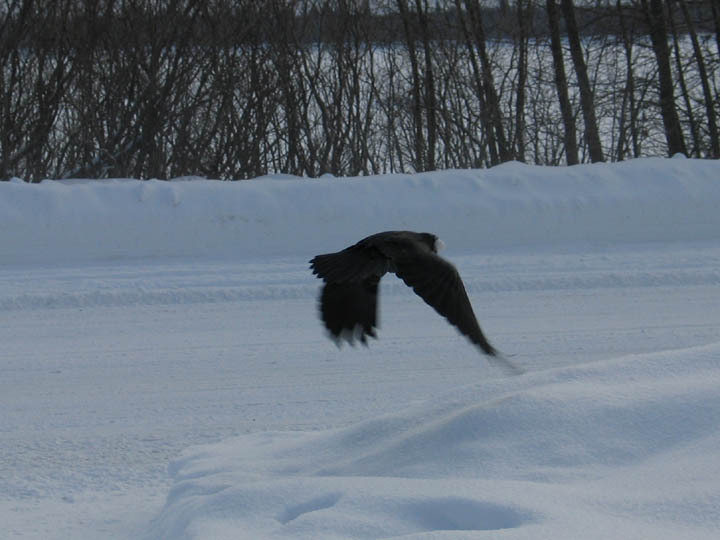 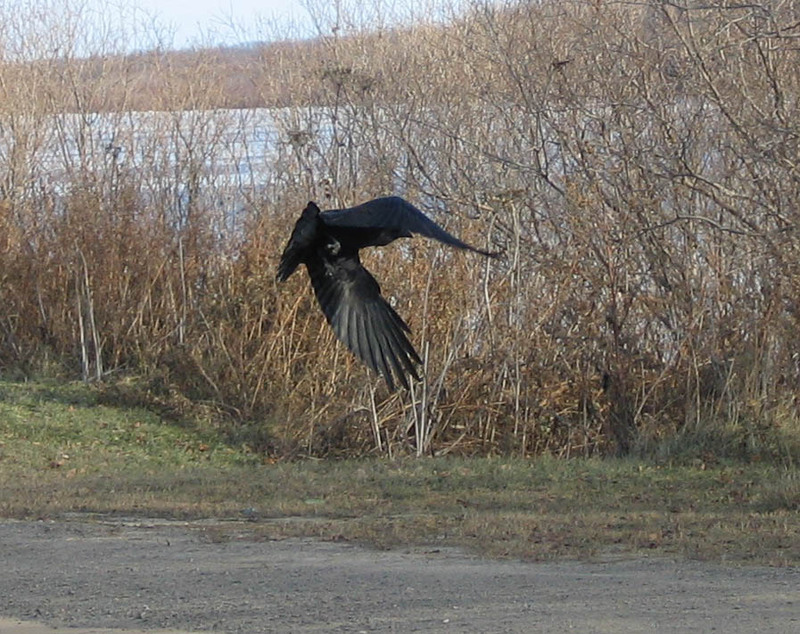 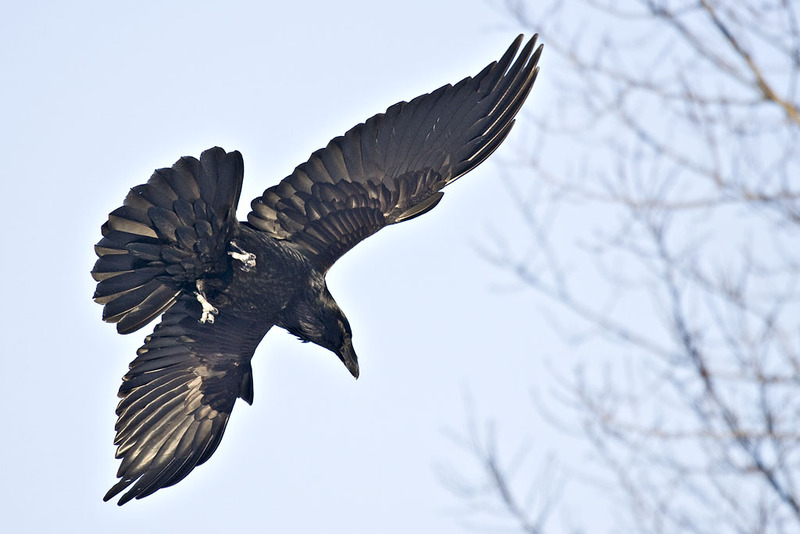 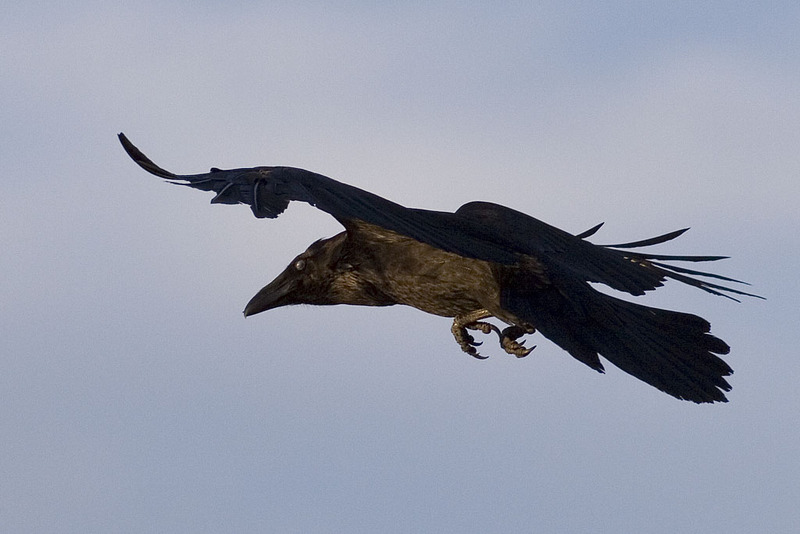 Some of the images here show Ravens in flight. 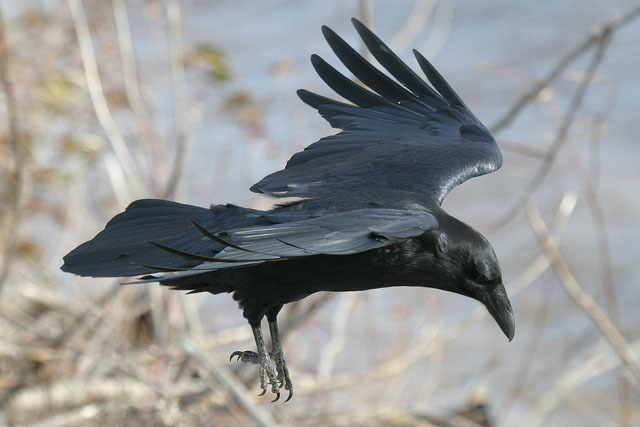 I find the wide range of shapes they take while flying endlessly fascinating, especially when they are moving around buildings, trees and other objects. based on one of mine. 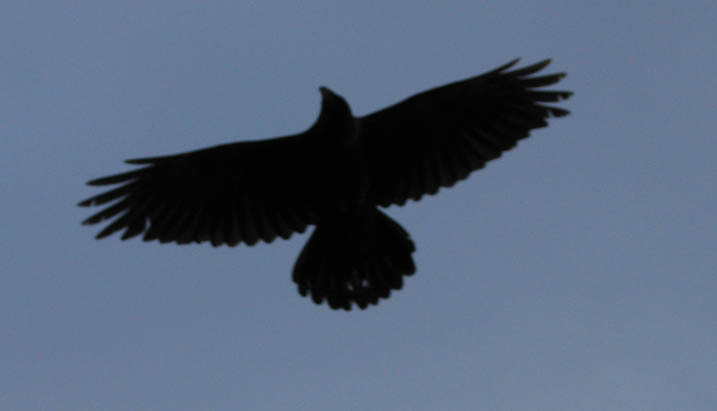 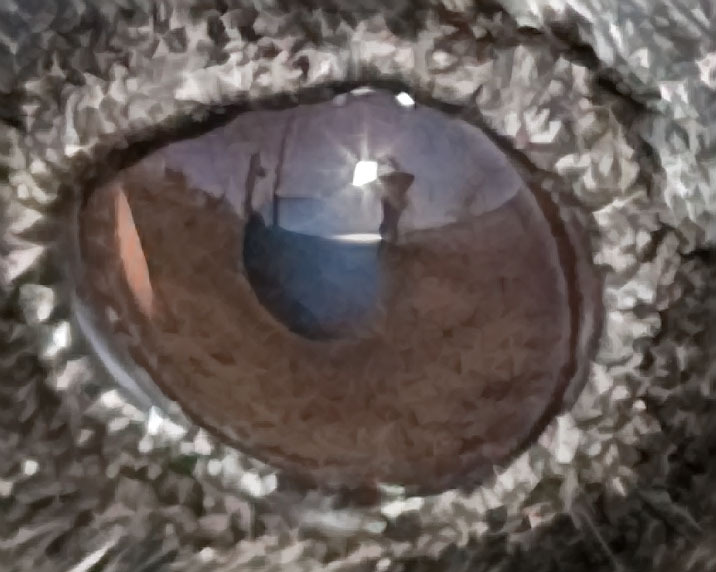 in the picture below the Raven is the bird on the right. 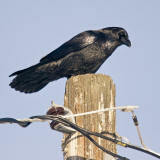 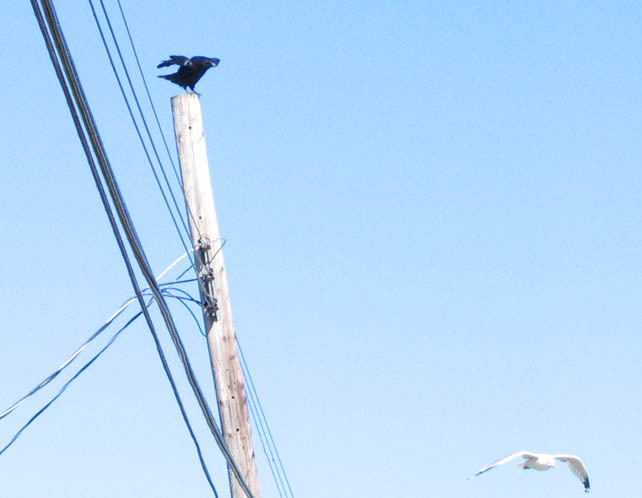 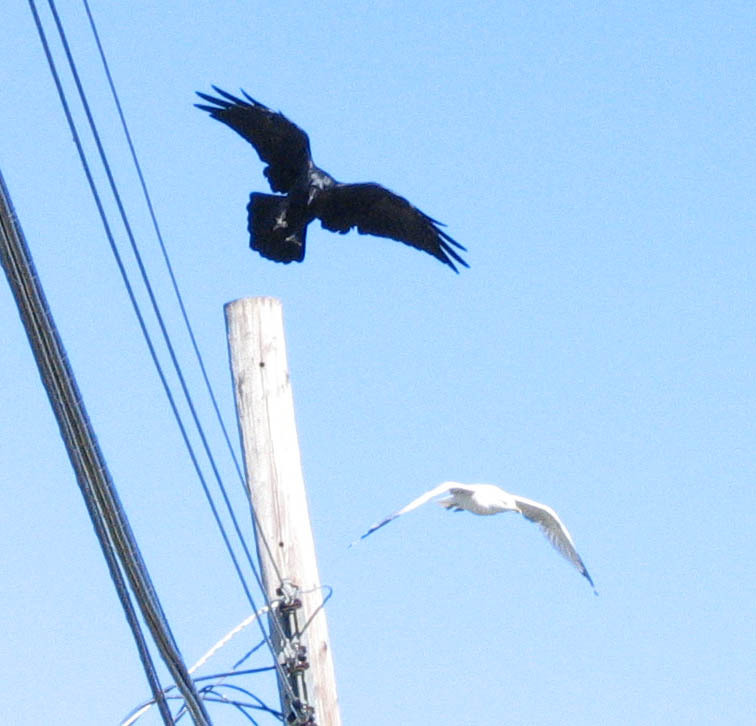 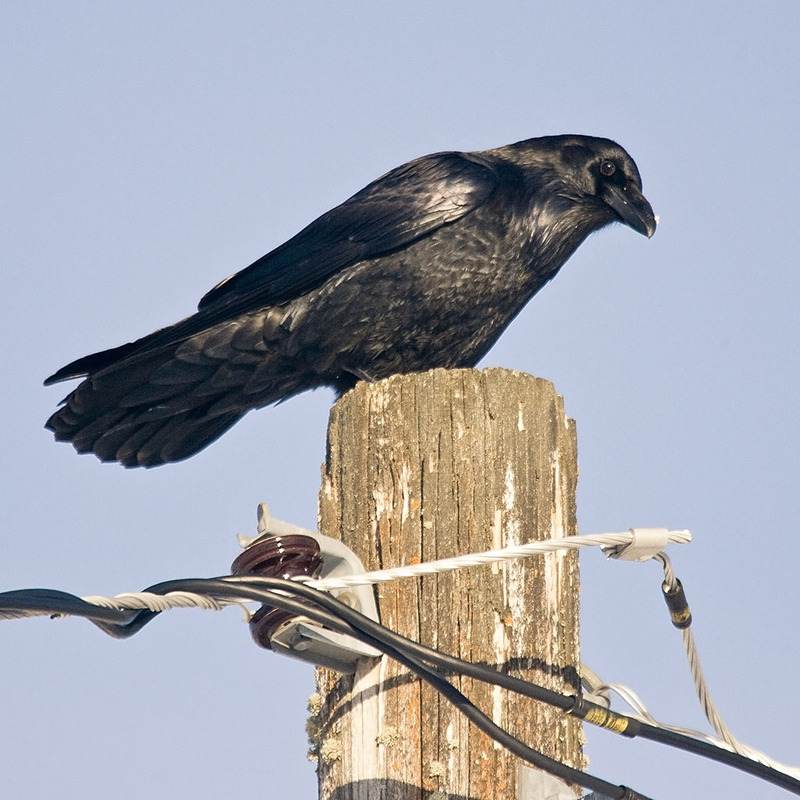 Ravens don't like gulls.....Stay off my pole! 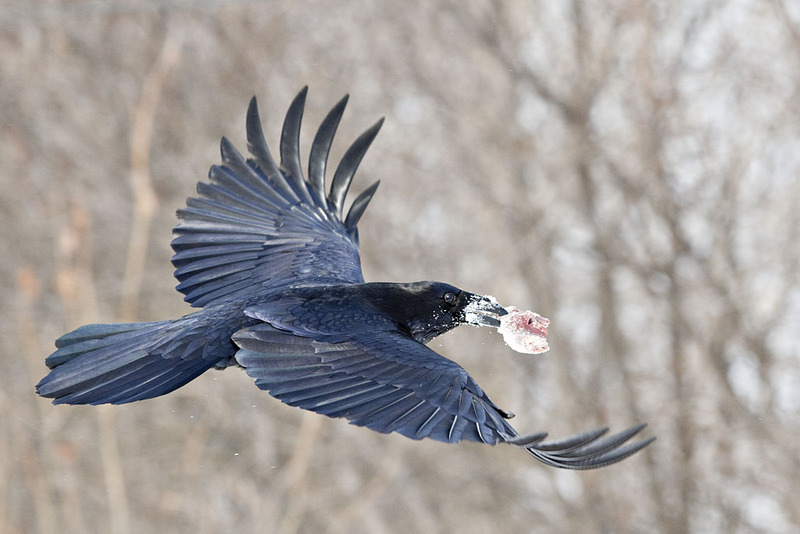 Many of the pictures on this page show birds eating or taking food while being photographed. 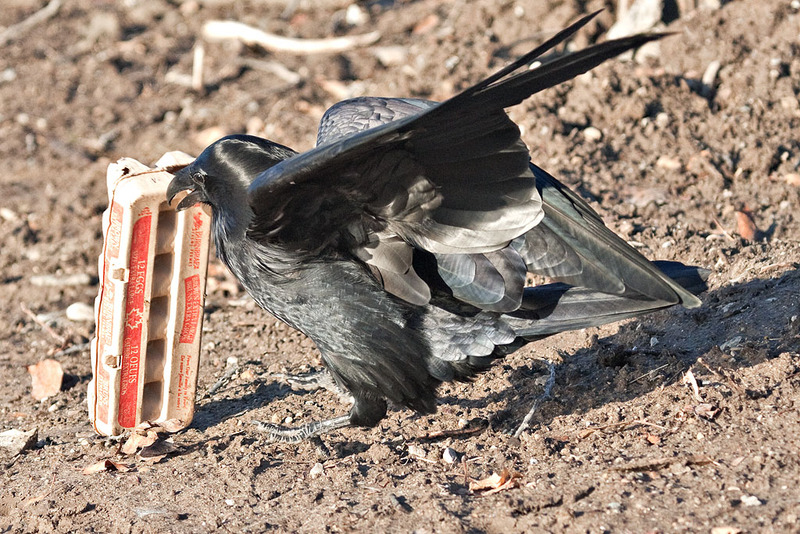 This seems a fair trade but it is generally a good idea to only feed birds around your own home and to do so on a consistent basis.